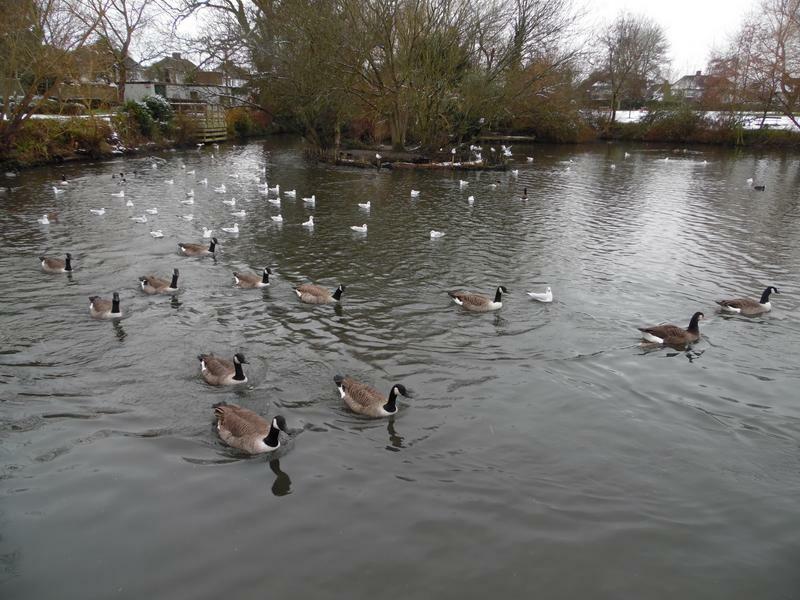 10th January 2016, usual mix of hungry ducks, geese and sea gulls. 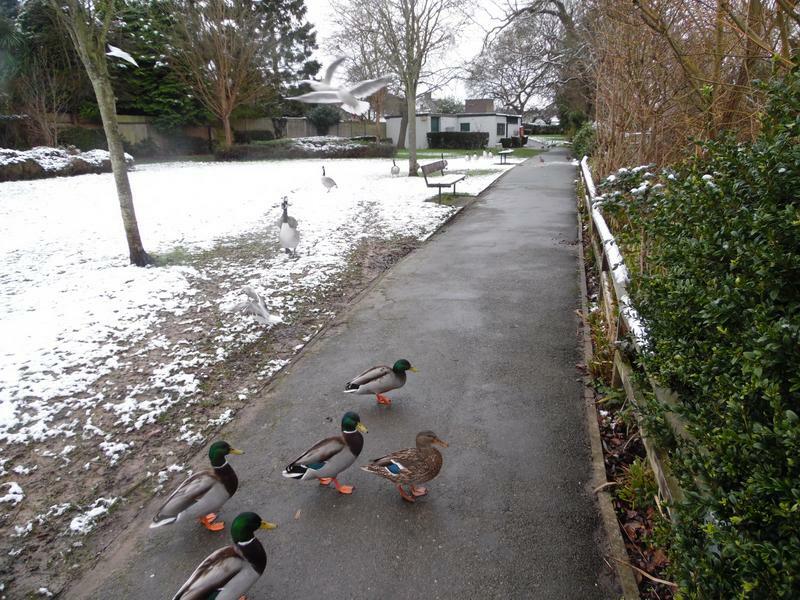 17th January 2016, this was about the heaviest snow in Croydon this winter. 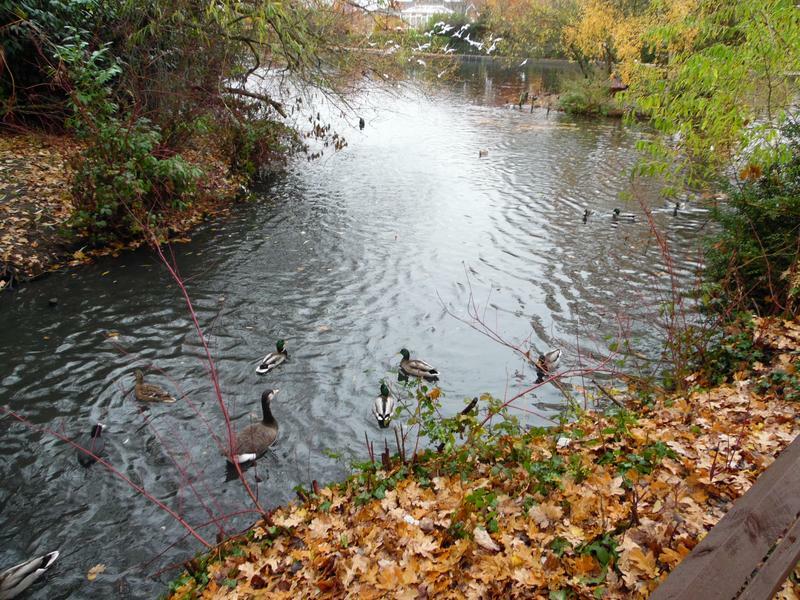 The geese don't seem to worried about cold snow. 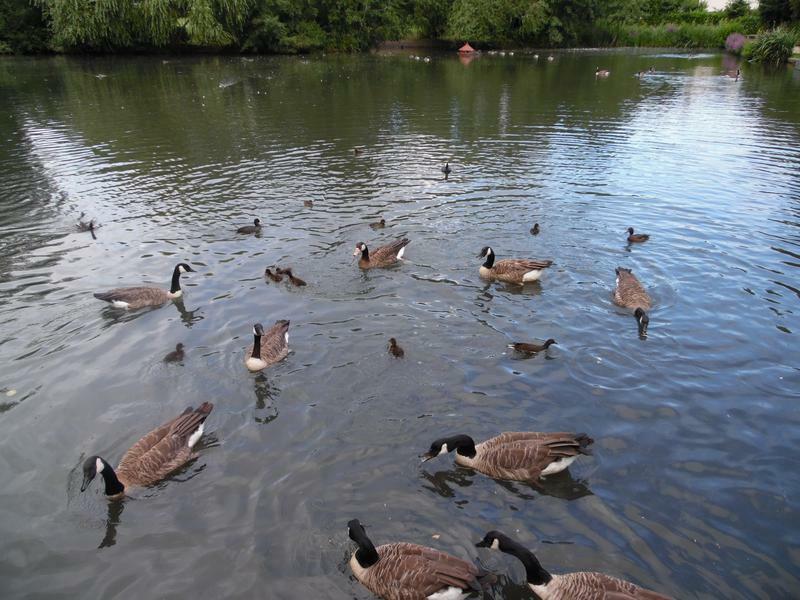 Lots of Canada Geese heading our way for food. 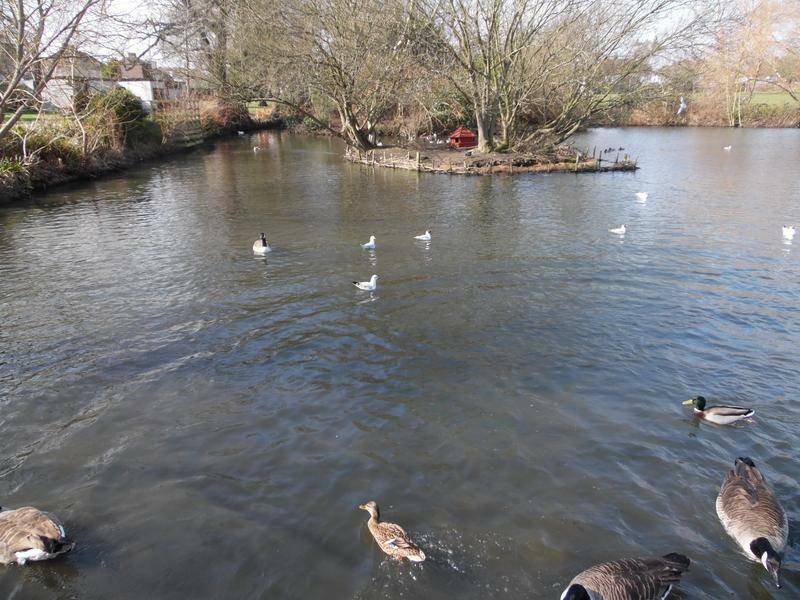 There are now much clearer views of the water behind the large island. 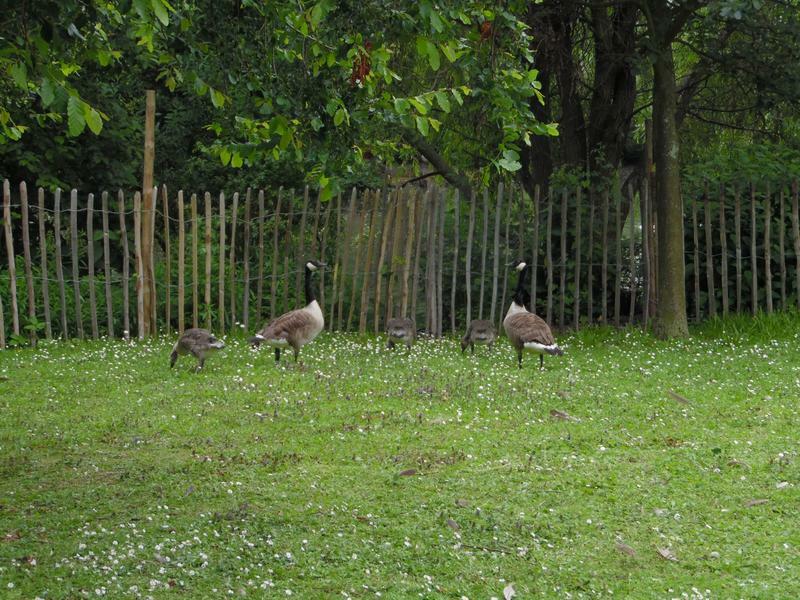 A lot of new tress have been planted around this area. 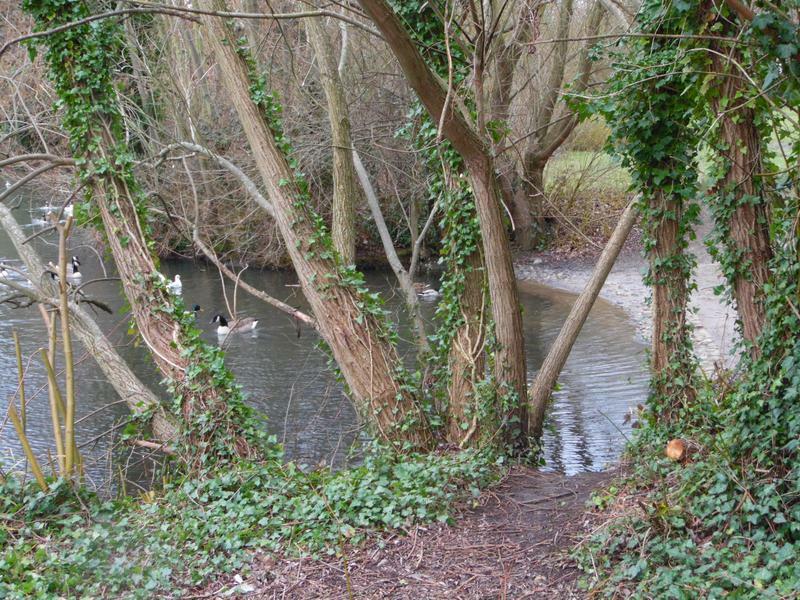 7th February 2016, the fence is not alway successful in stopping dogs getting closer to the water. 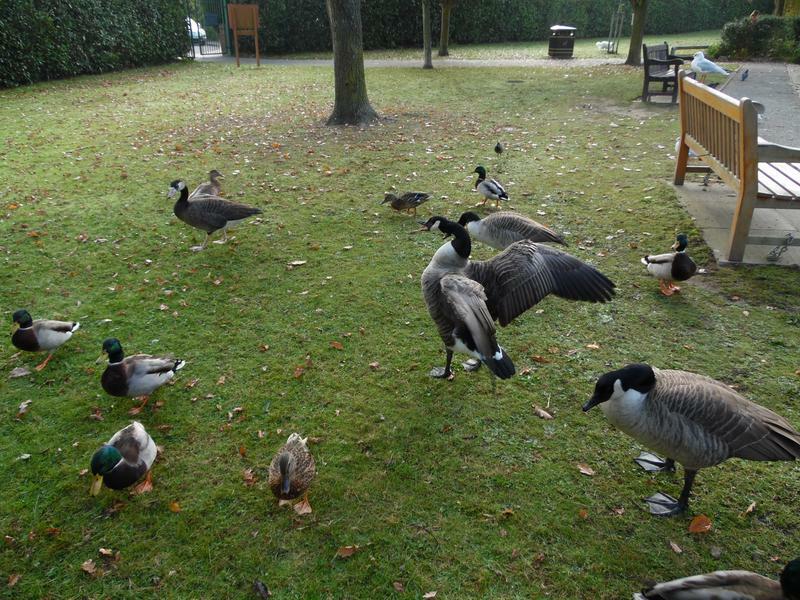 Not very hungry this week. 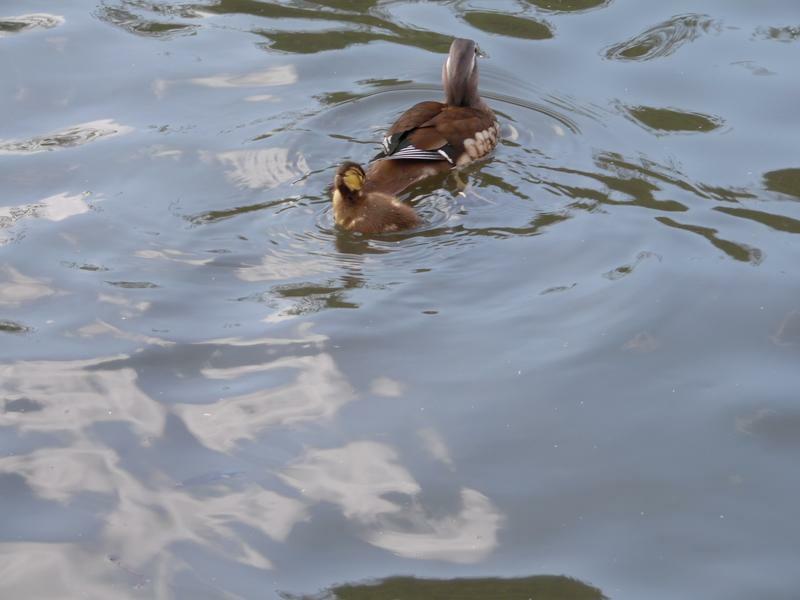 14th February, a Mandarin ducks boy and girl. 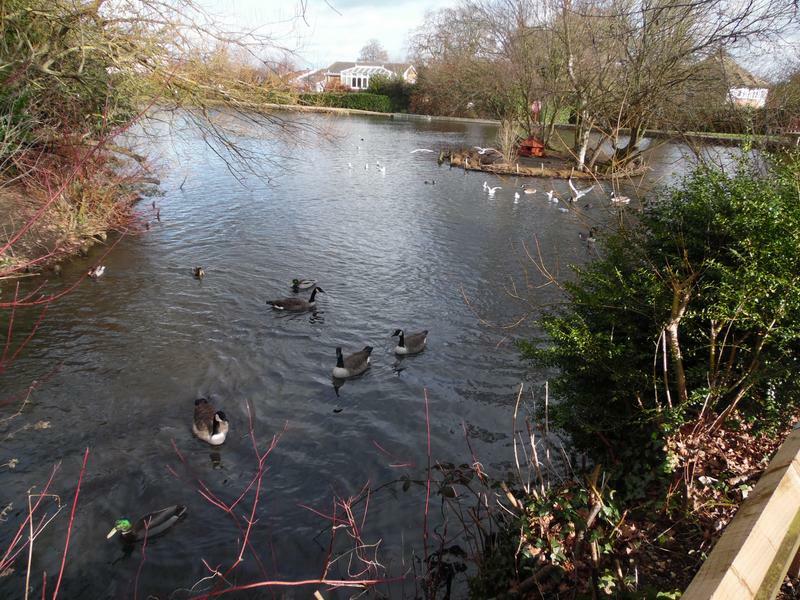 21st February 2016, still a lot of sea gulls around the pond. 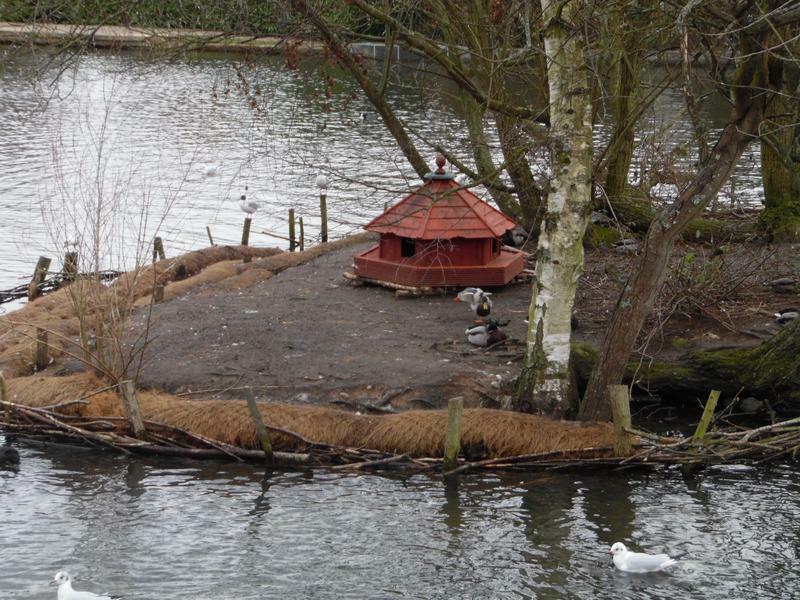 The floating duck house has been beached on the small island. 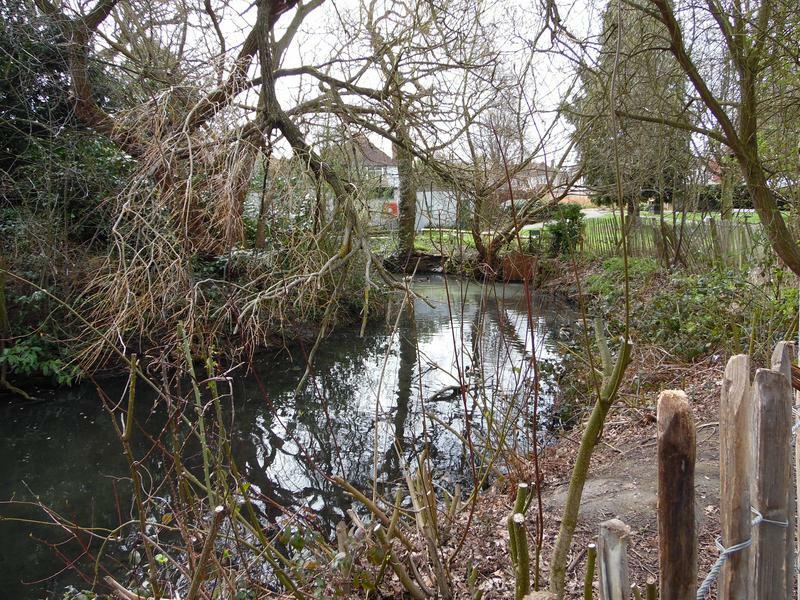 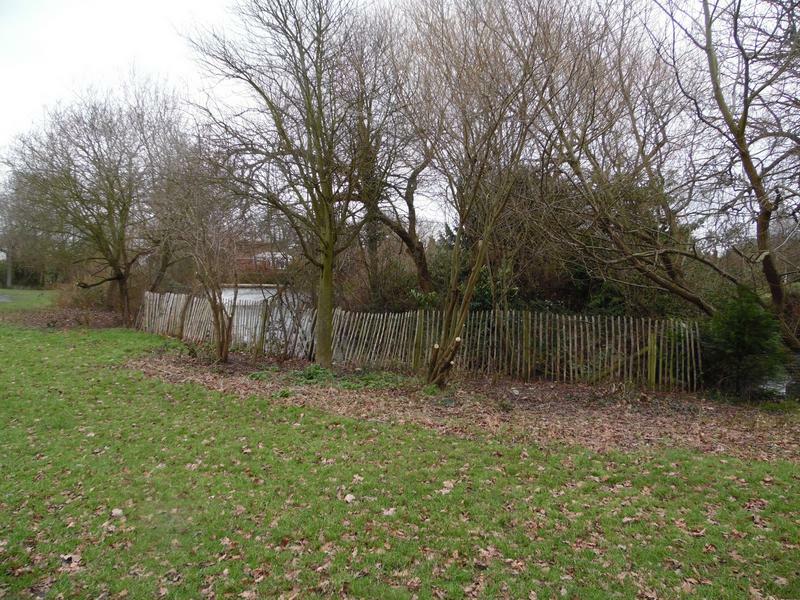 Plants around the far end of the pond have been cut back as well, giving new views. 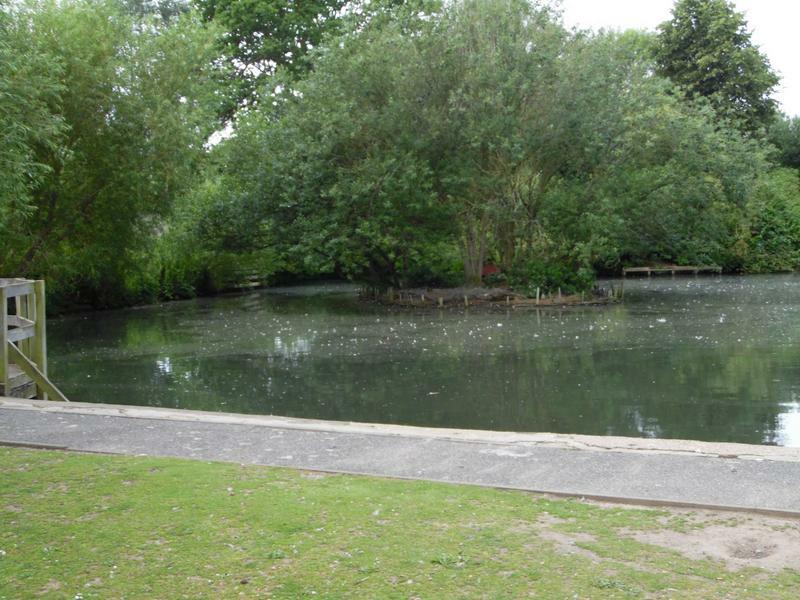 The small island at the far side of the pond. 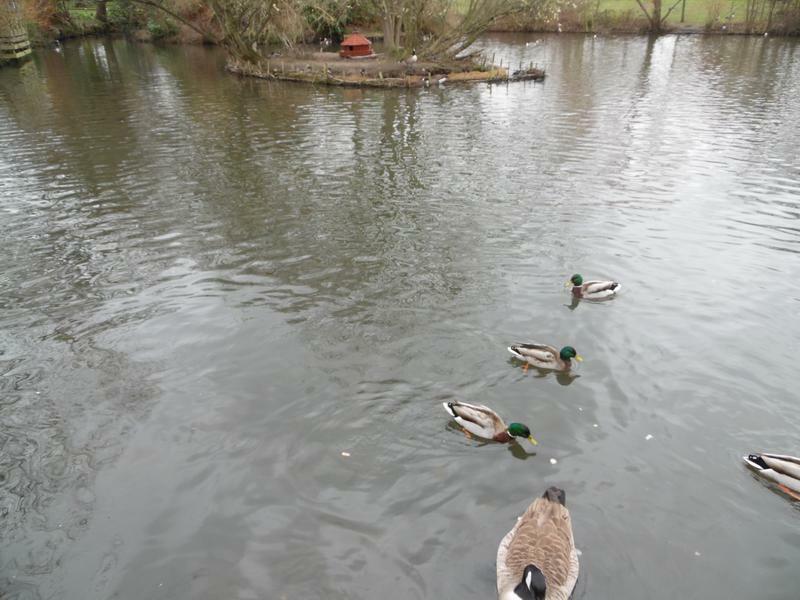 13th March 2016, still not as busy as some weeks. 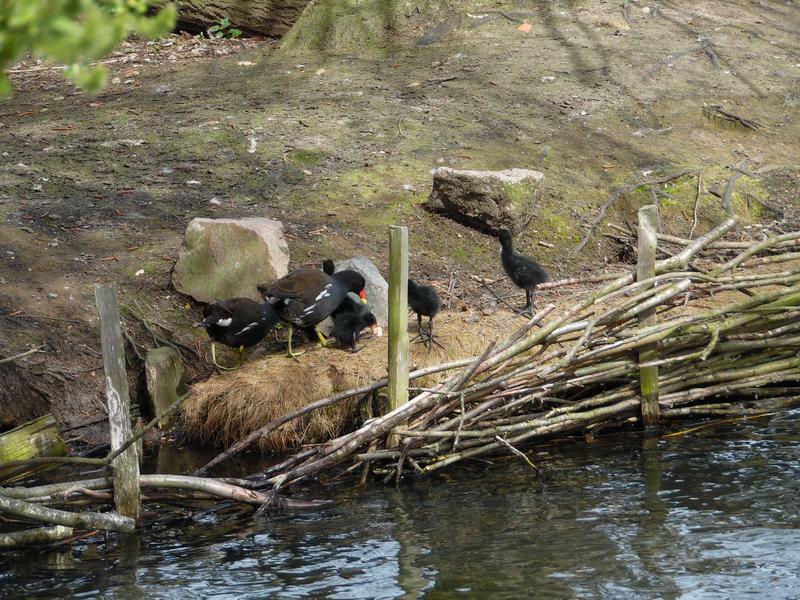 But the Coots are already building new nests. 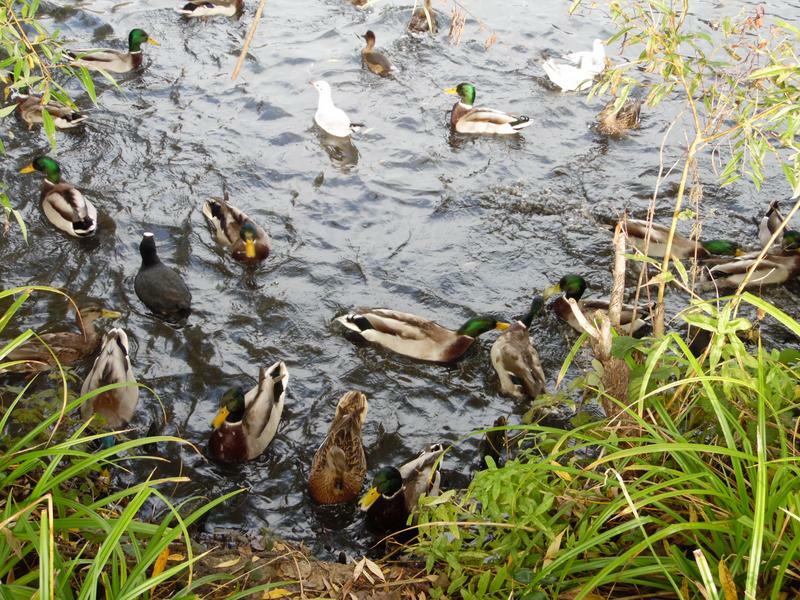 A lof of Mallards and geese on the small island. 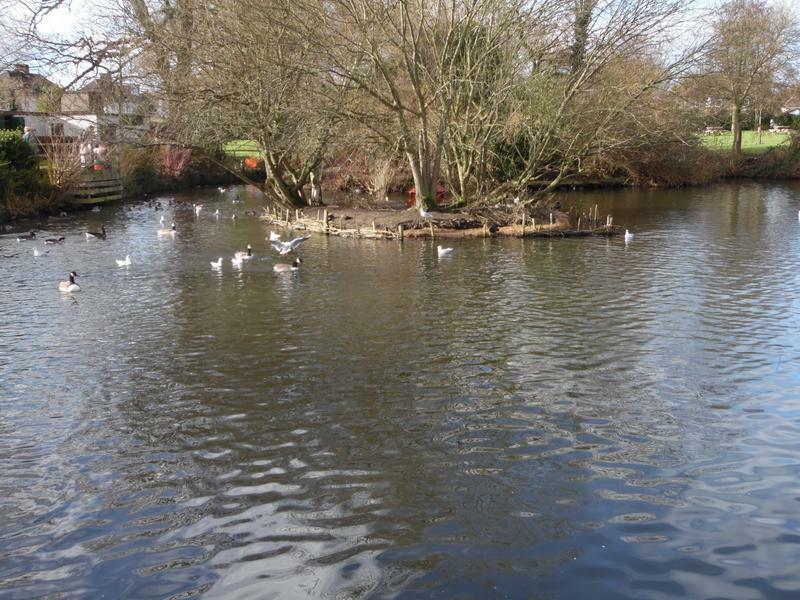 20th March 2016, very quiet this week, most of the sea gulls have left for the summer. 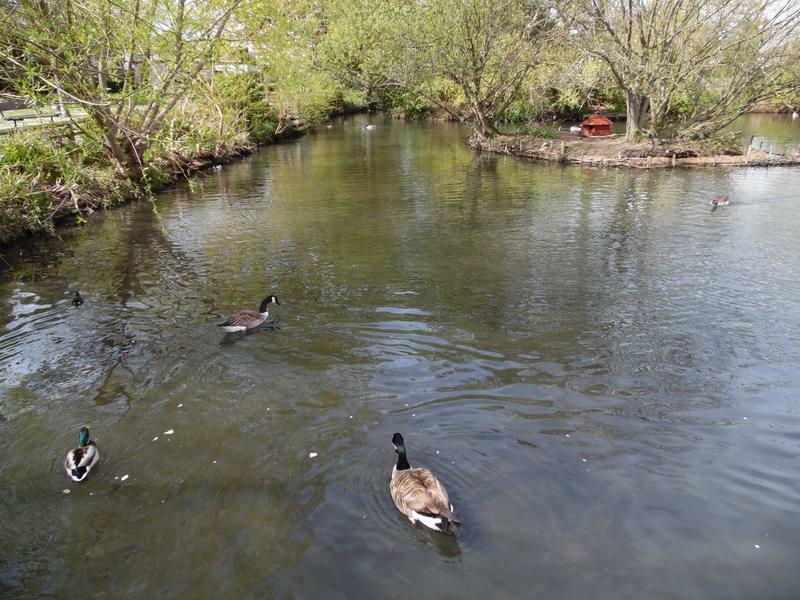 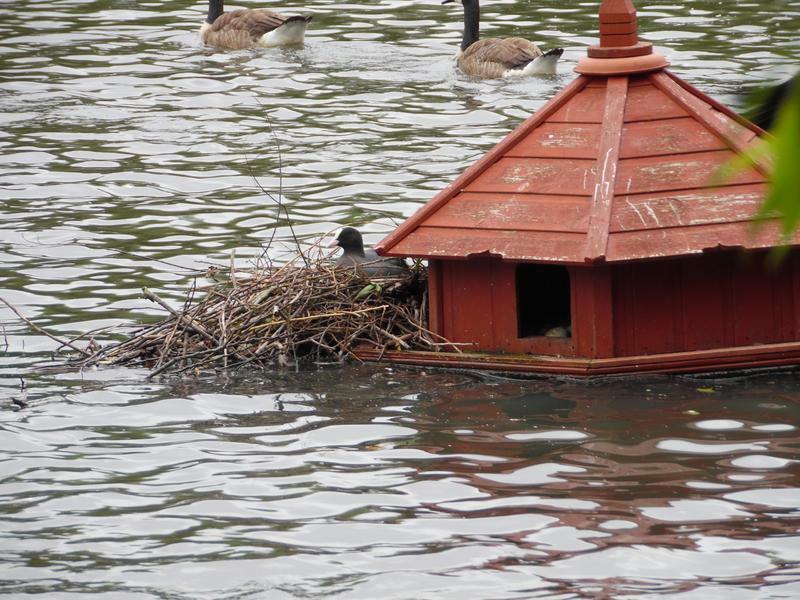 Ducks and geese are staking out nesting places on the large island. 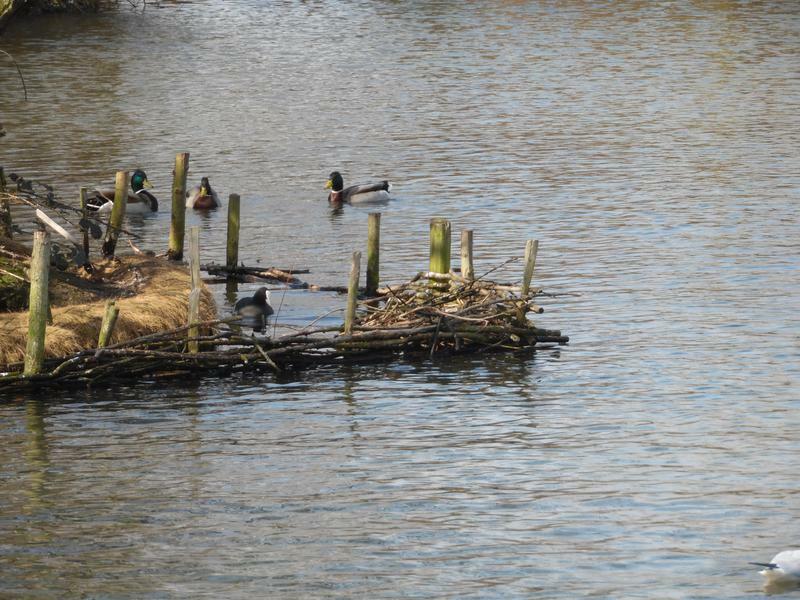 A Coot nest, but otherwise quiet. 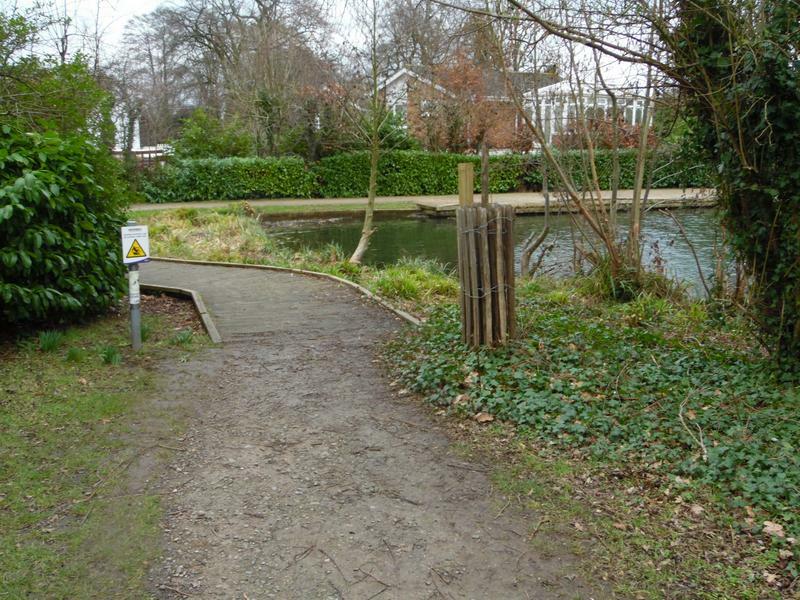 The restored wooden pathway at the end of the pond is now visible after all the plants were cut back. 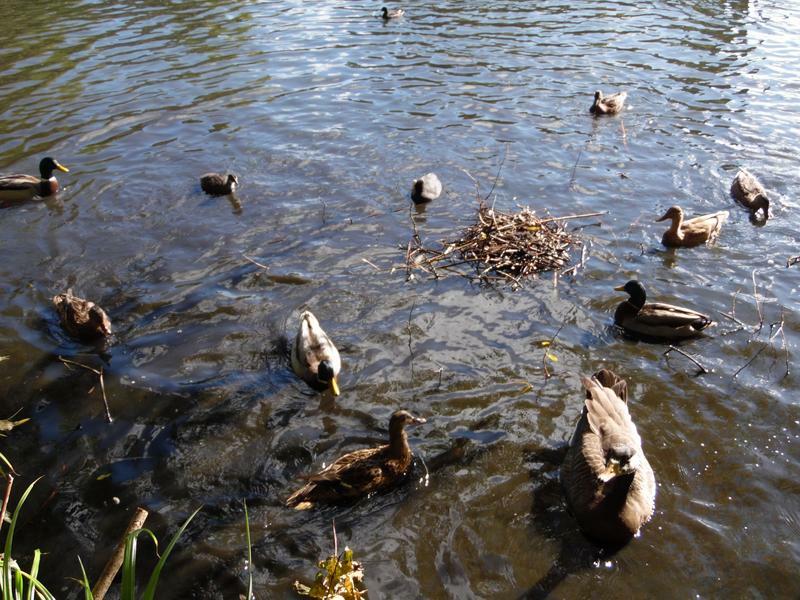 Also visiible now are nesting sites for Mallards, but that is not a good thing. 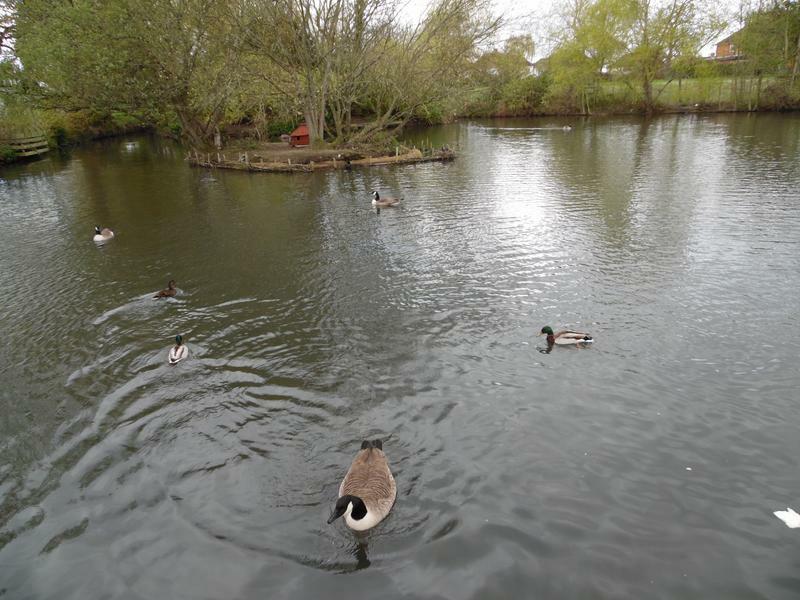 10th April 2016, no sea gulls, and not many geese or ducks. 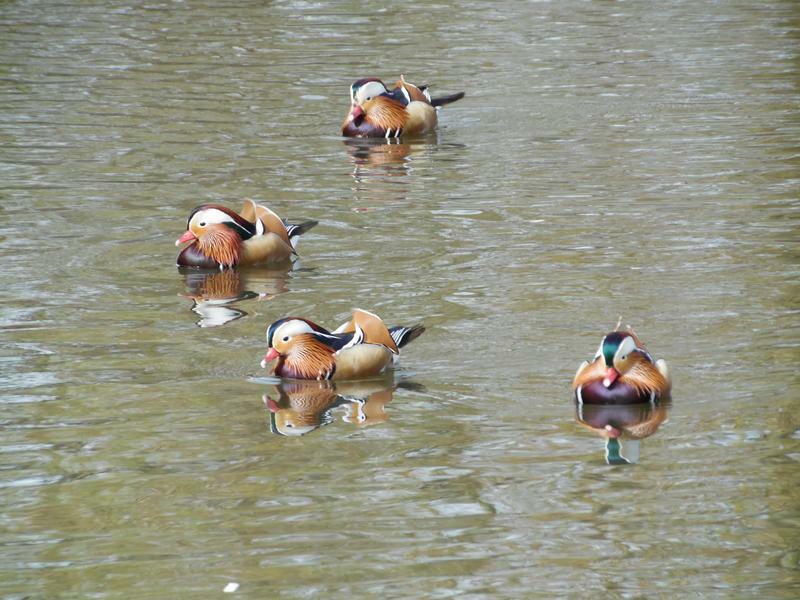 Still some Mandarin ducks here. 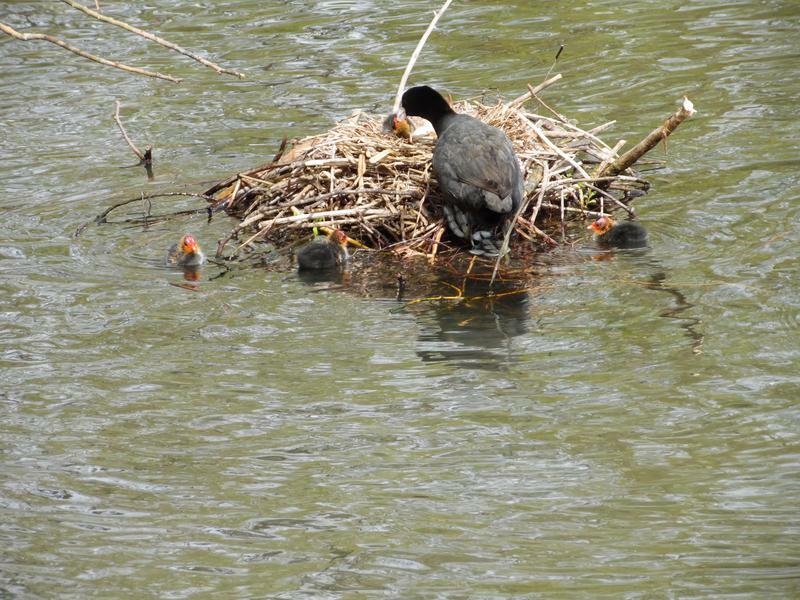 The Coots are incubating their eggs. 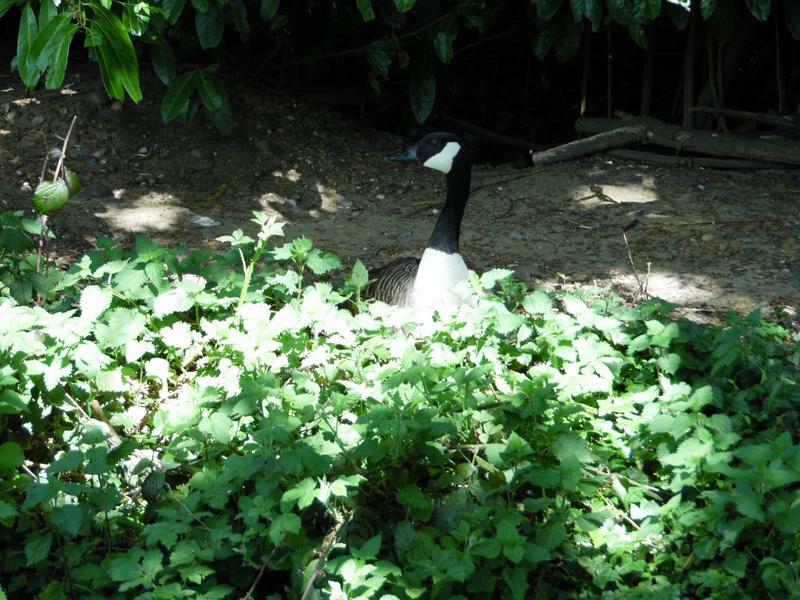 The geese are also nest building. 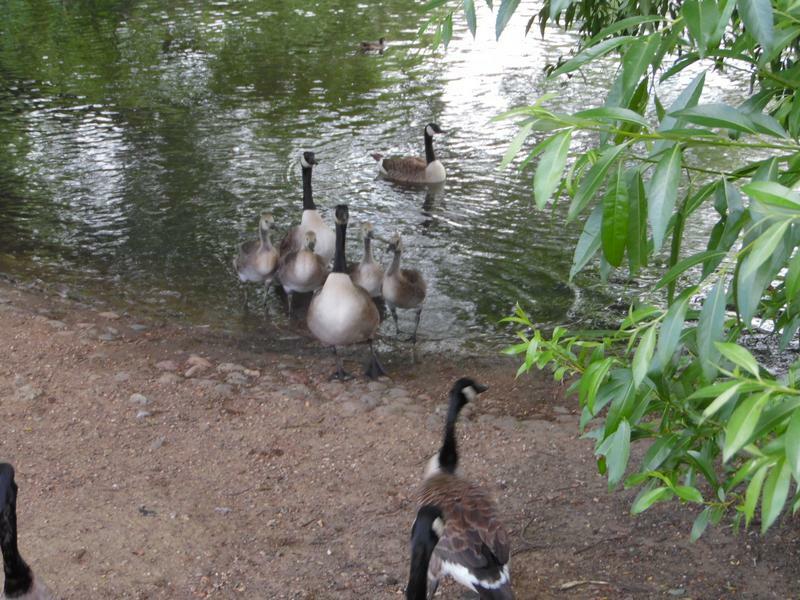 But large year the park rangers removed a lof of geese eggs to keeo the population down. 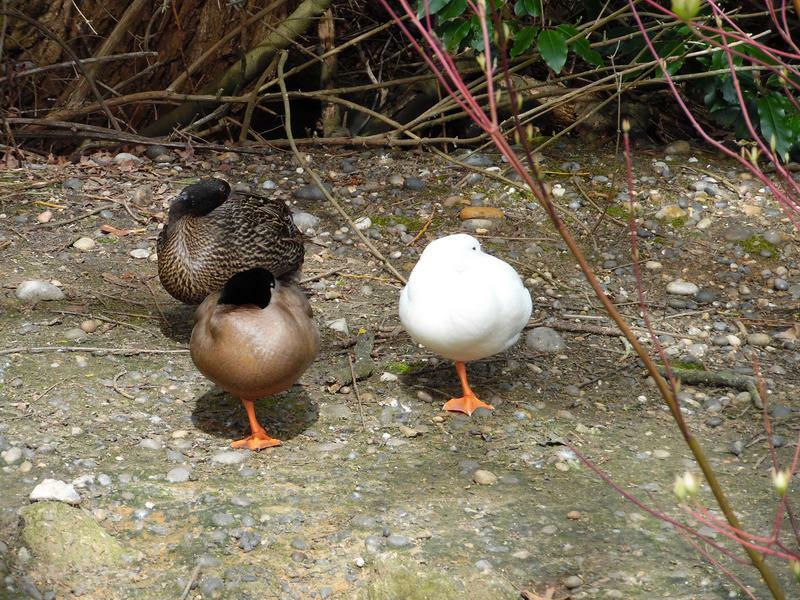 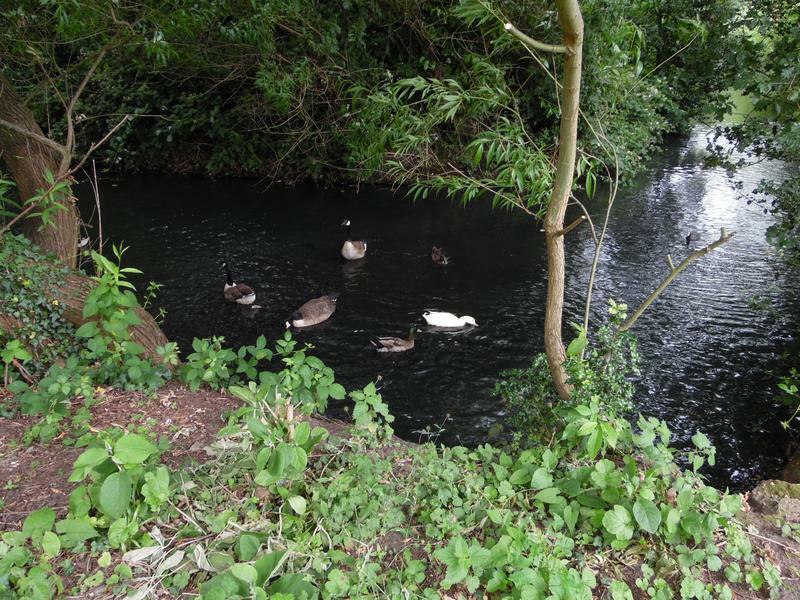 The three remaining domestic ducks, sleeping. 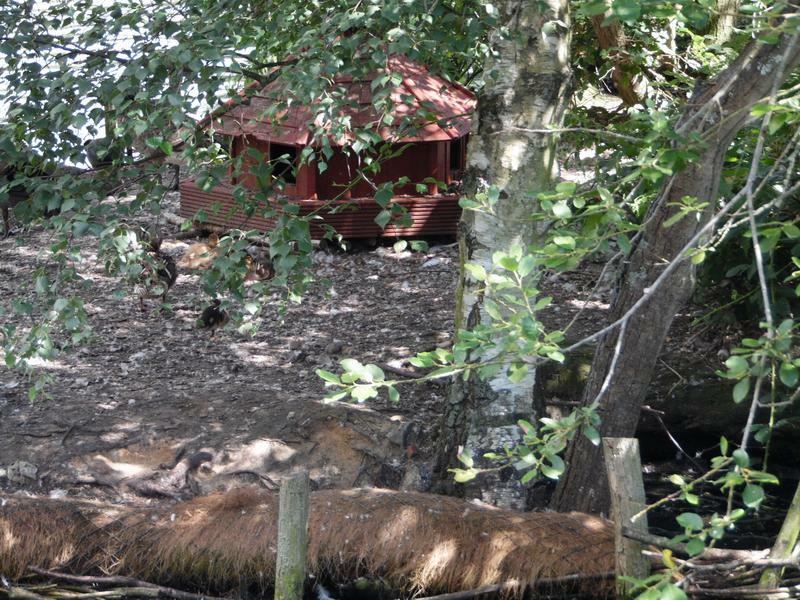 Quiet behind the large island as well. 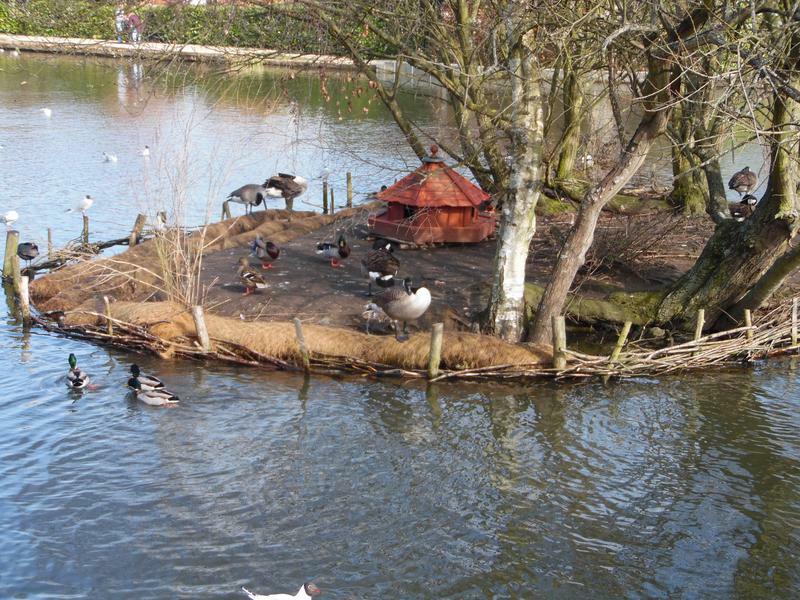 the island and disturbing the nests there. 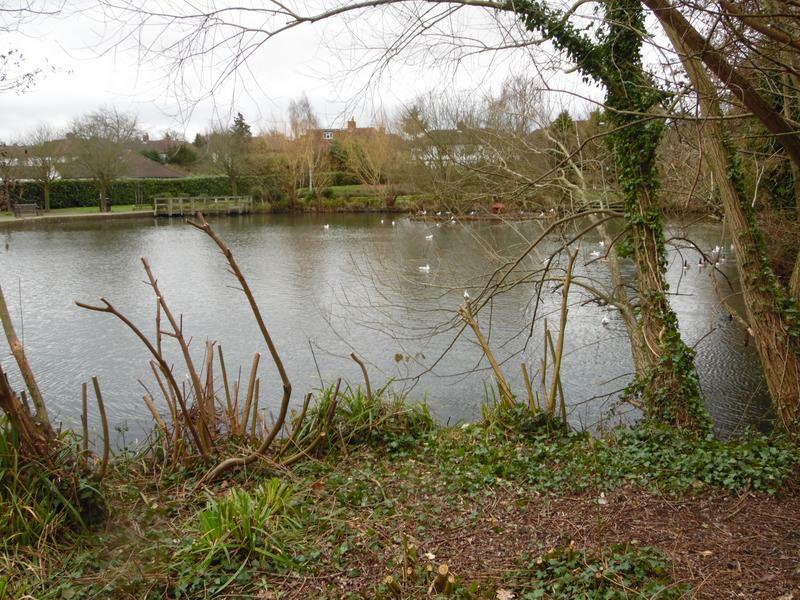 View back to the main pond. 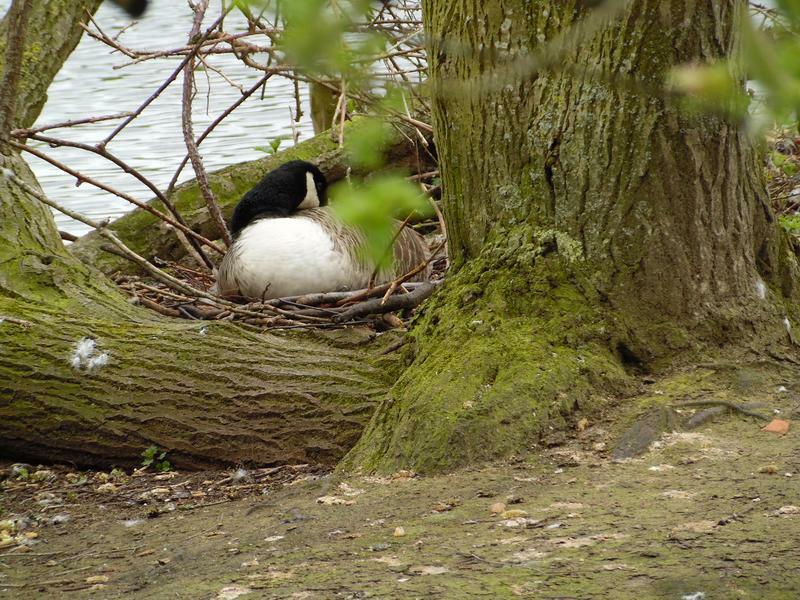 24th April 2016, still not that busy, but a lot of nesting. 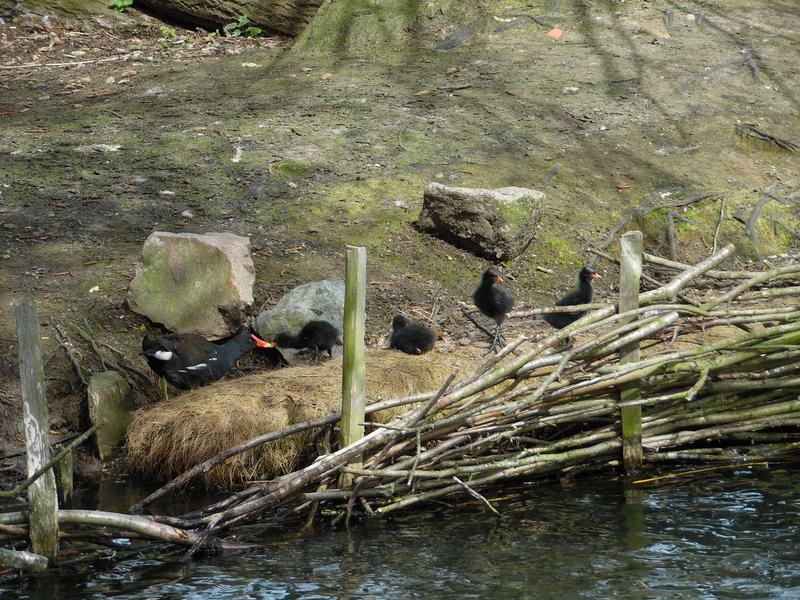 The Coot nesting on the small island has one chick, with a red beak. 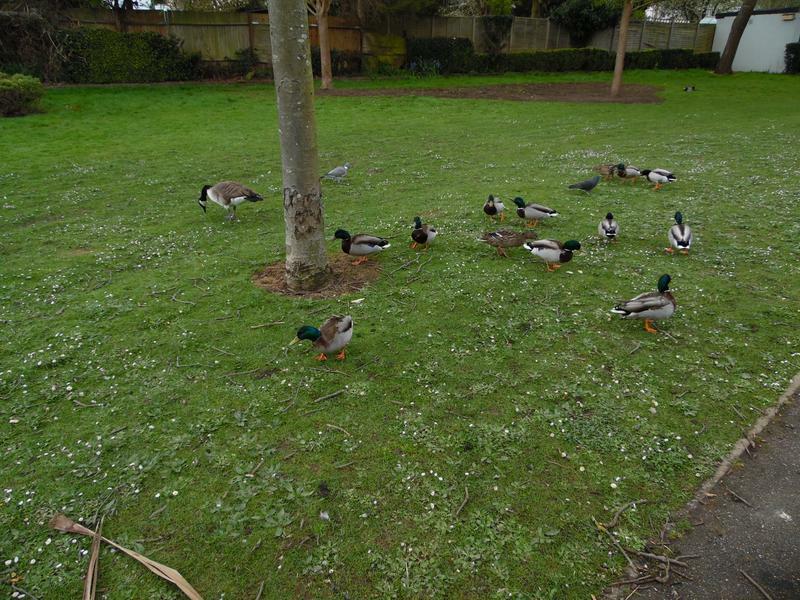 A lot of Mallards on the grass for some reason. 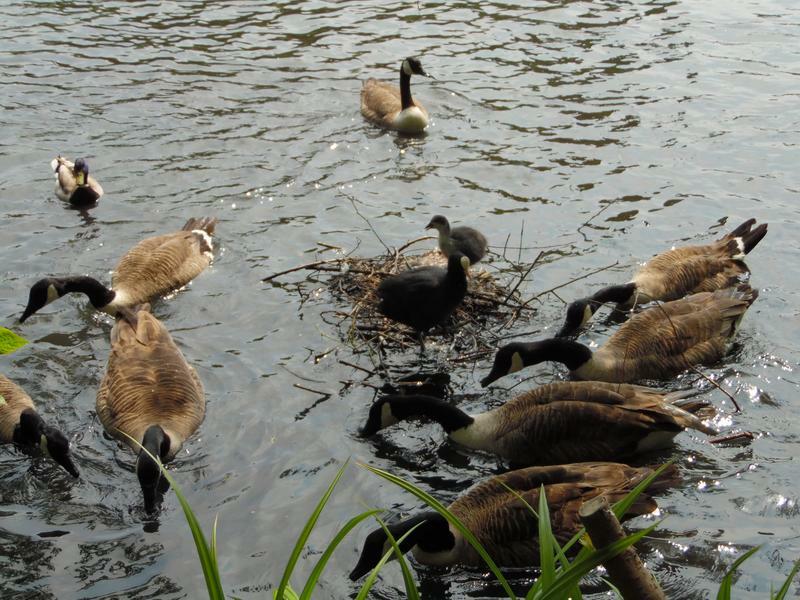 Canada Goose nest on the large island. 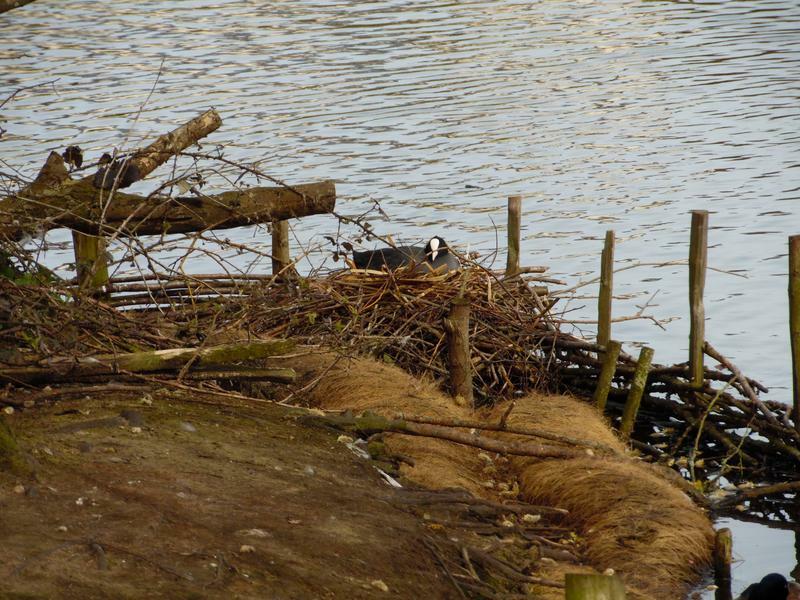 The second Coot nest again. 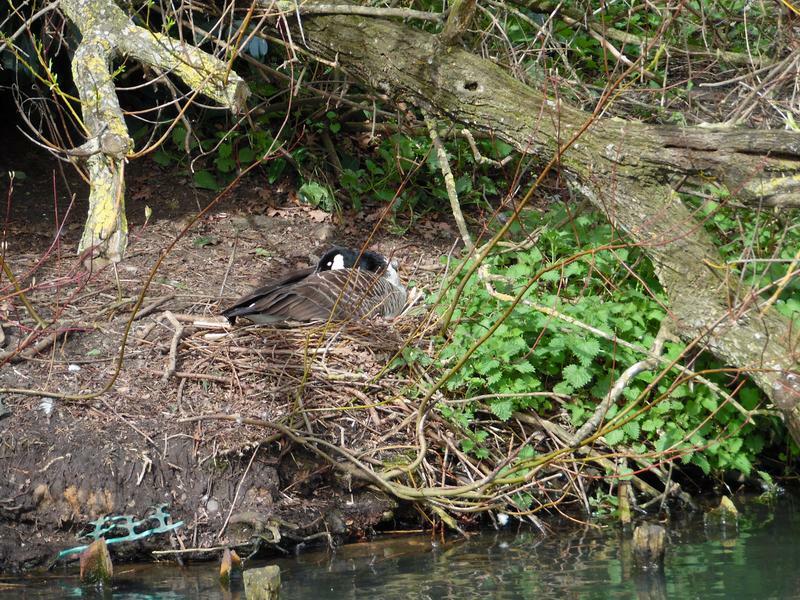 Not sure if this is really a goose nest on the small island, always a dangerous place to nest because the Coots steal twigs for their nests. 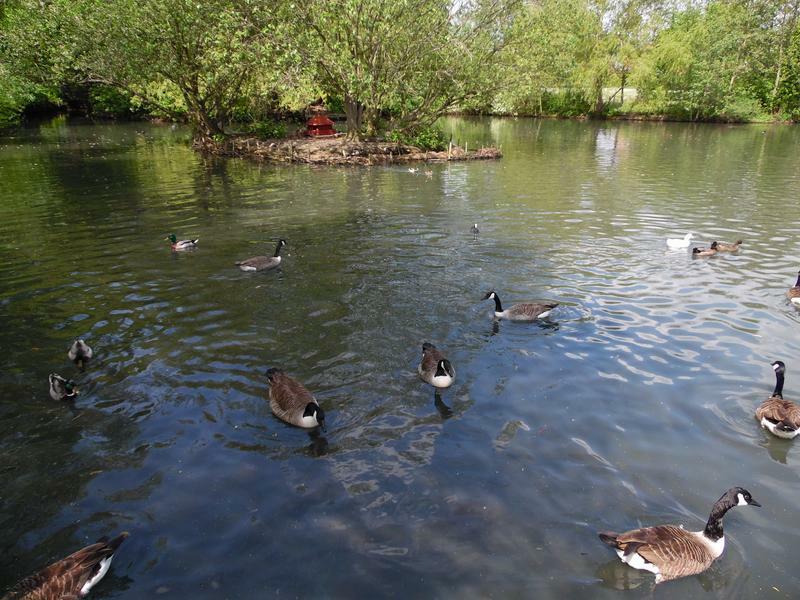 1st May 2016, pond seems quiet again, but there is a lot of activity and the birda are hungry. 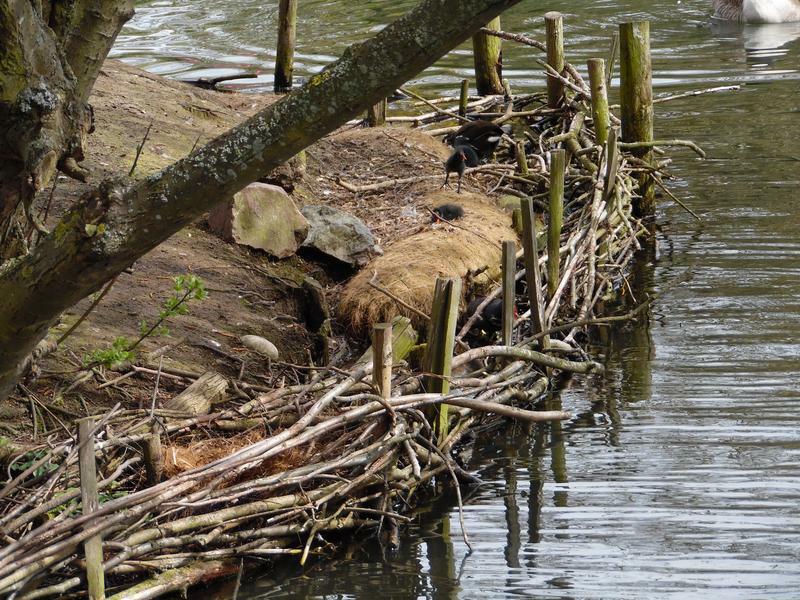 The Coot nest on the small island, only seems to be one chick still. 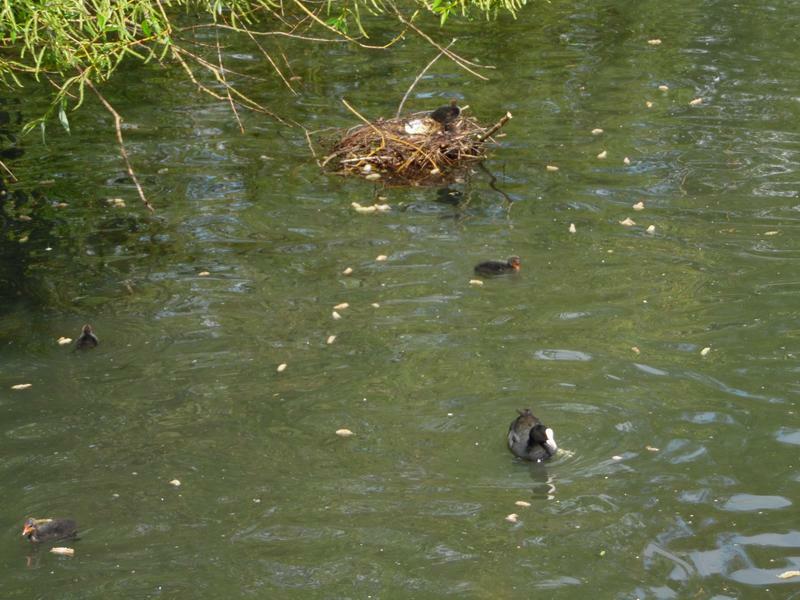 But the second Coot nest is busy, four chicks have hatched and more eggs could soon. 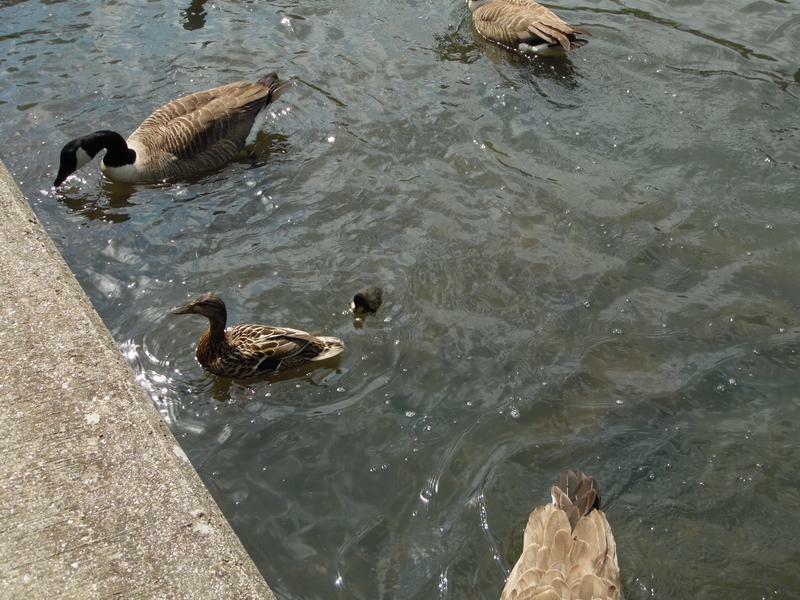 Mother is taking food back to the nest. 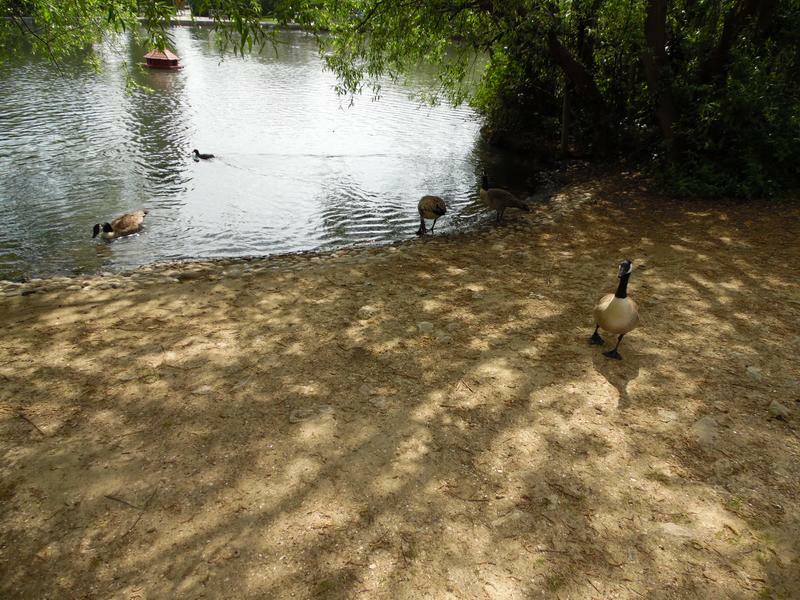 A goose nesting of the large island, managed to throw bread that far and she got off to eat it. 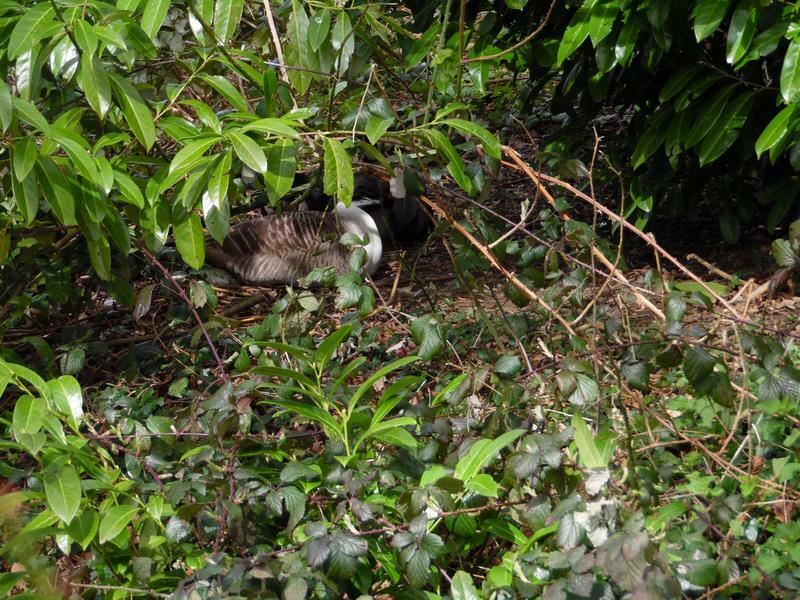 There are more goose nests on the island around here, very noisy, but the nests are not visible to photograph. 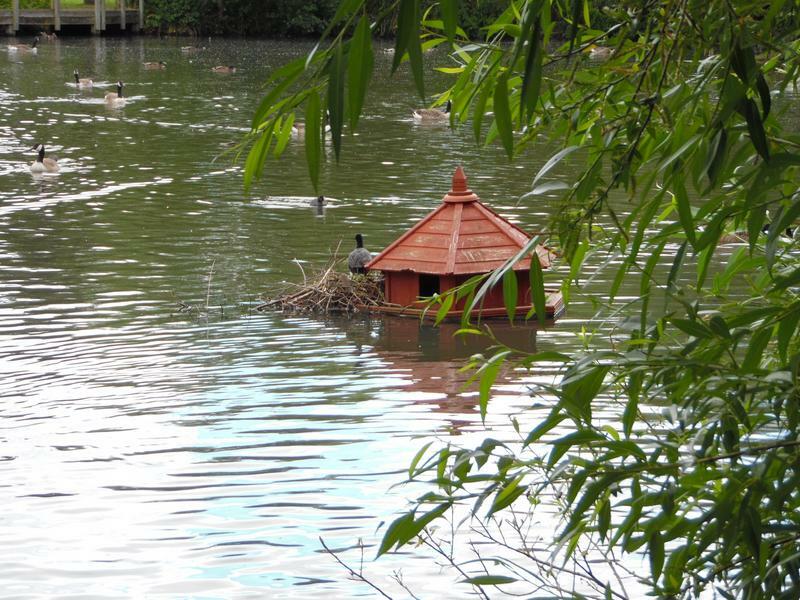 Back on the small island, the Moorhens have been nesting as well and their chicks are roaming the island. 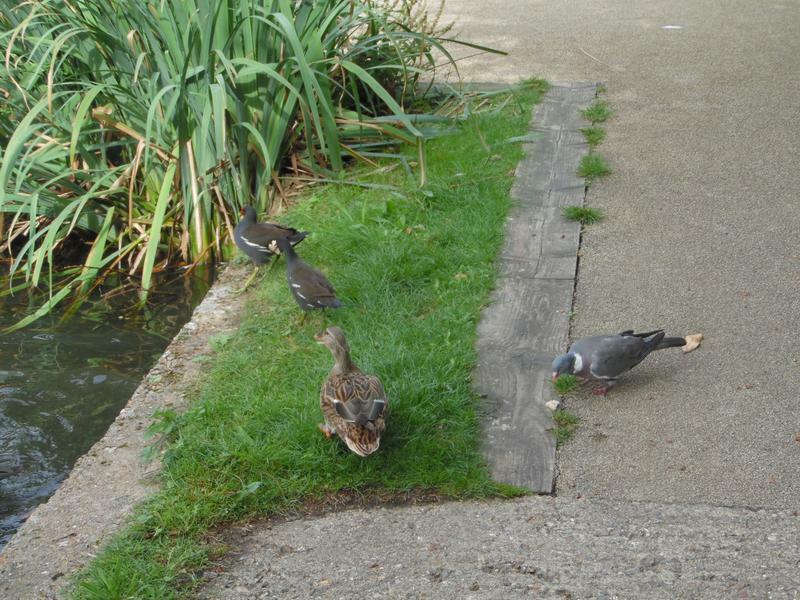 The Moorhens feeding their chicks. 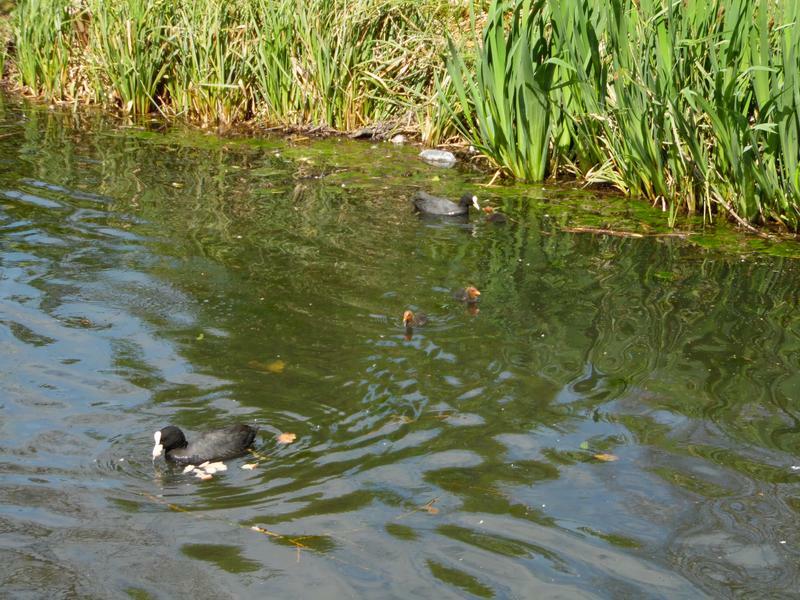 Although adult Moorhens and Coot chicks have red beaks, the Moorhen chick beaks are not as red. 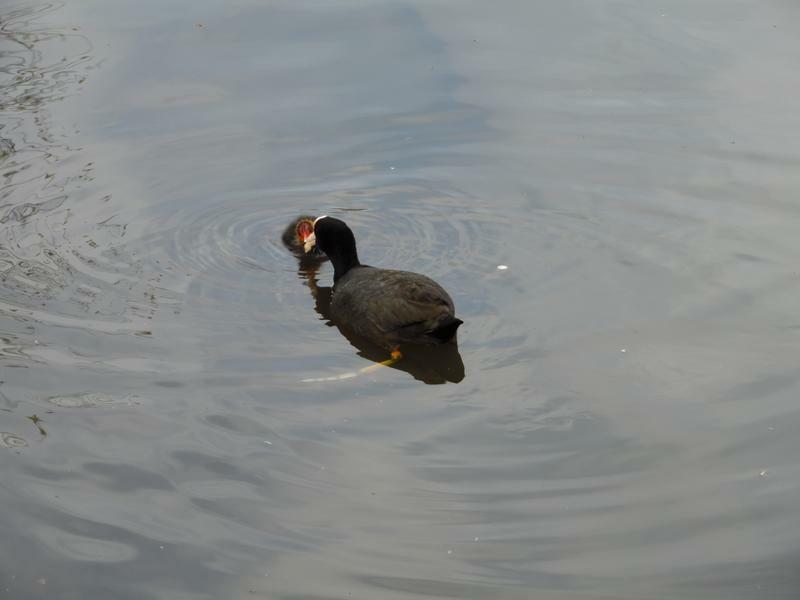 The Coot with a single chick feeding it on the water. 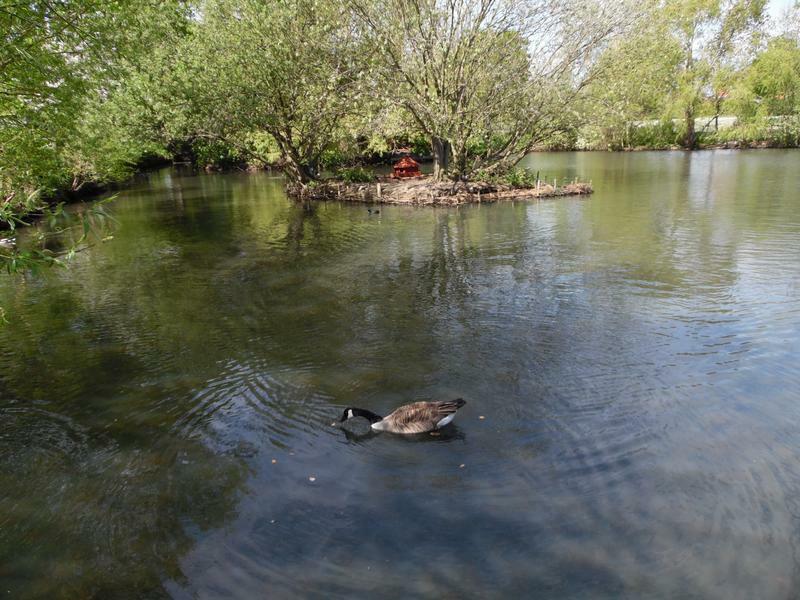 8th May 2016, the pond seems very quiet today. 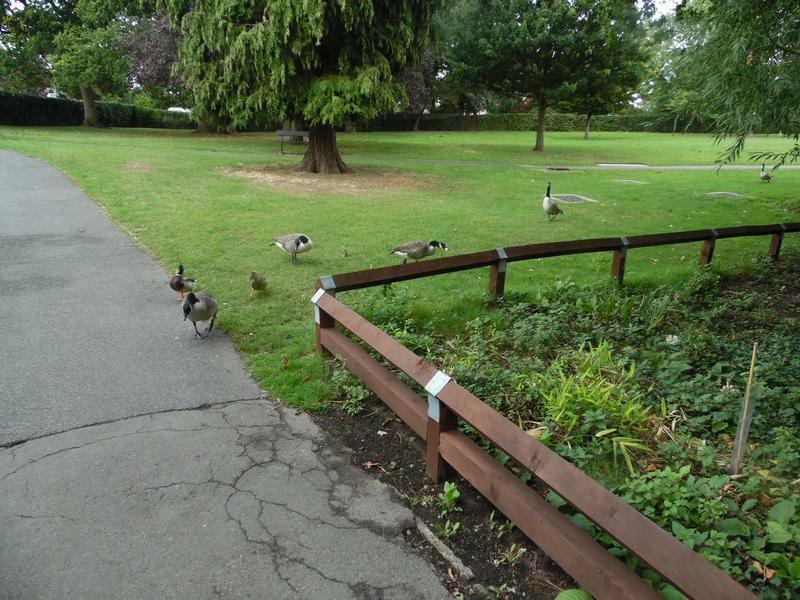 Although a few ducks and geese are heading our way. 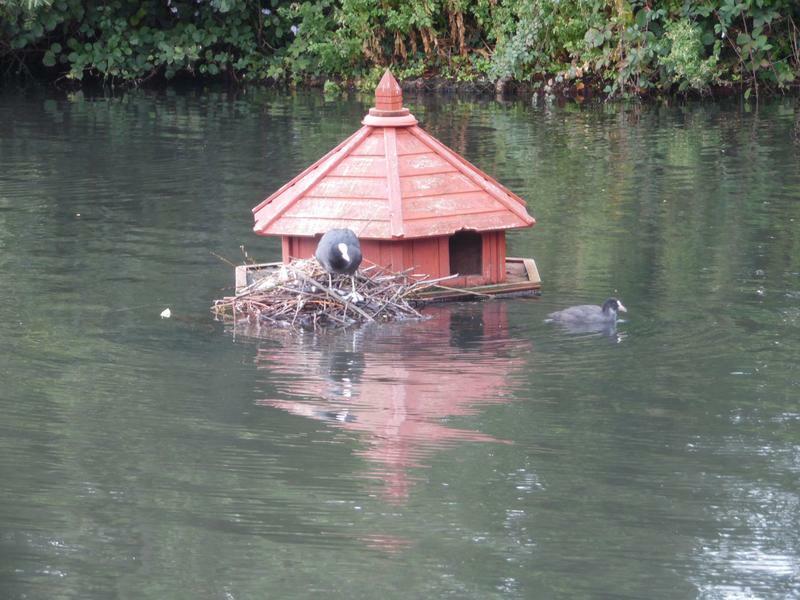 The Coot is still looking after her single chick. 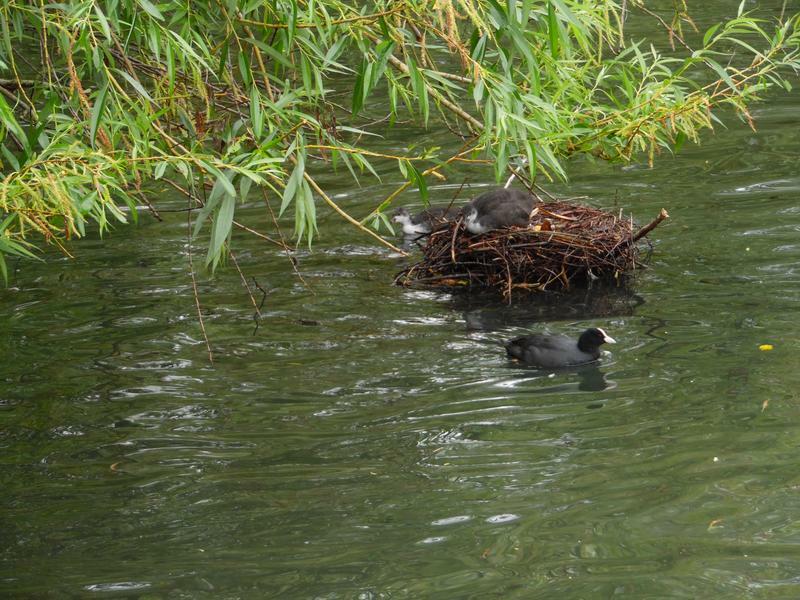 The second Coot family still has several chicks. 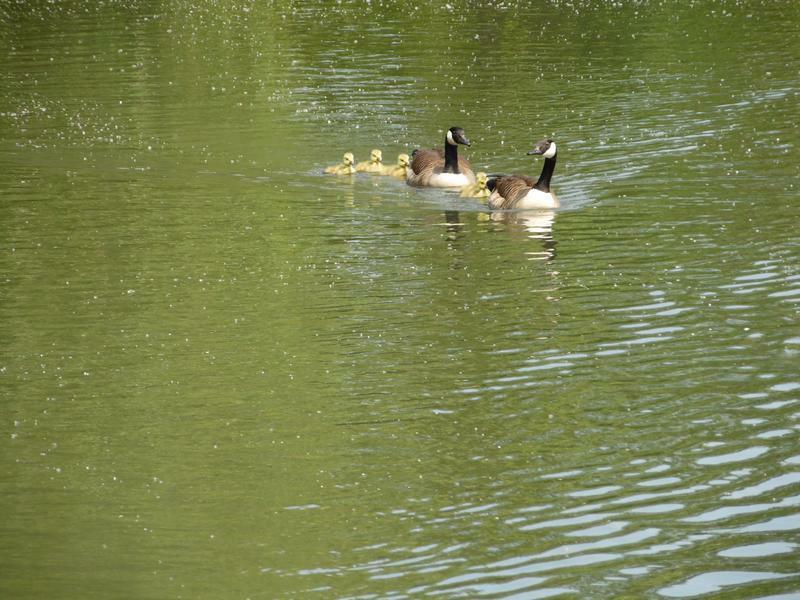 While the third family at the far end of the pond has three chicks. 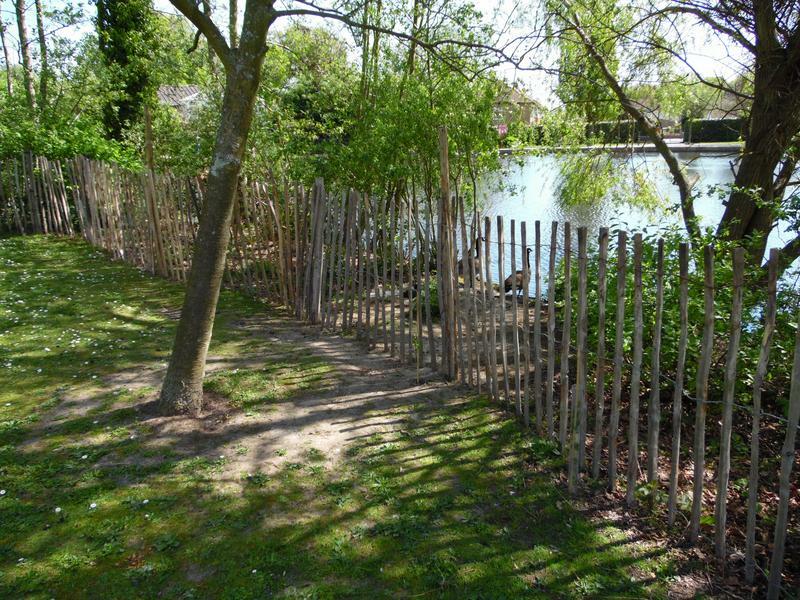 This used to be the geeses favourite exit from the pond, but the fence will make nests near the water edge safer from dogs. 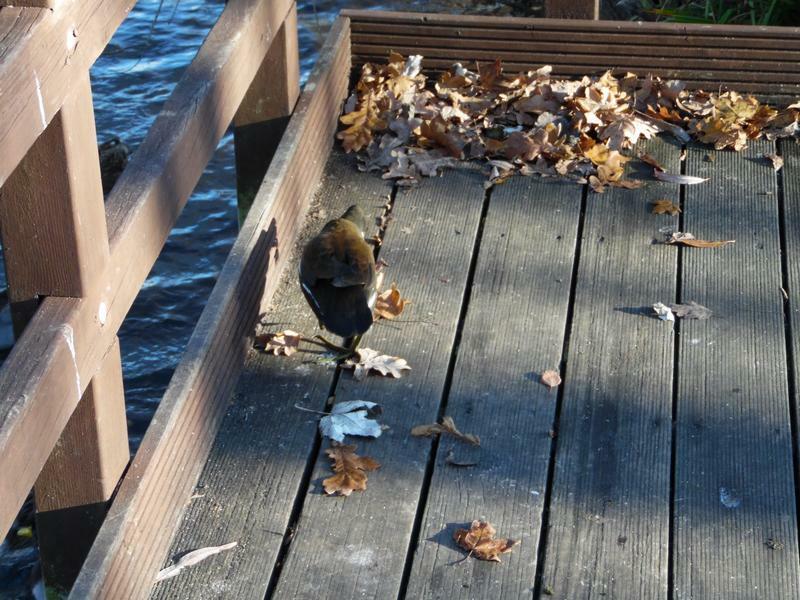 Behind the large island, the Moorhen is feeding here family. 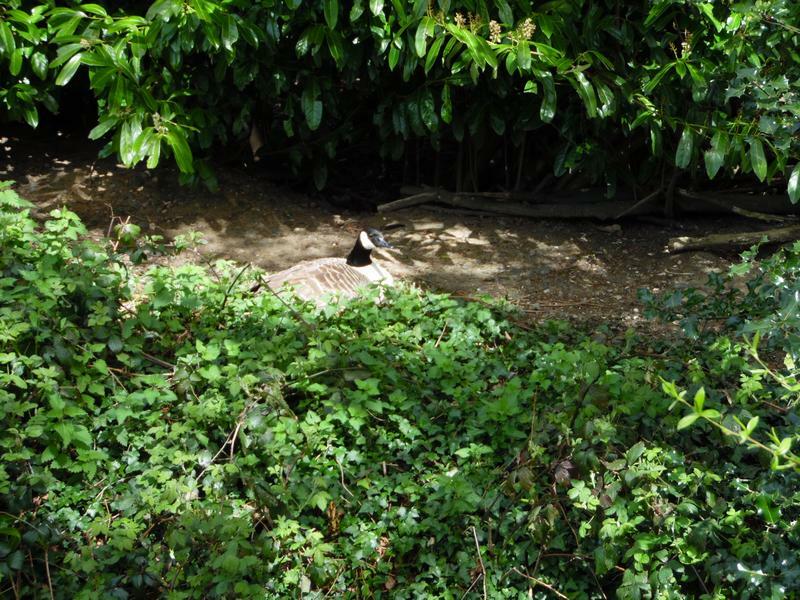 The Canada goose is still on her nest on the large island. 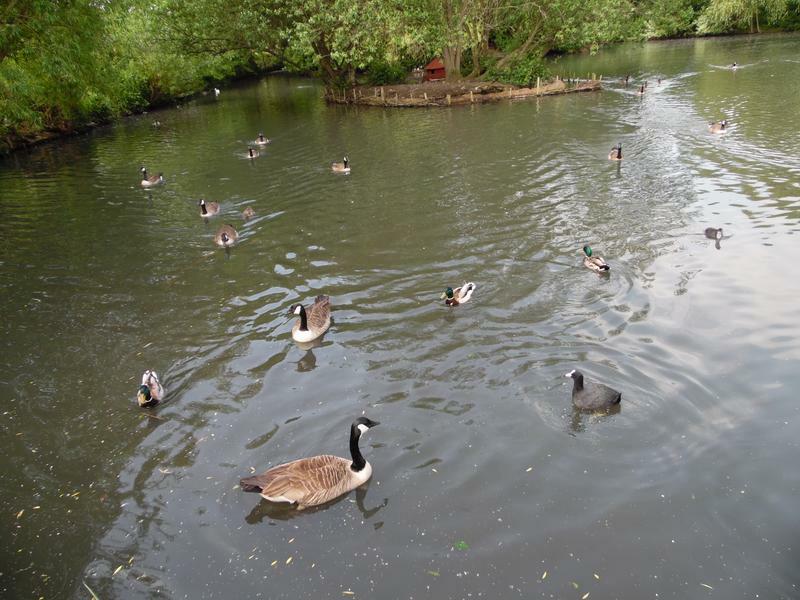 15th May 2016, pond is busier this week. 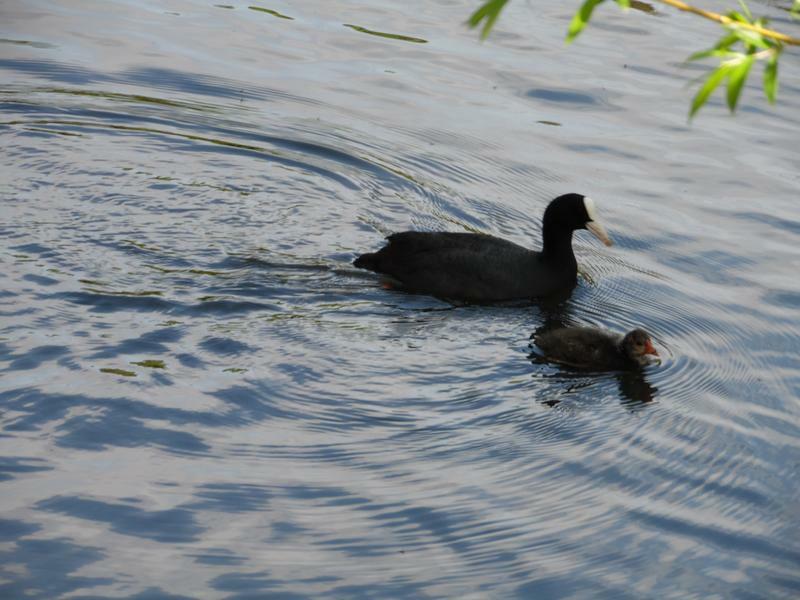 The single chick Coot family is growing fast, and has lost her red beak. 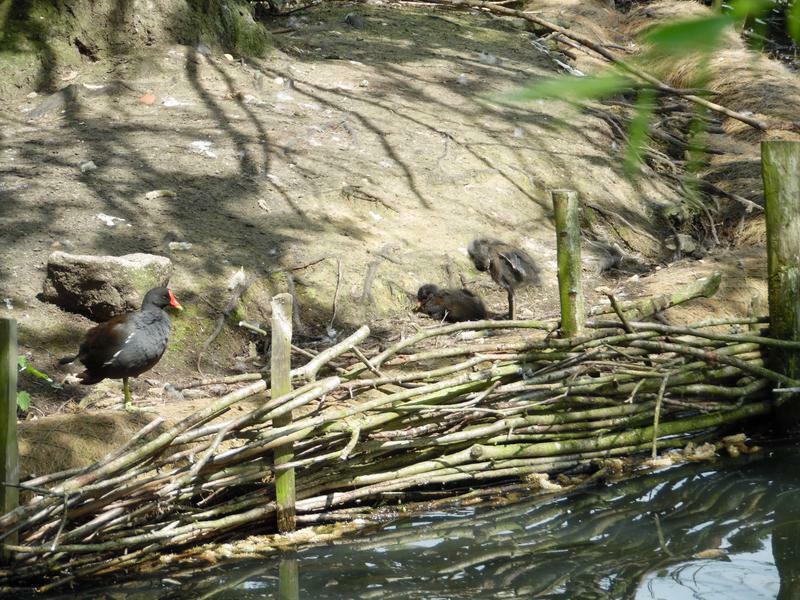 The Moorhen family is back on the small island, also growing fast. 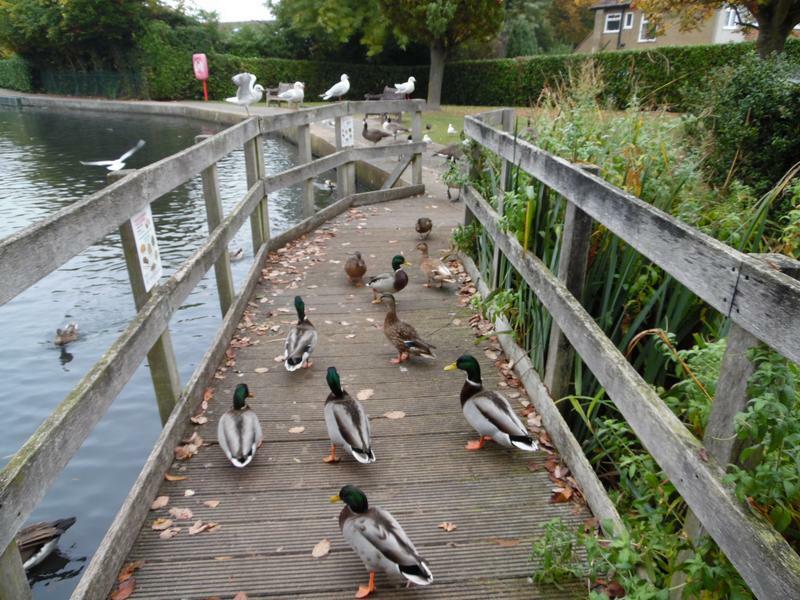 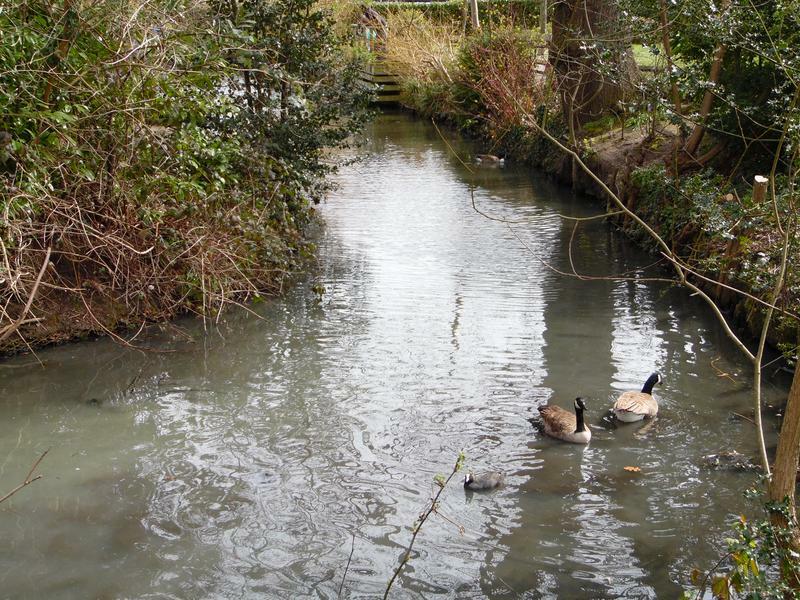 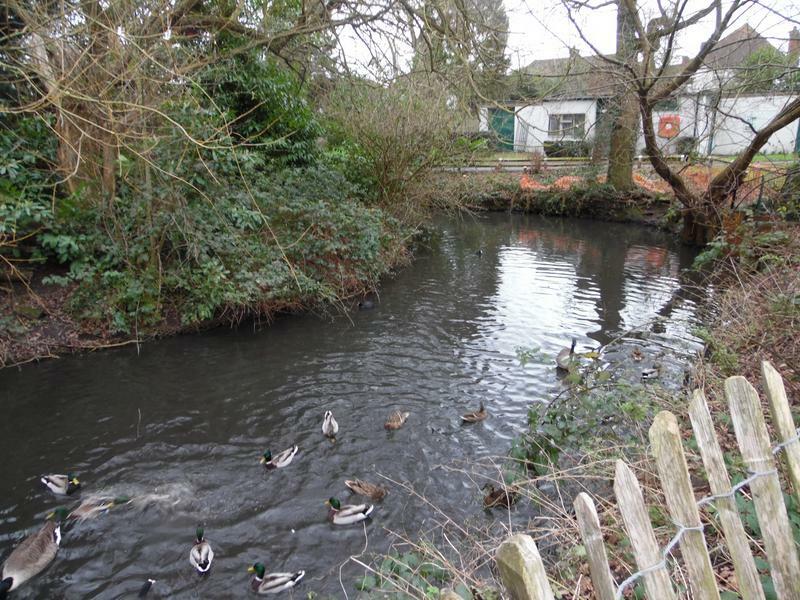 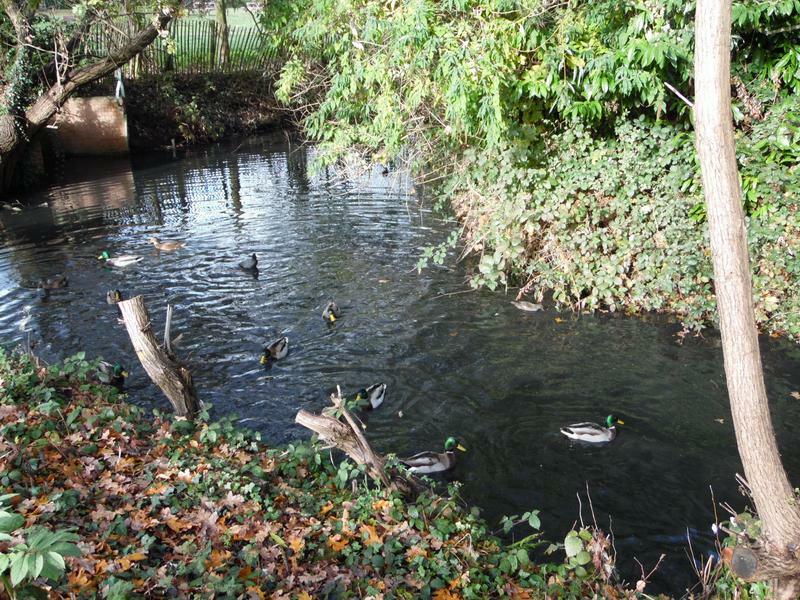 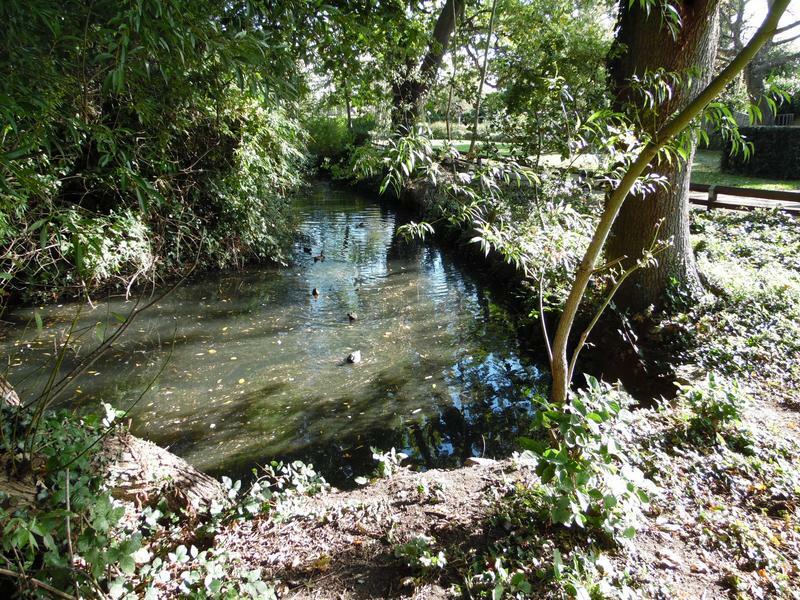 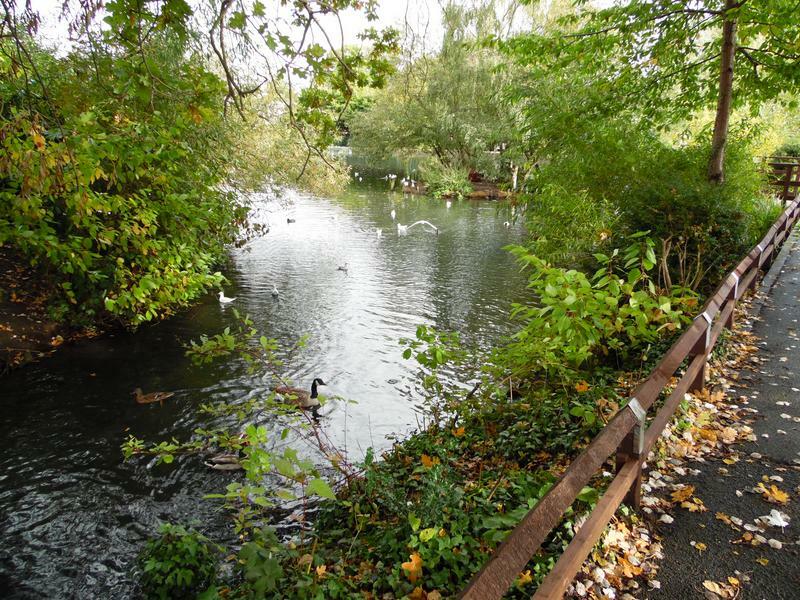 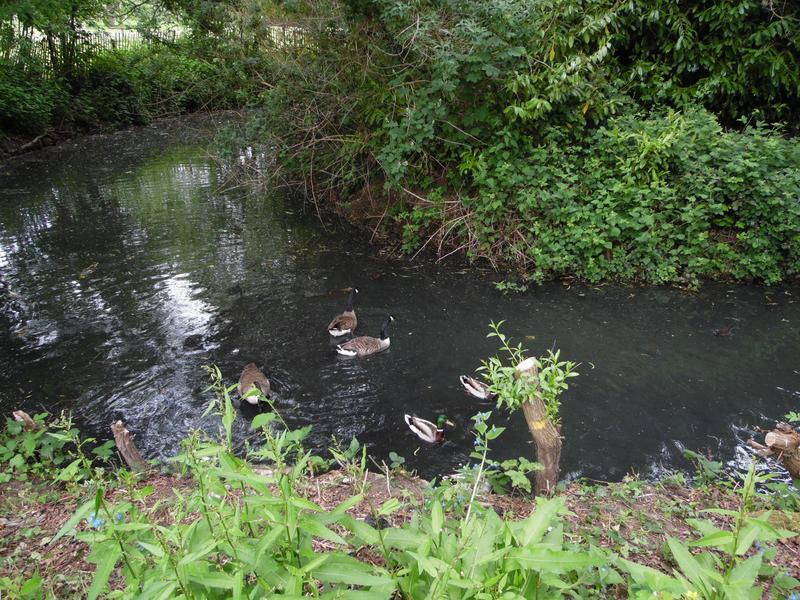 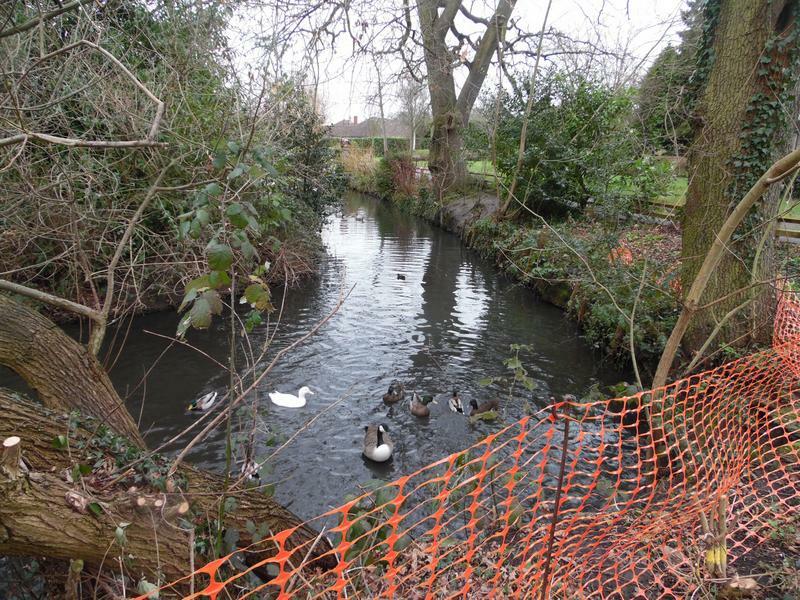 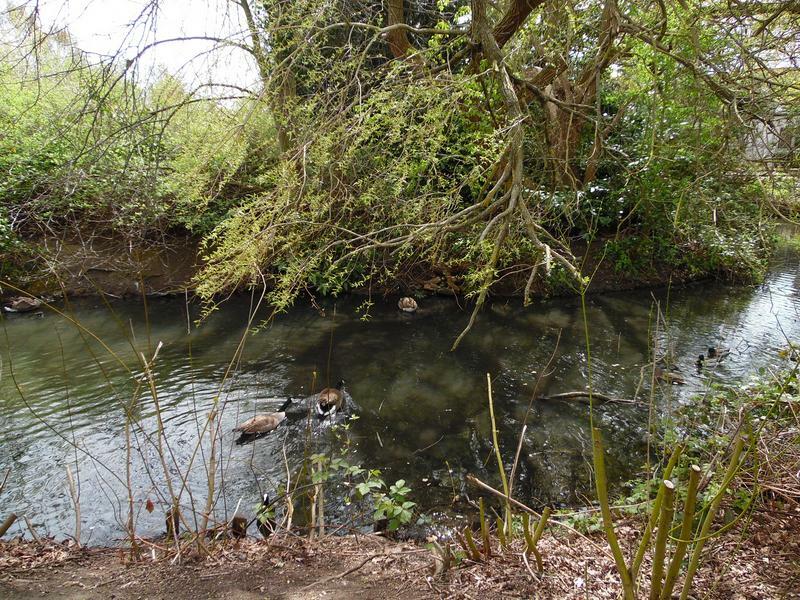 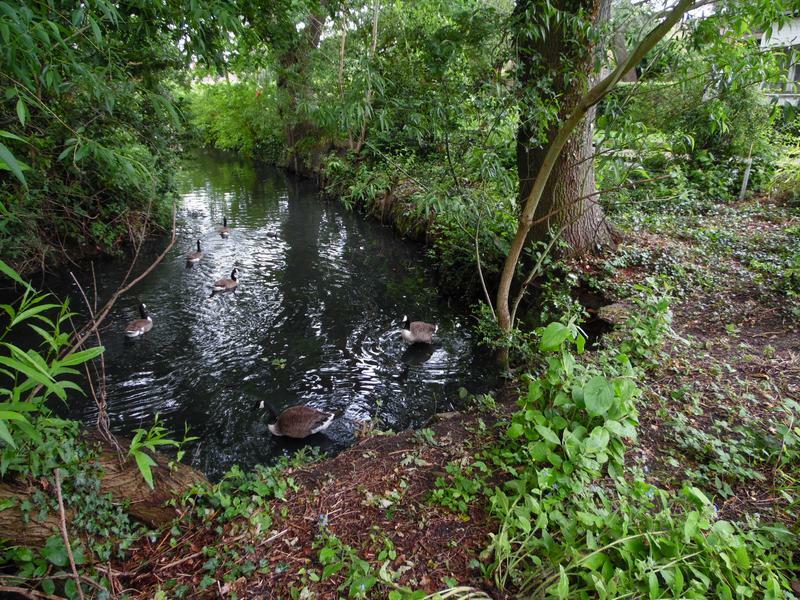 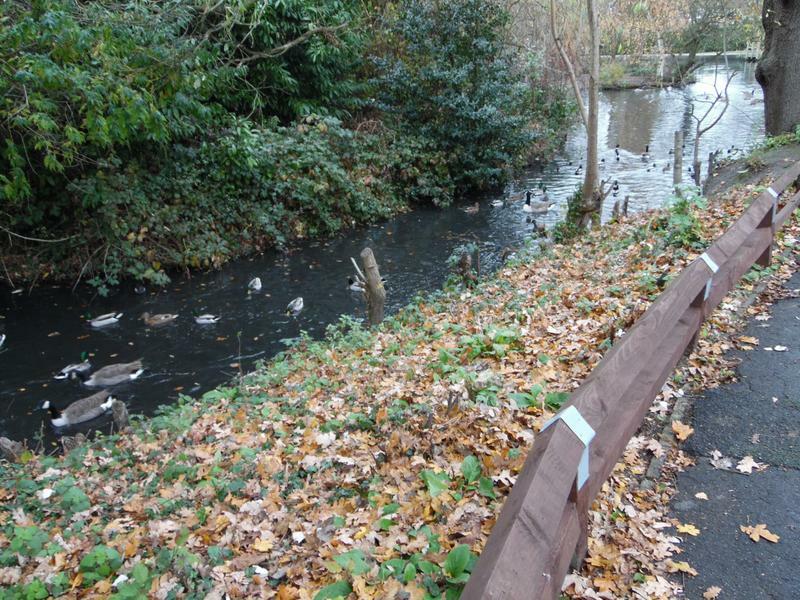 The large ducks have a path up from the pond, but can not make their mind up whether to come onto the main path. 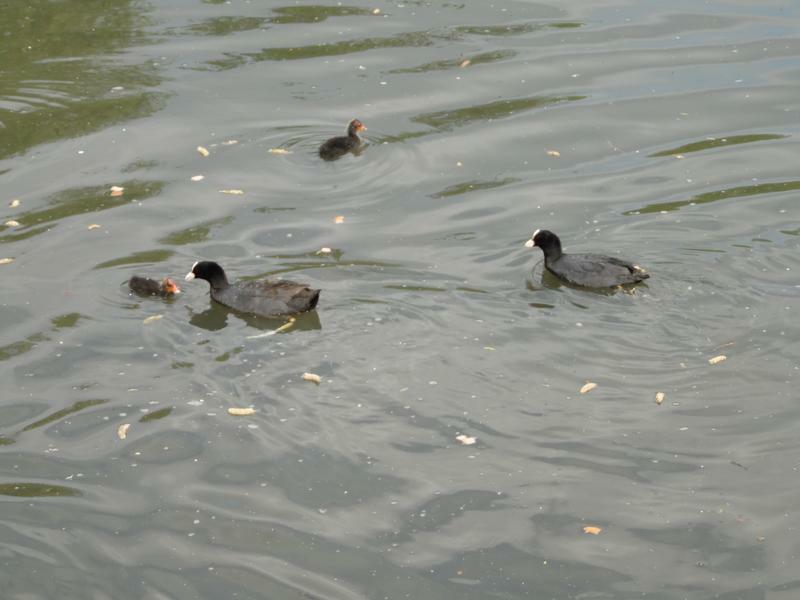 The second Coot family, still with read beaks. 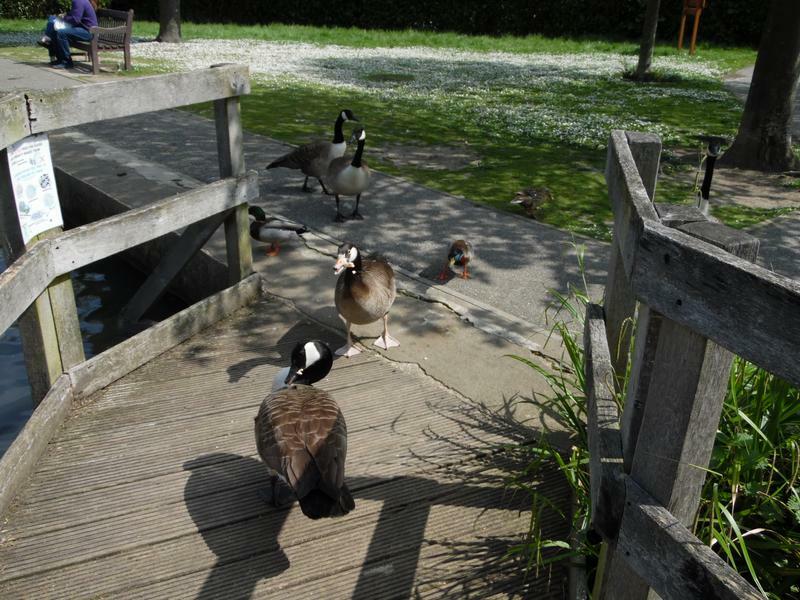 Staying close to their nest. 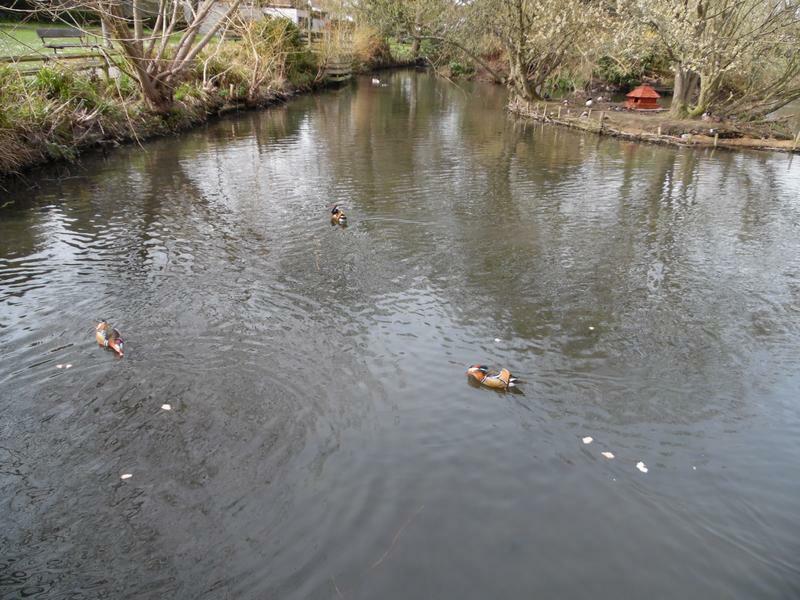 The large ducks are all back in the water, with a Mandarin duck. 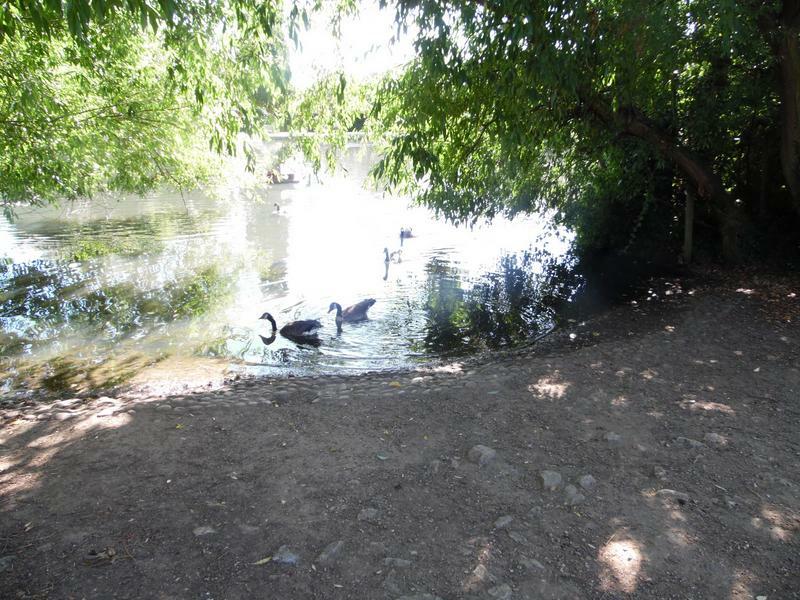 The beach is the main exit from the pond. 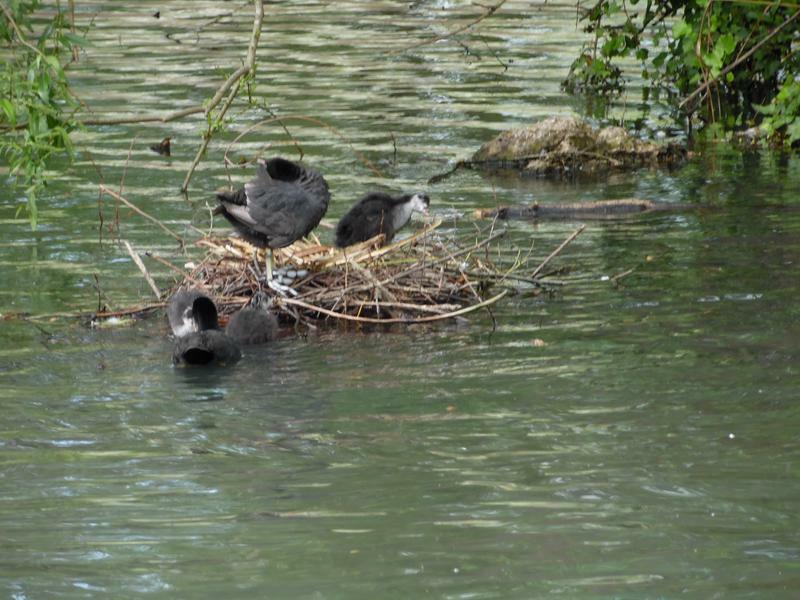 The third Coot family again. 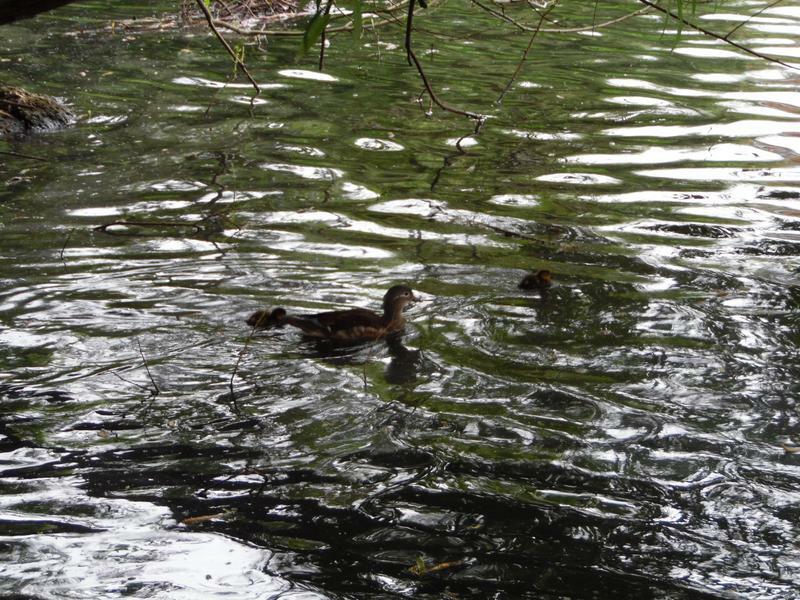 The first Mallard duckling seen here. 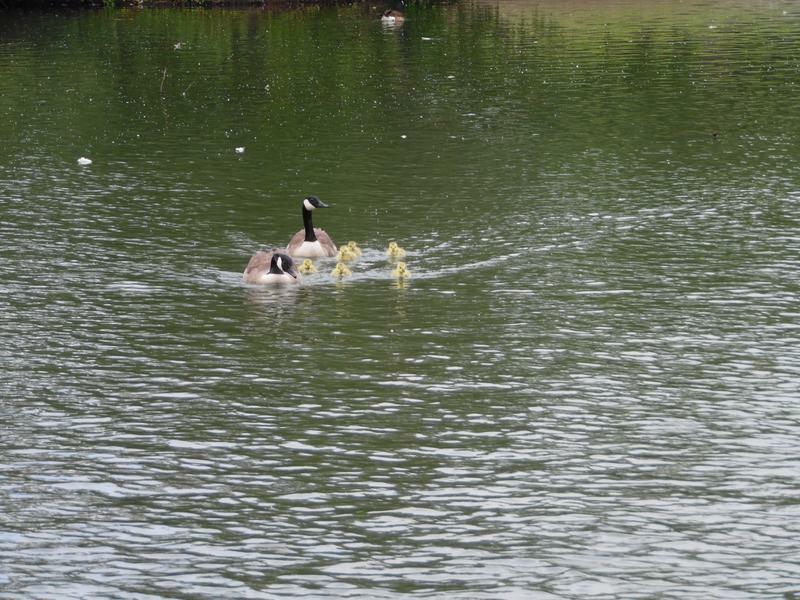 Less than a week old, staying close to mother. 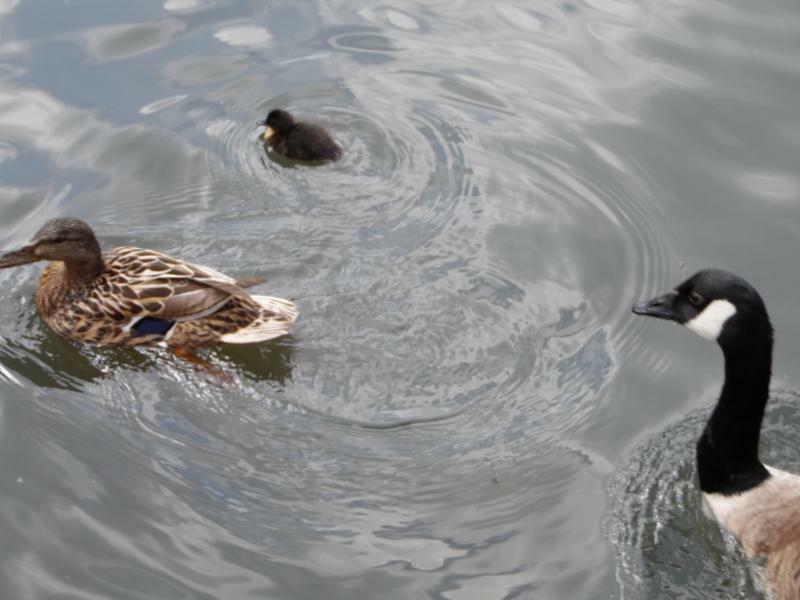 A Mallard ducking with it's parents. 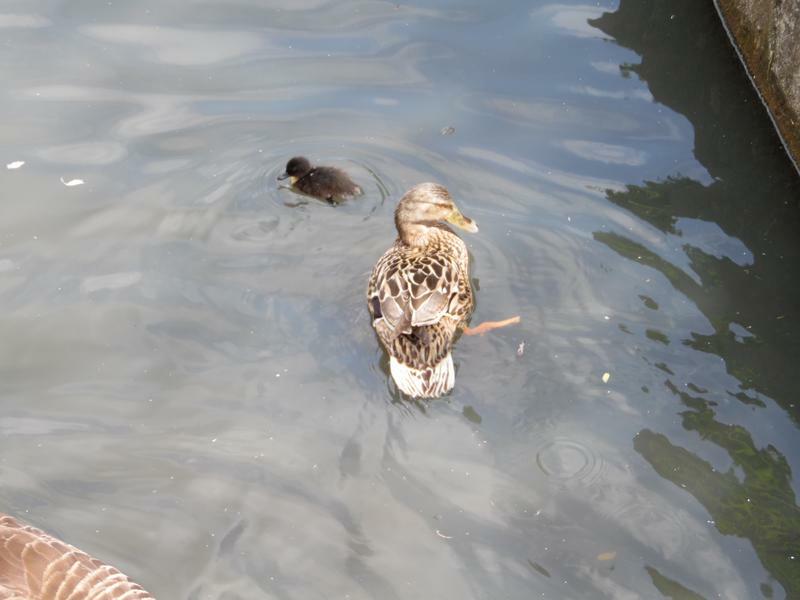 The Mandarin duckling following mother. 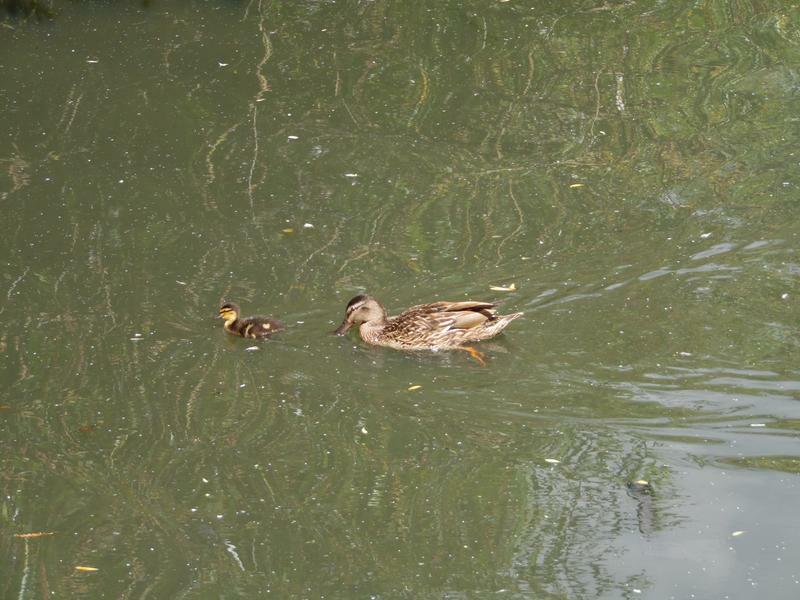 The Mallard duckling and mother on the water, the Mandarin mother has temporarily left here duckling to get food up on the path. 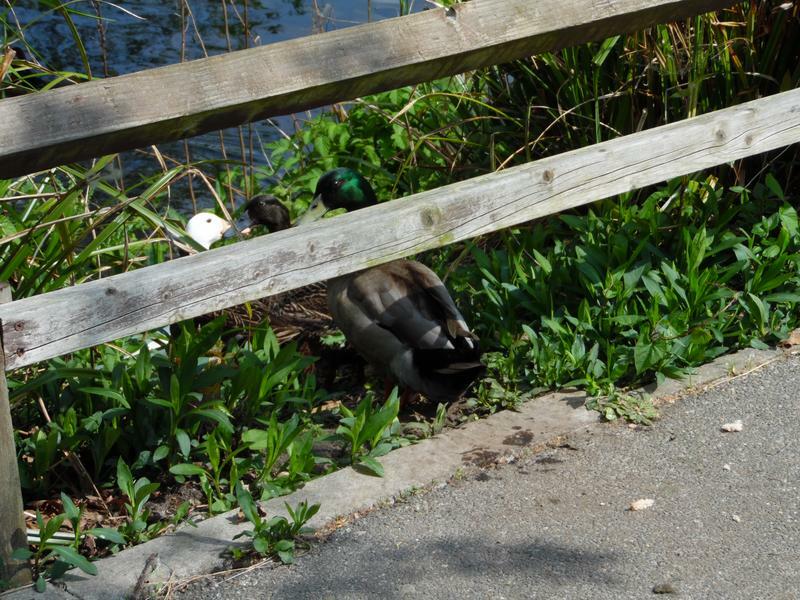 Two female ducks getting too close to each other. 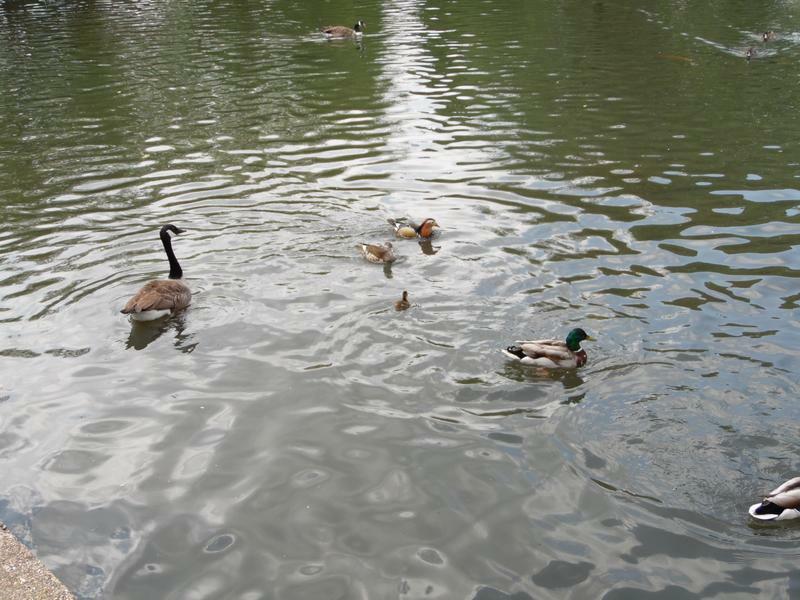 water or fallen victim to a heron or turtle. 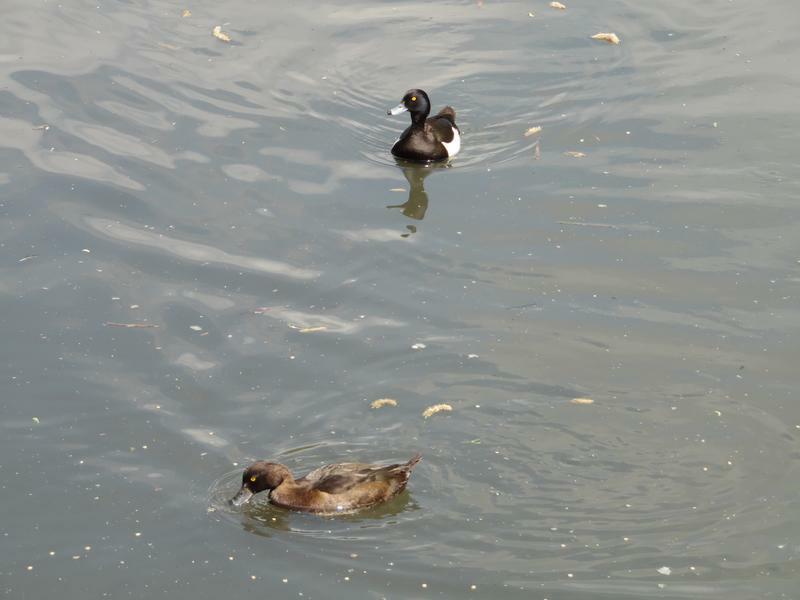 Don't often see Tufted Ducks here. 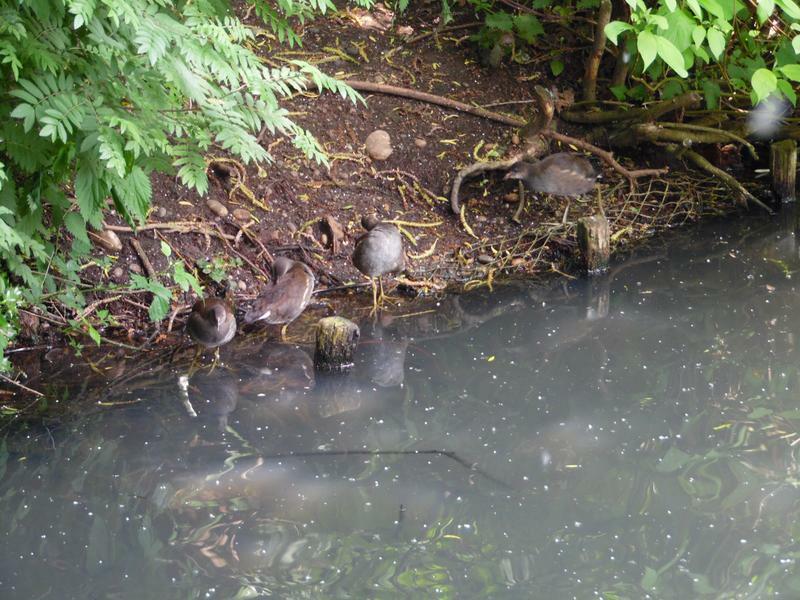 The Moorehen family is safe on the small island. 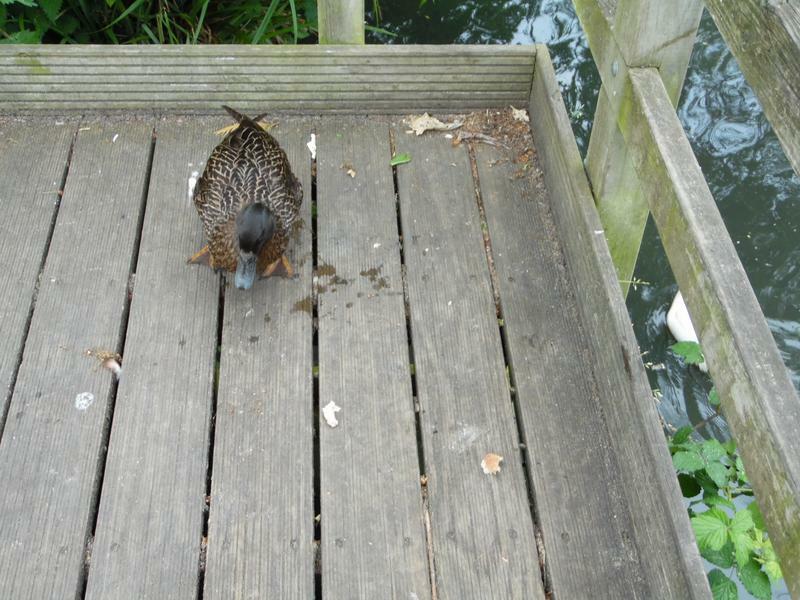 Final picture of the Mallard duckling. 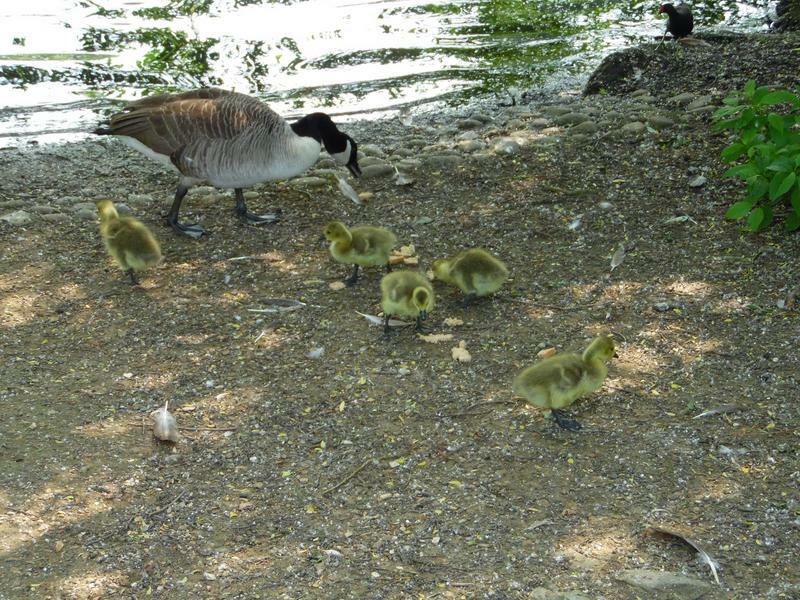 They normally have eight to 12 eggs, so only one left is sad already. 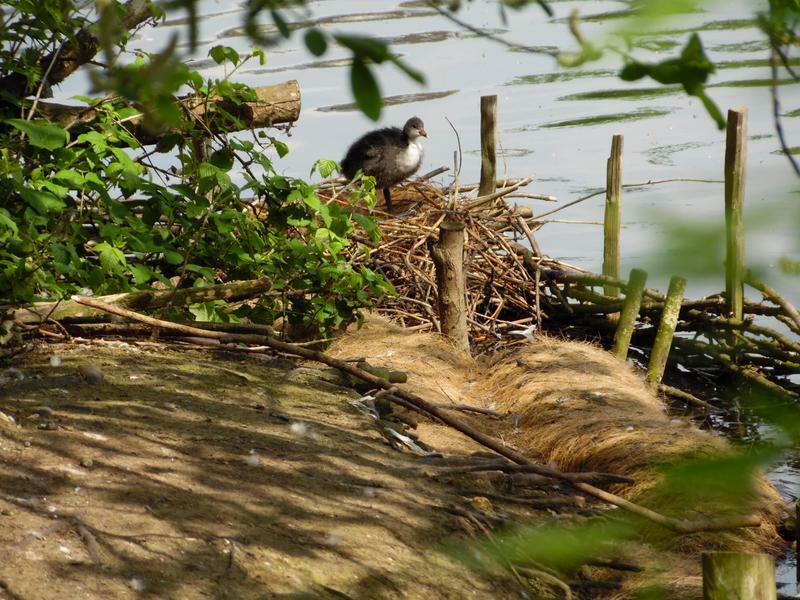 23rd May 2016, the Coot chicks are getting ever larger. 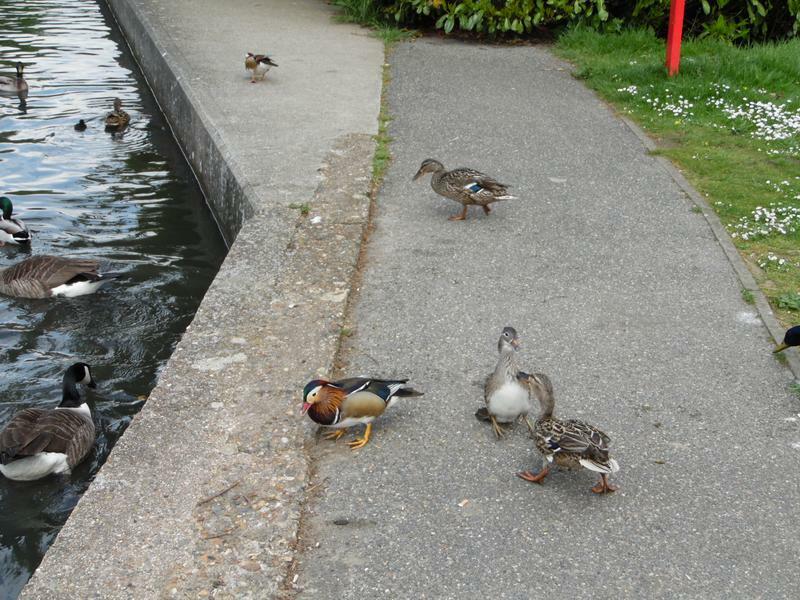 One Mallard comes close for food. 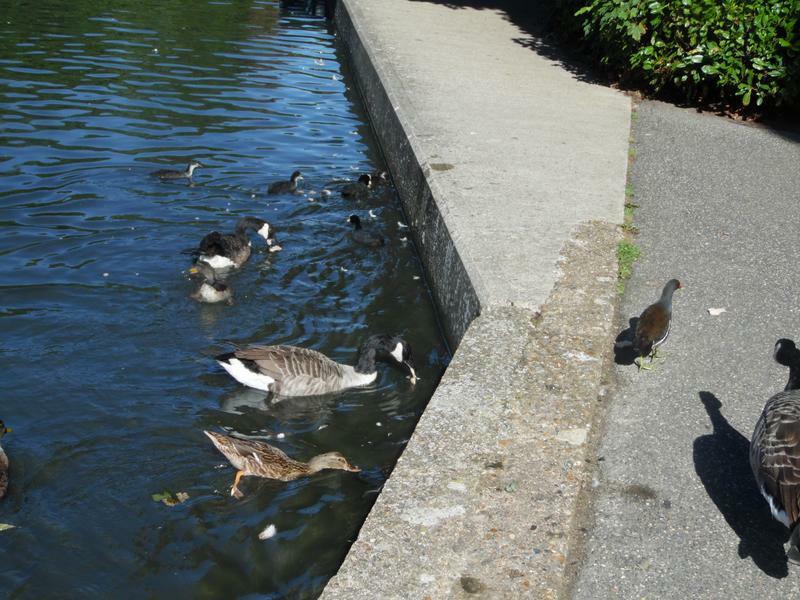 The Moorhen family is by the large island this week. 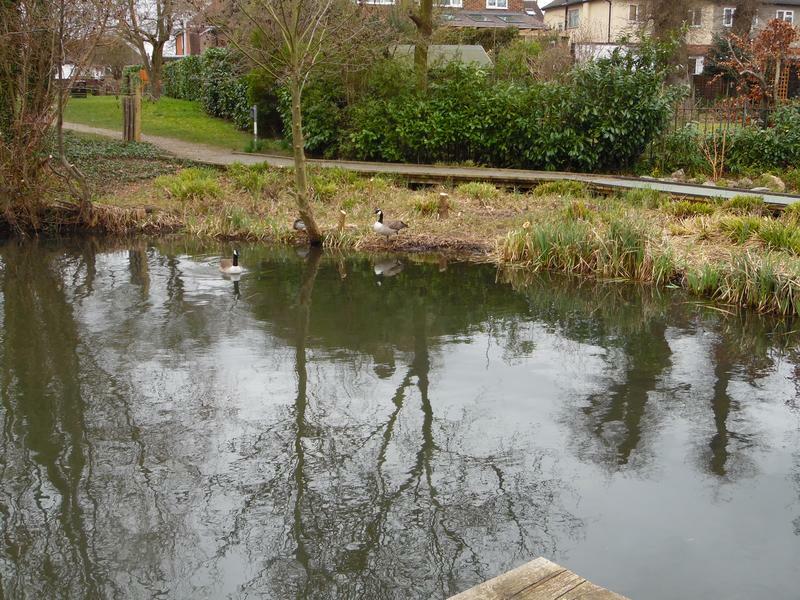 The far end of the pond. 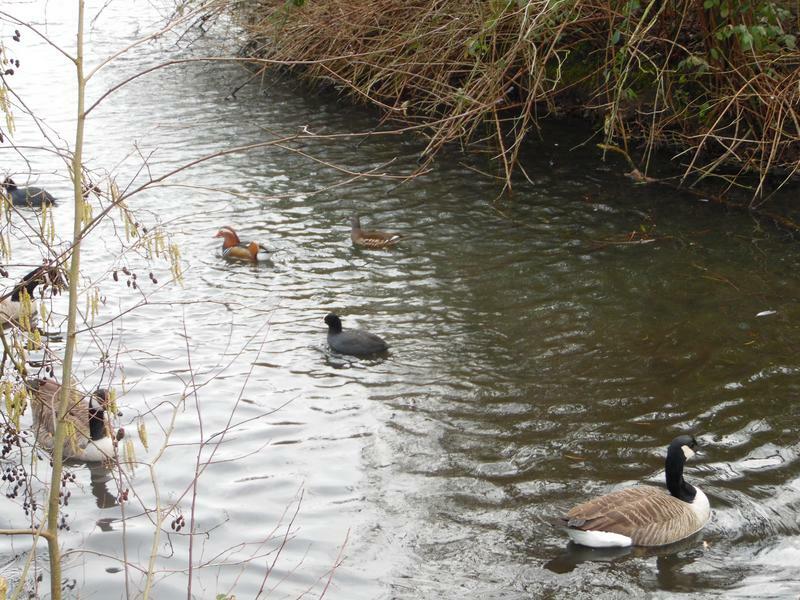 The third Coot family, red beaks gone. 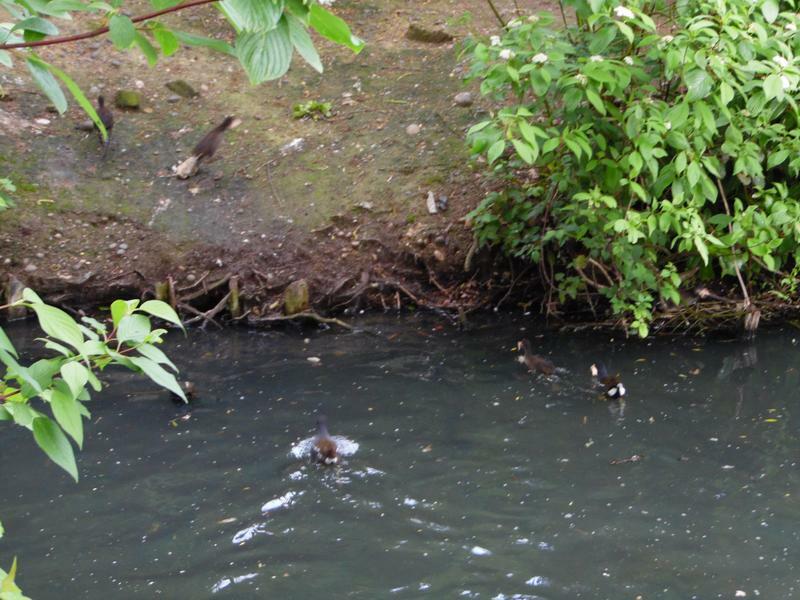 29th May 2016, a few mallards near the park gate. 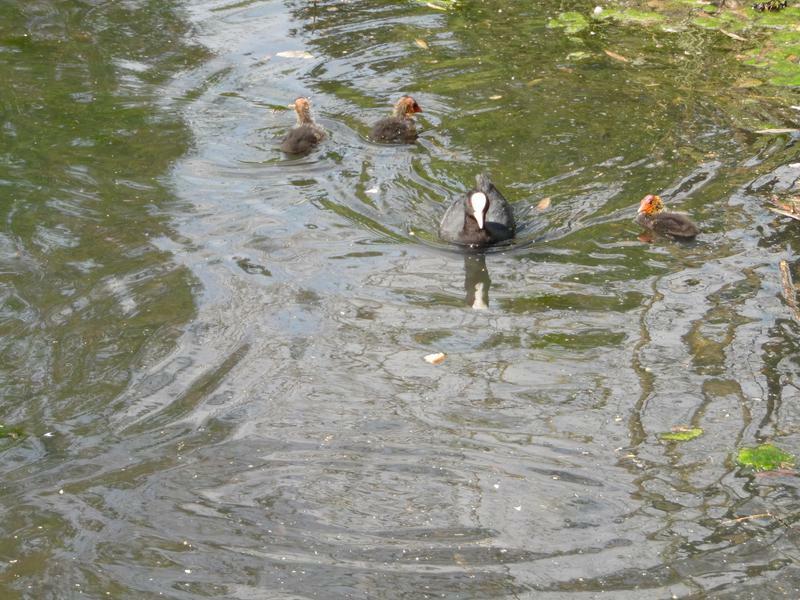 Note sure which Coot family this is. 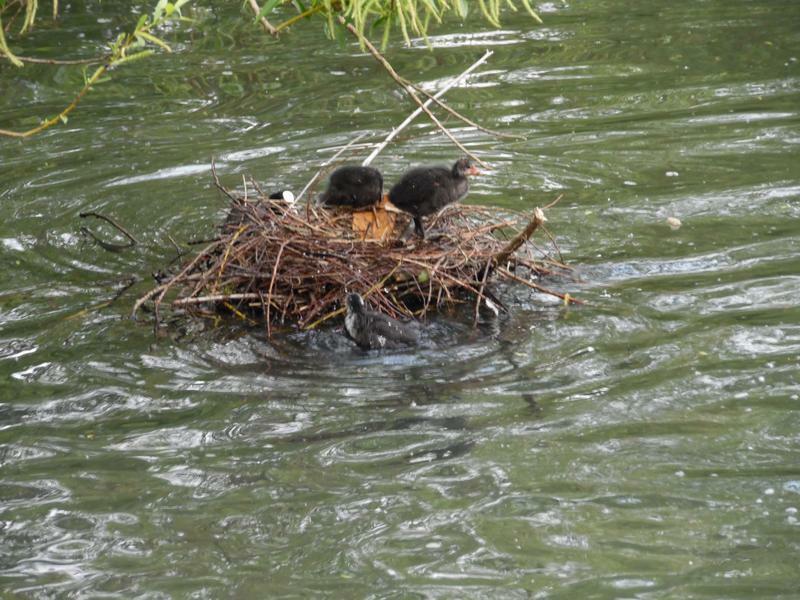 More Coot chicks on their nest. 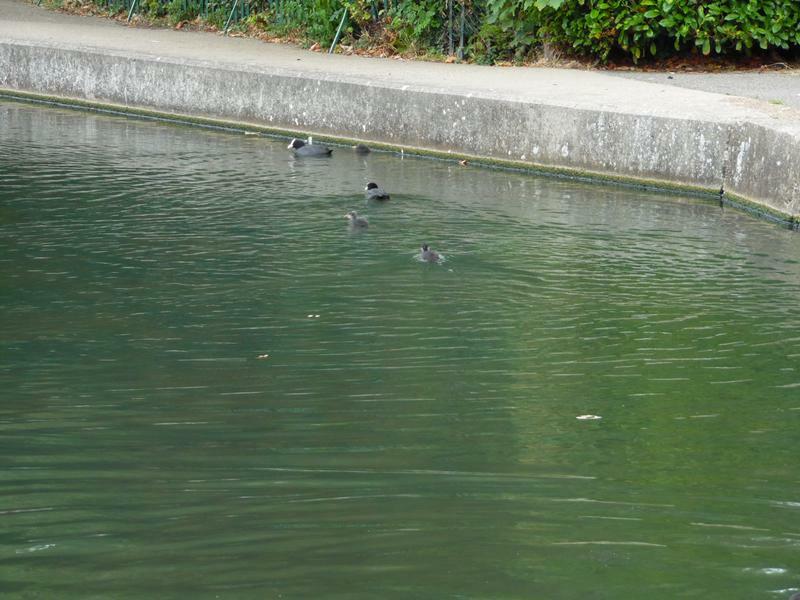 The Moorhens are beind the large island. 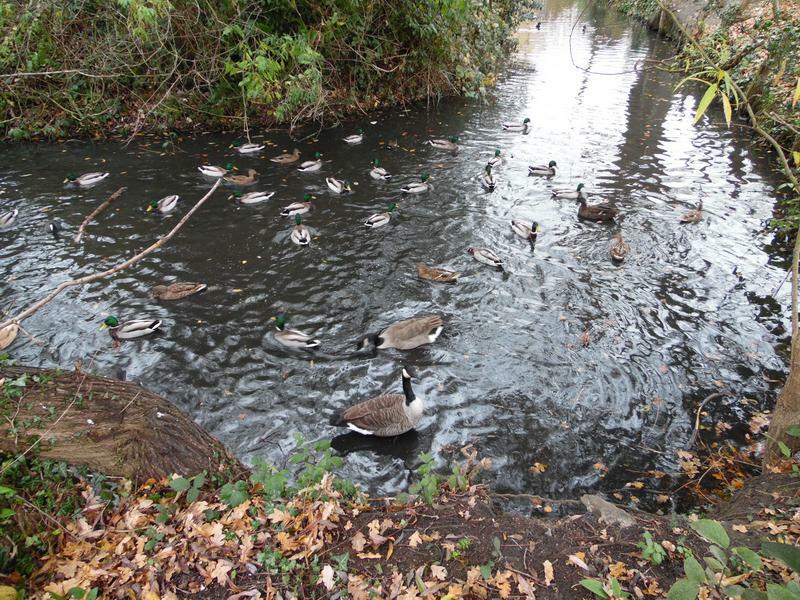 Ducks and geese behind the large island. 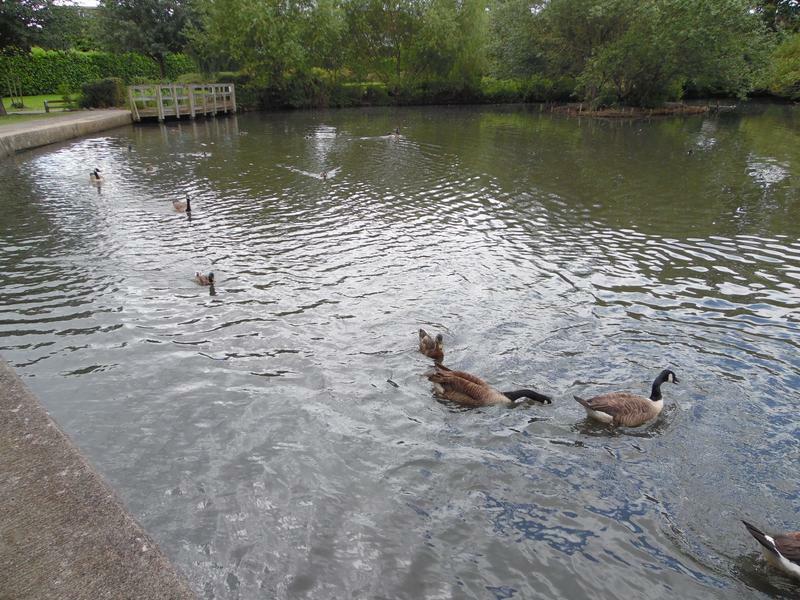 Just about to leave, and notice a Canada Goose family swimming towards us. 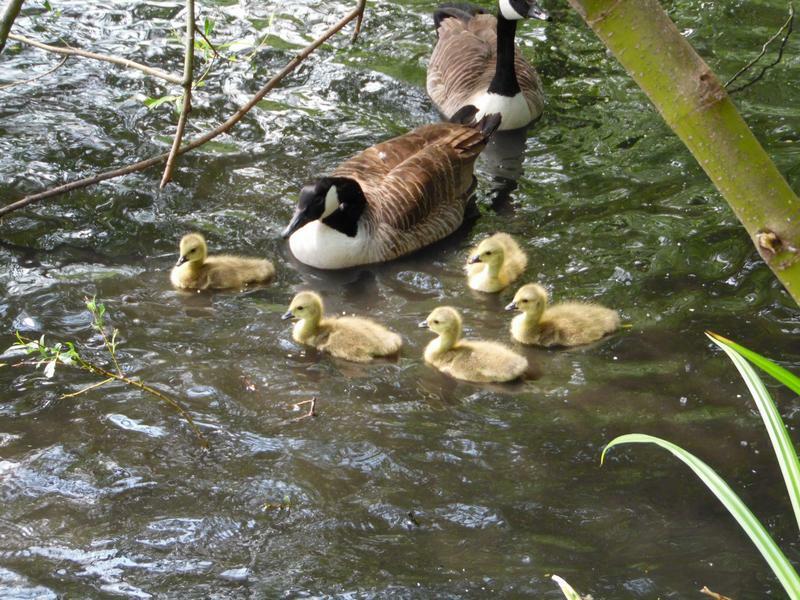 The goslings seem about a week old, must have missed them last week. 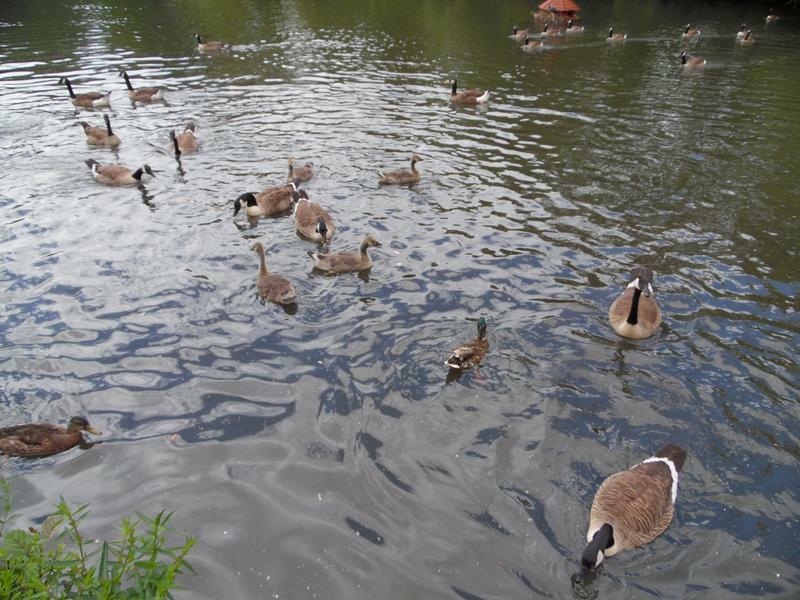 Six goslings eating duck pellets. 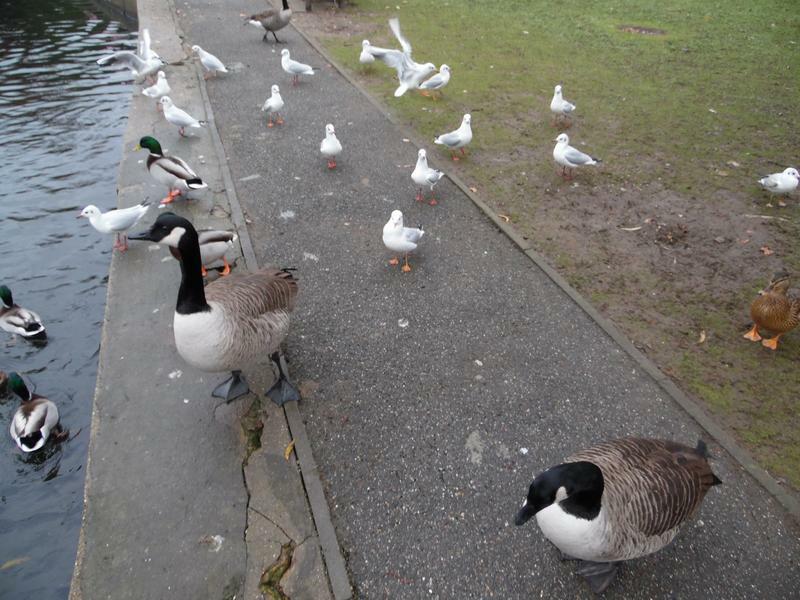 Everyone else comes to eat the pellets. 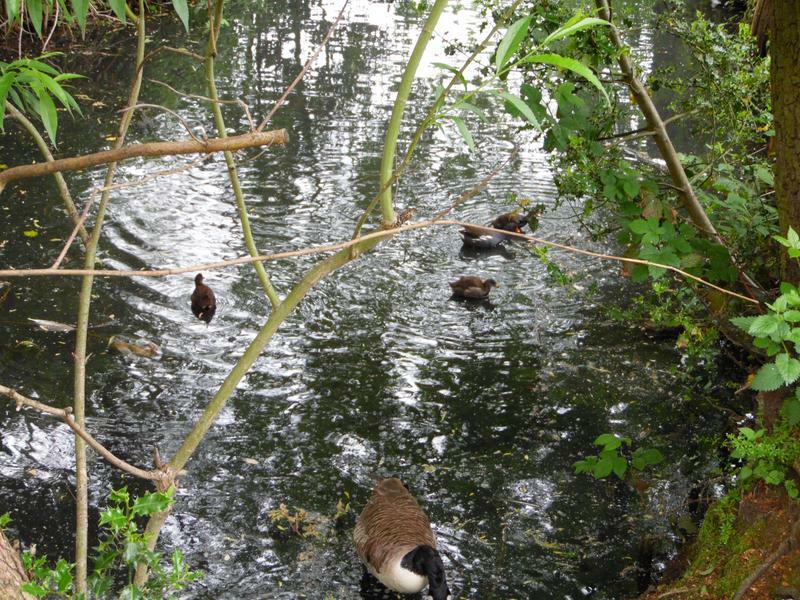 5th June 2016, warmer day, ducks not very hungry. 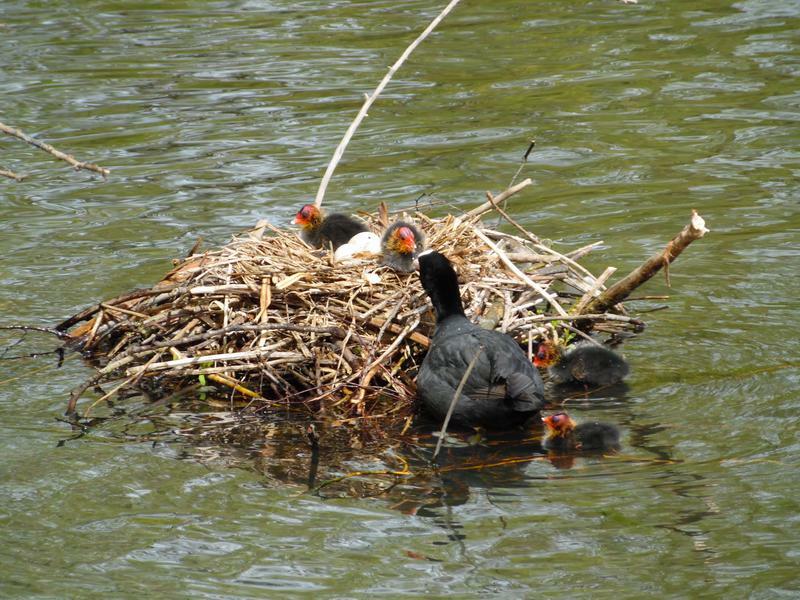 The Coot family is still occupying their nest. 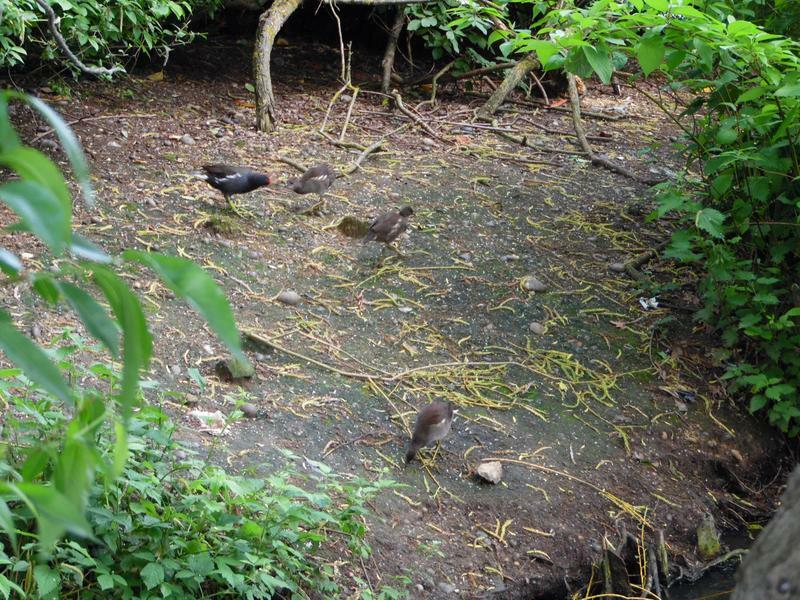 Several Moorehen chicks on the large island. 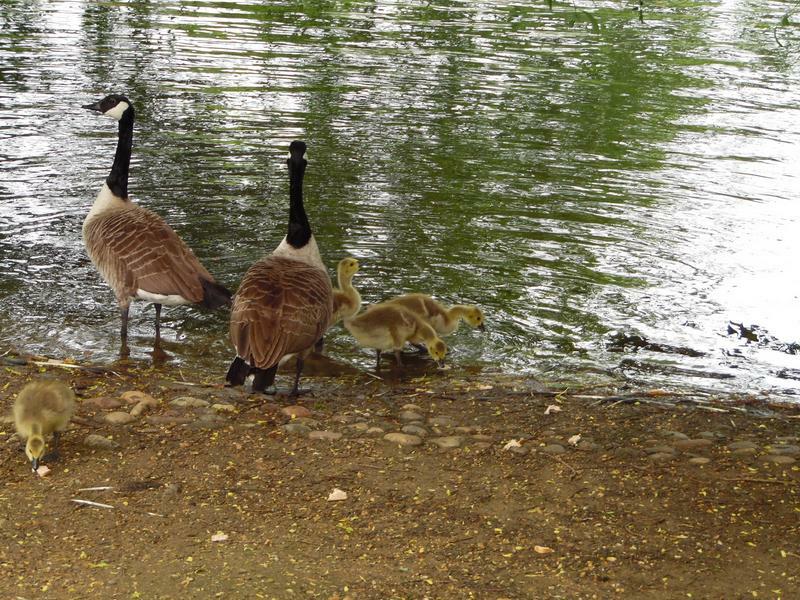 The new Canada Goose family is over at the beach area, now only five goslings. 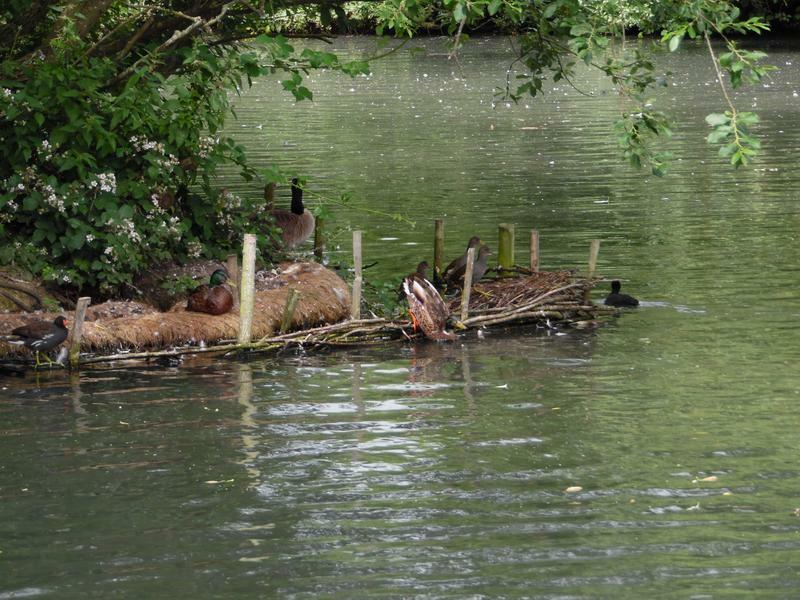 looks like many of the twigs have been stolen for another nest. 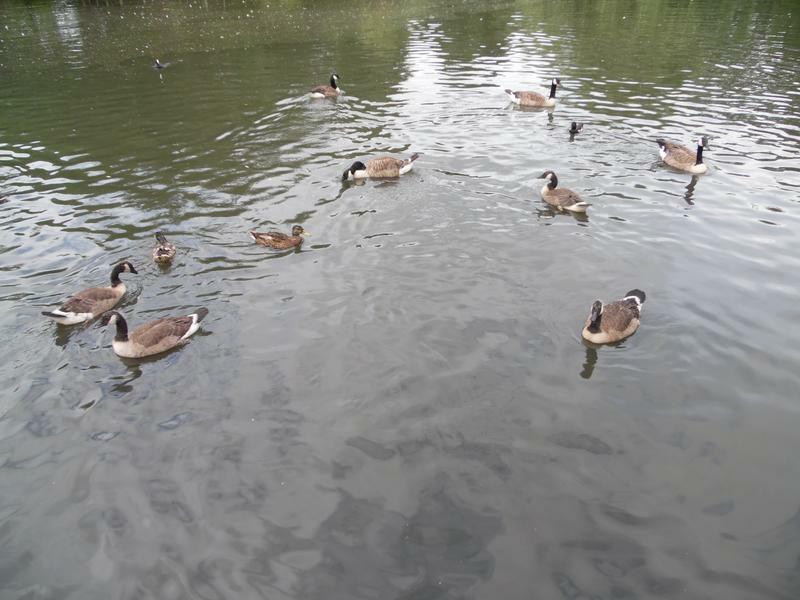 The goslings are back in the water. 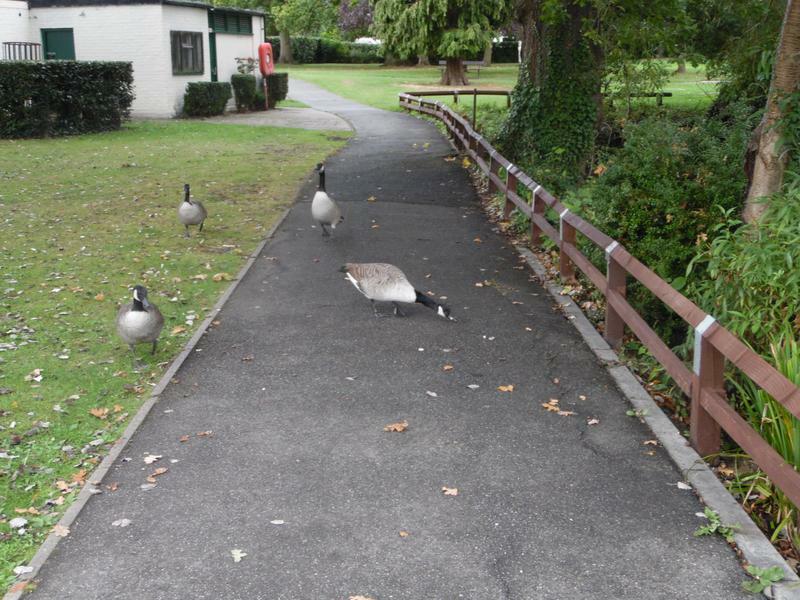 The goose family heading our way. 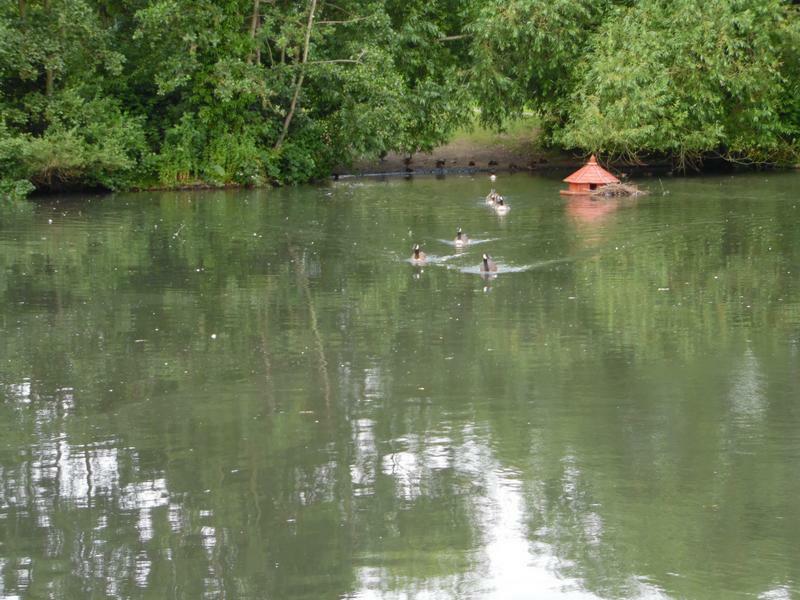 12th June 2016, only a single white duck in sight. 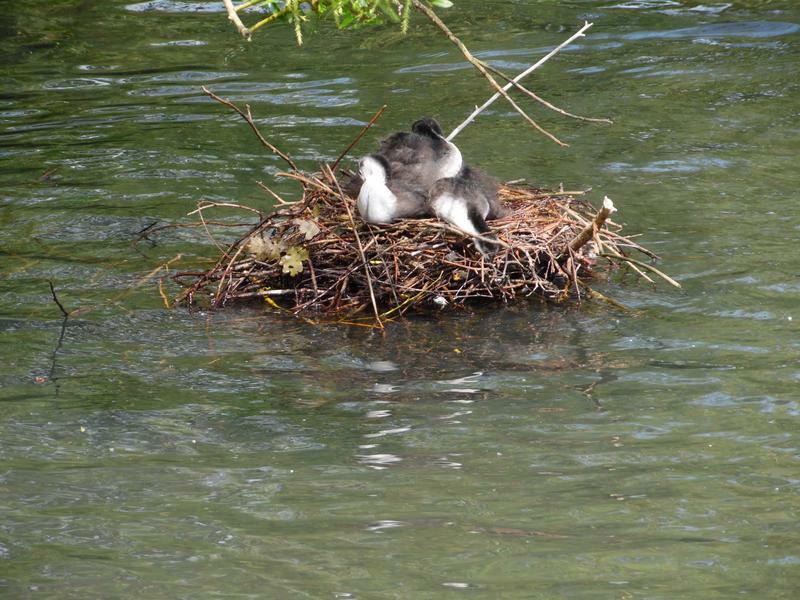 Coot chick still on the nest. 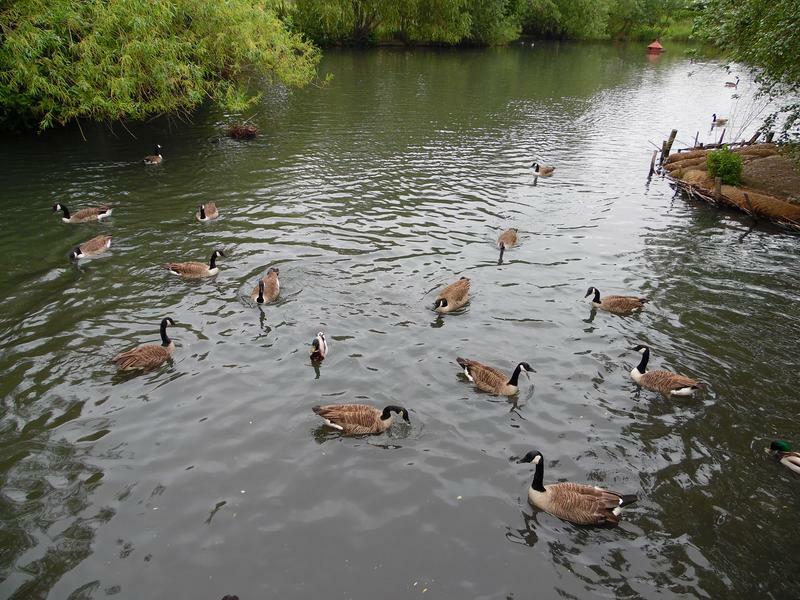 Lots of geese behind the large island. 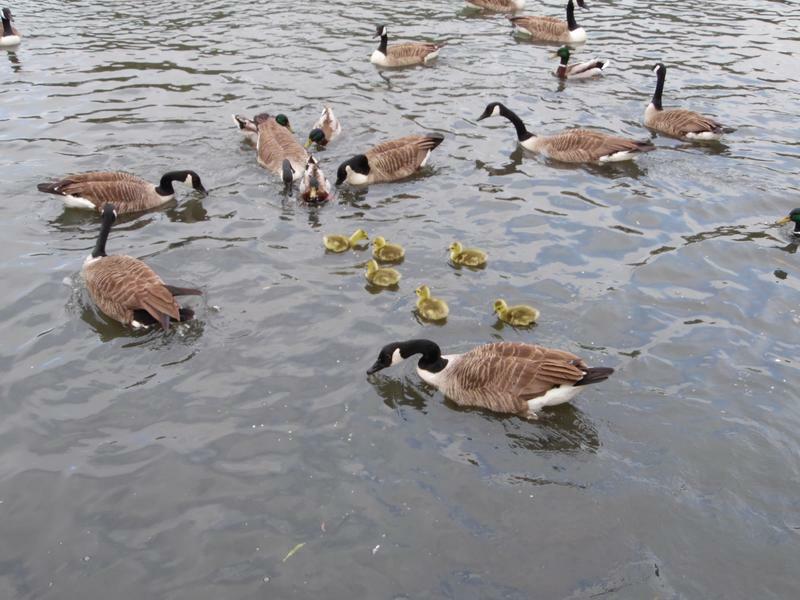 The goslings are a week older and growing rapidly. 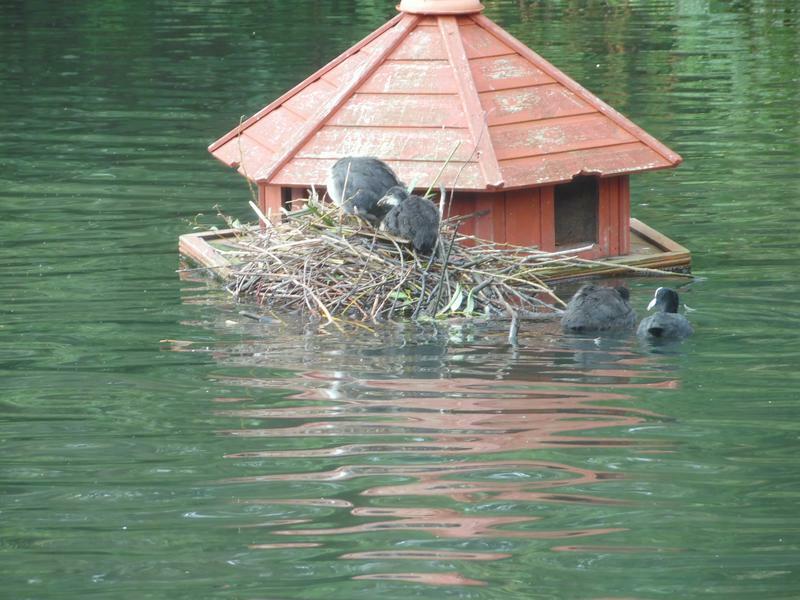 Coot family around their nest, clearly the duck house was inadequate. 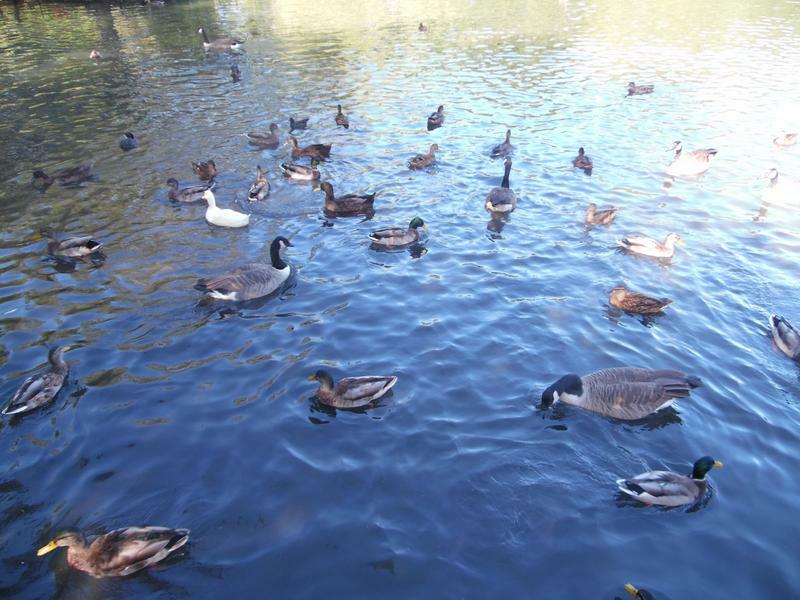 Ducks and geese around the pond. 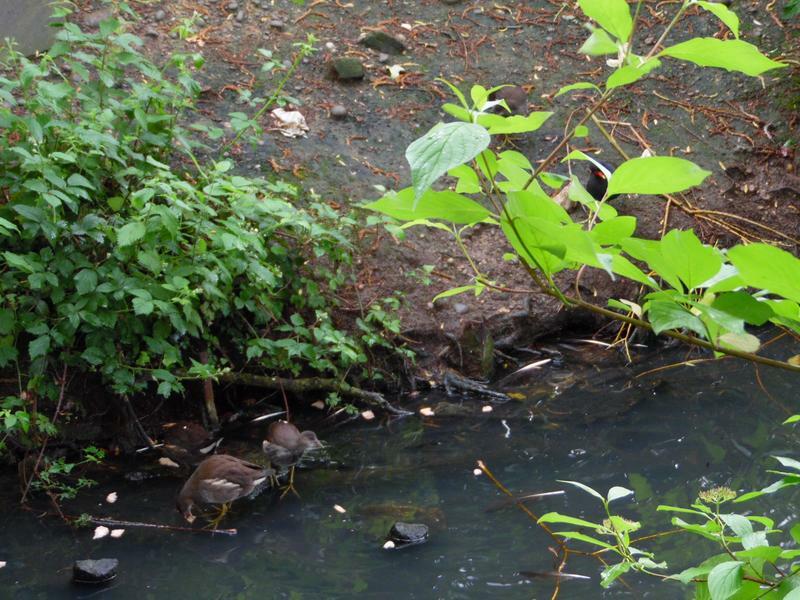 19th June 2016, two Moorhen chicks looking for food. 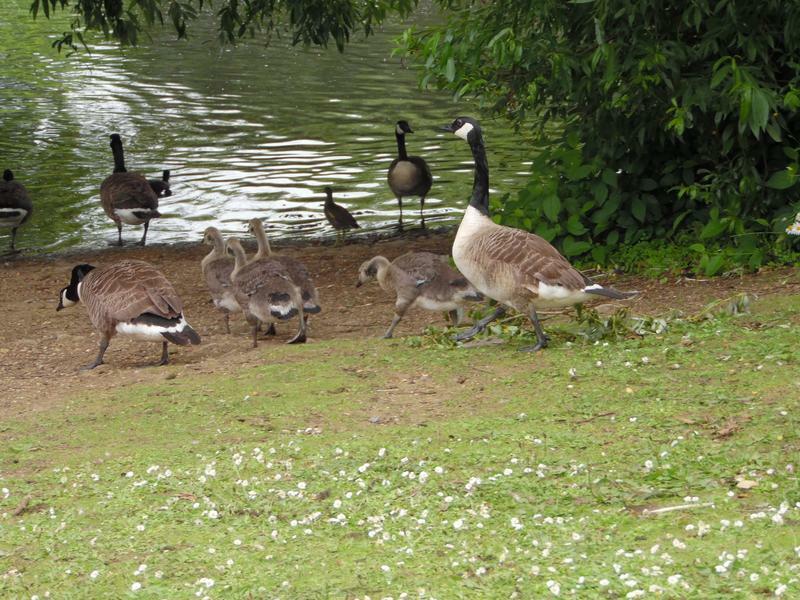 The goslings were on the small island, and head towards us. 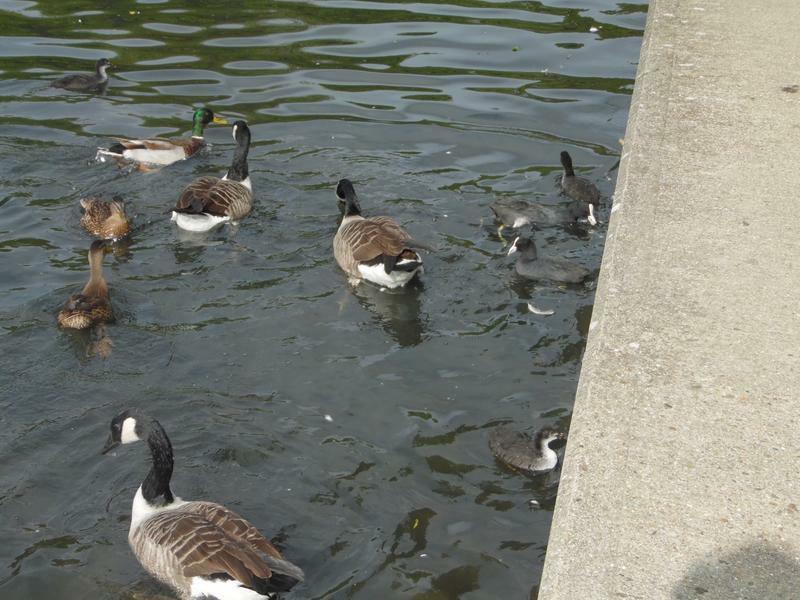 Goslings trying to keep ducks away from their food. 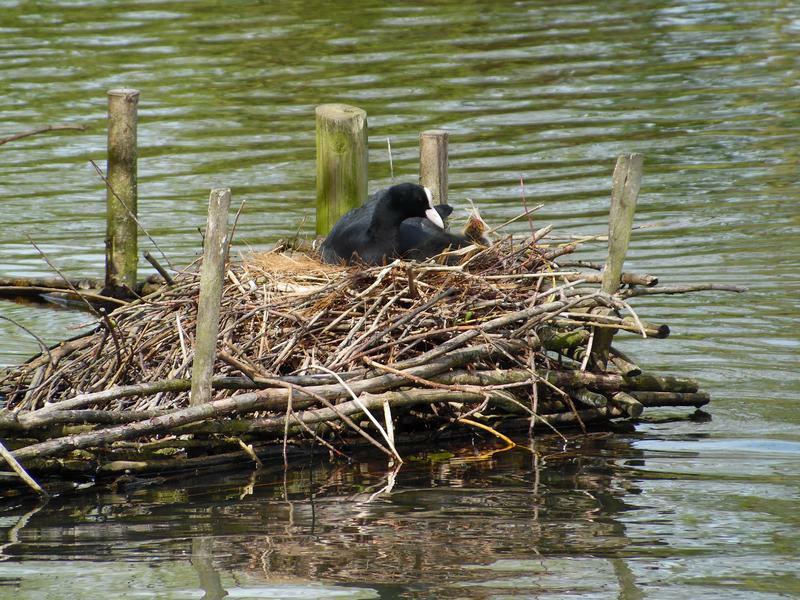 After several weeks, the Coot nest is still busy. 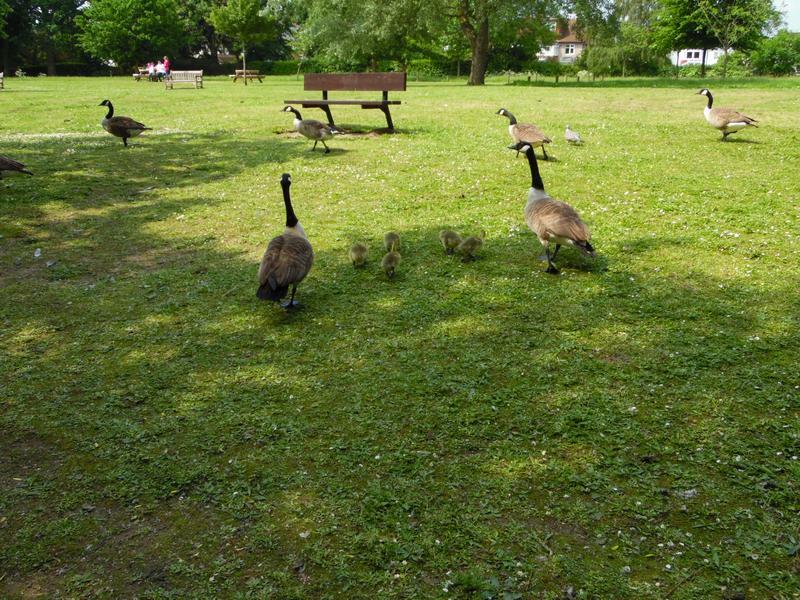 The geese family is back on the grass. 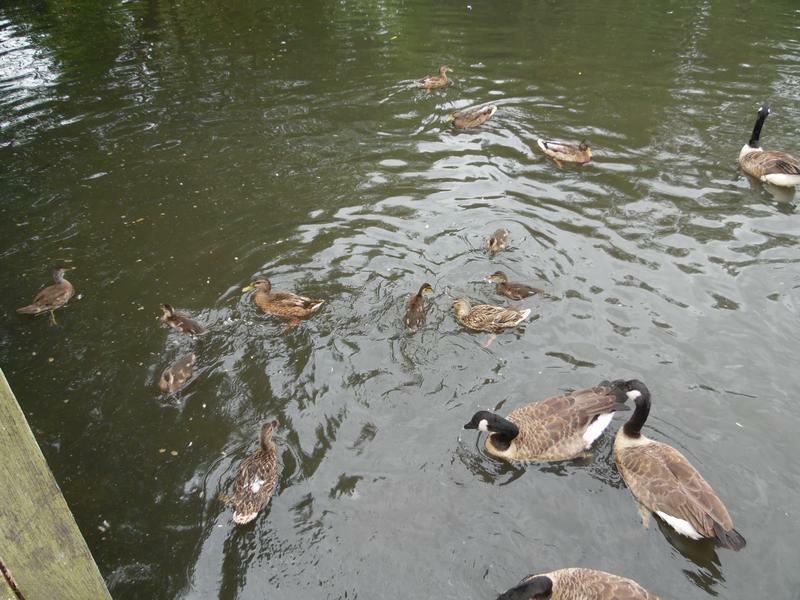 More ducks and geese between the two islands. 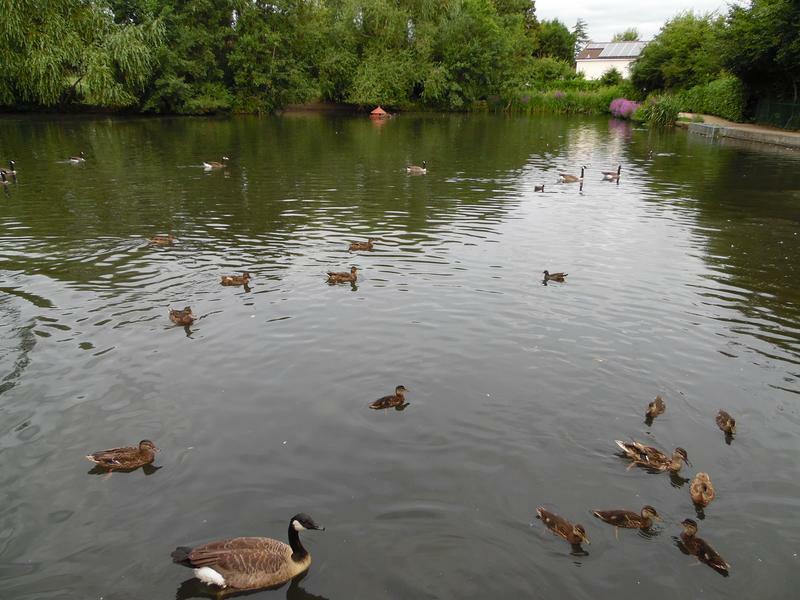 3rd July 2016, the pond is quieter than normal, a lot of geese are on the grass. 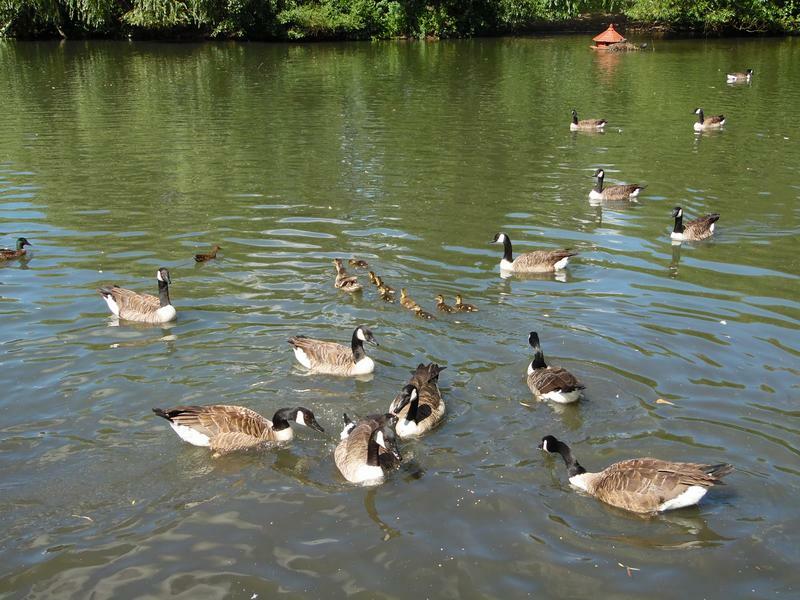 The geese family know where to find food. 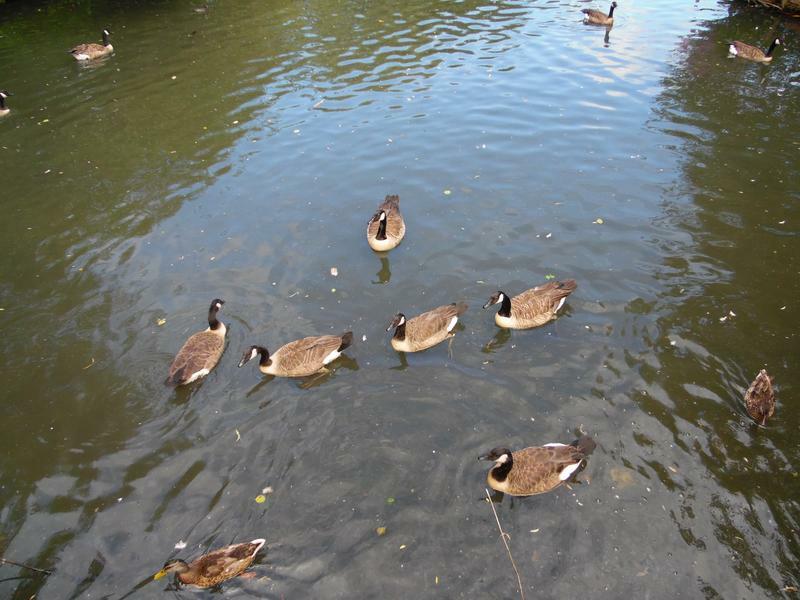 More geese are entering the water via the beach area. 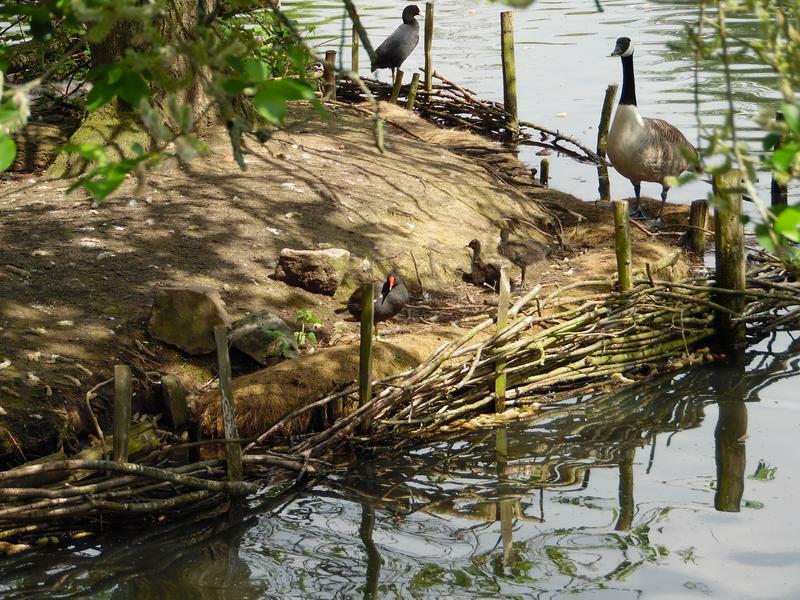 The Coot has managed to rebuild her nest a little, but is still troubled by geese getting to close. 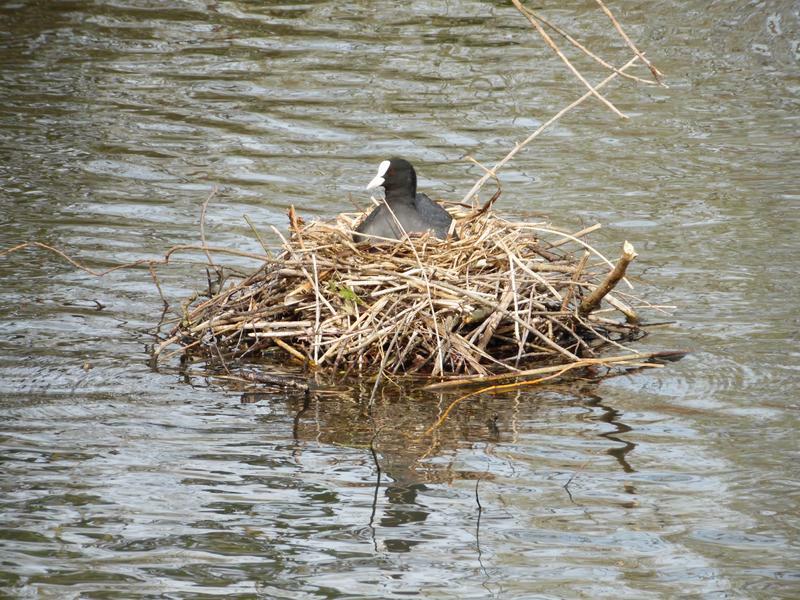 Another Coot nest is quieter now. 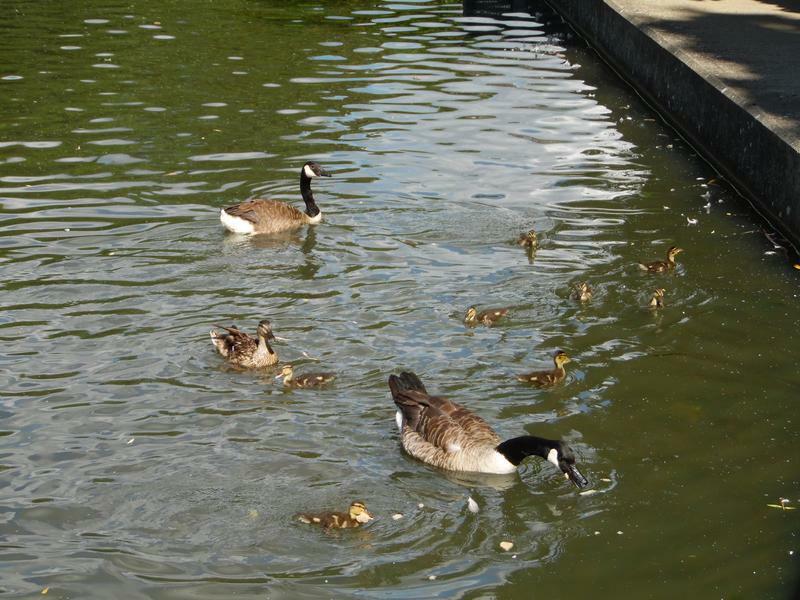 The goslings are now about five weeks old and half grown, by August they will be full sized geese. 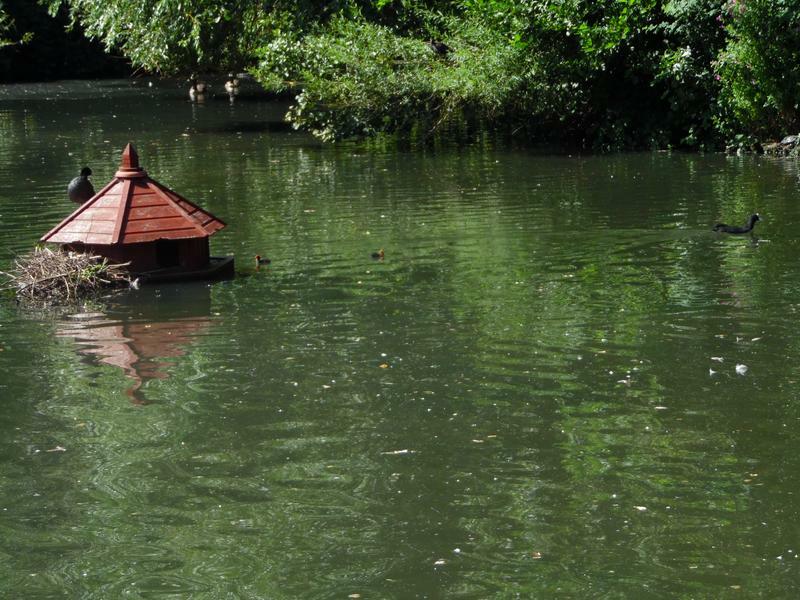 Quieter near the small island. 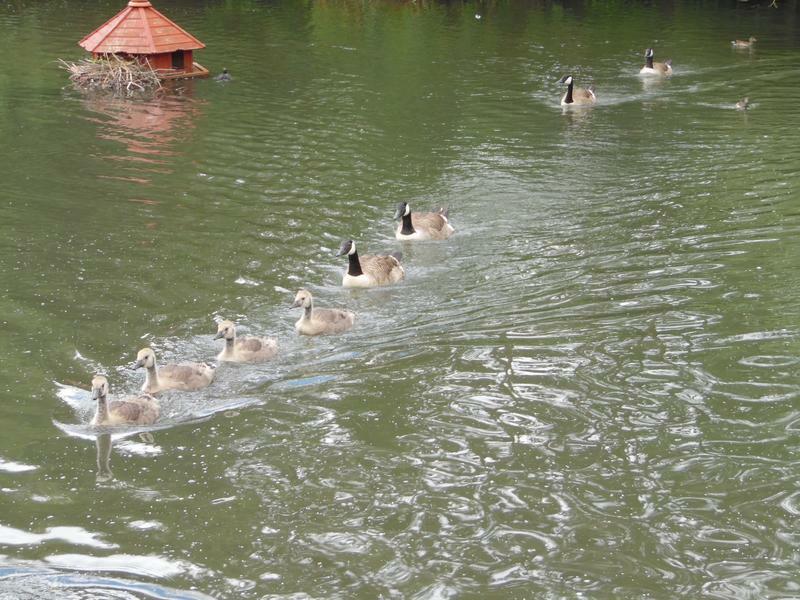 But lots of geese heading our way. 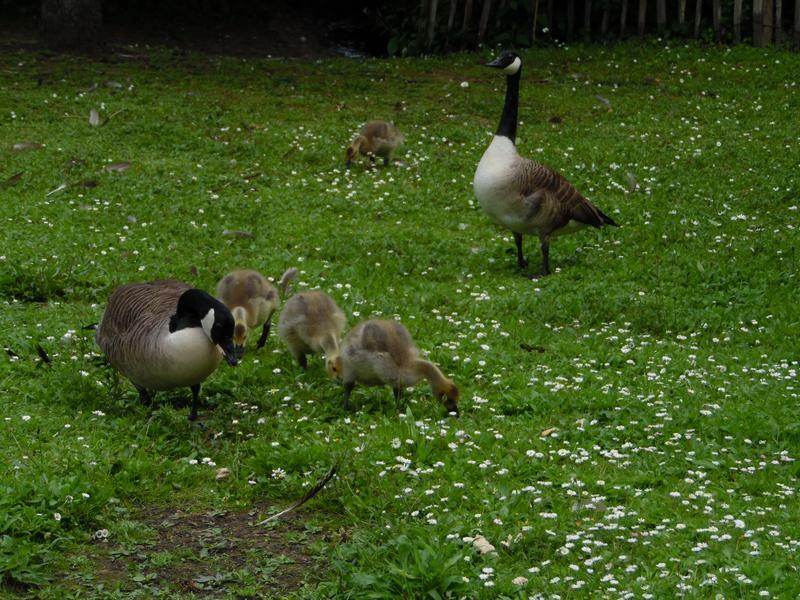 Meanwhile the goslings are foraging on the grass, eating duck pellets. 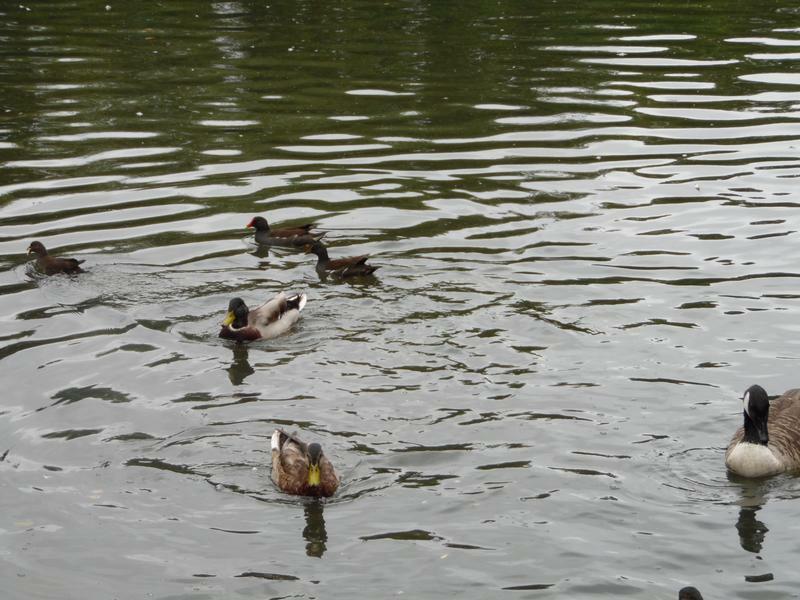 Before heading back the water. 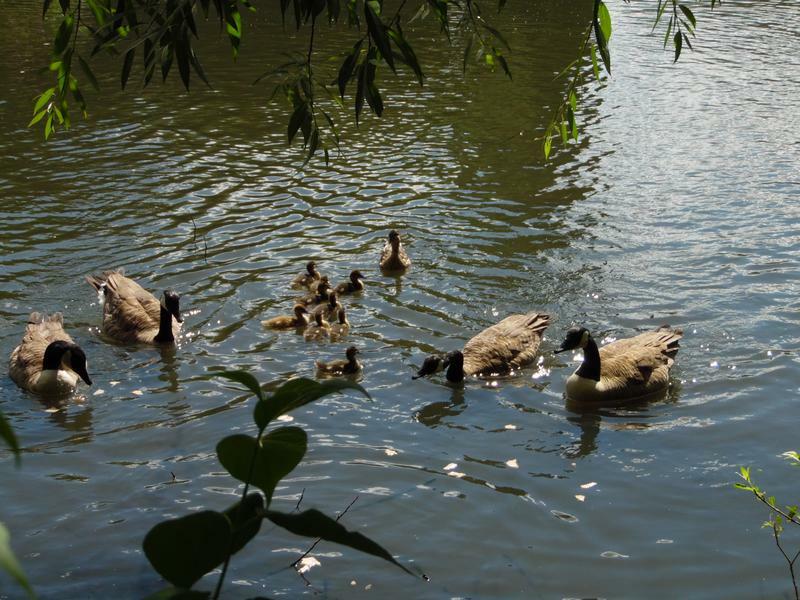 10th July 2016, the goslings are almost fully grown. 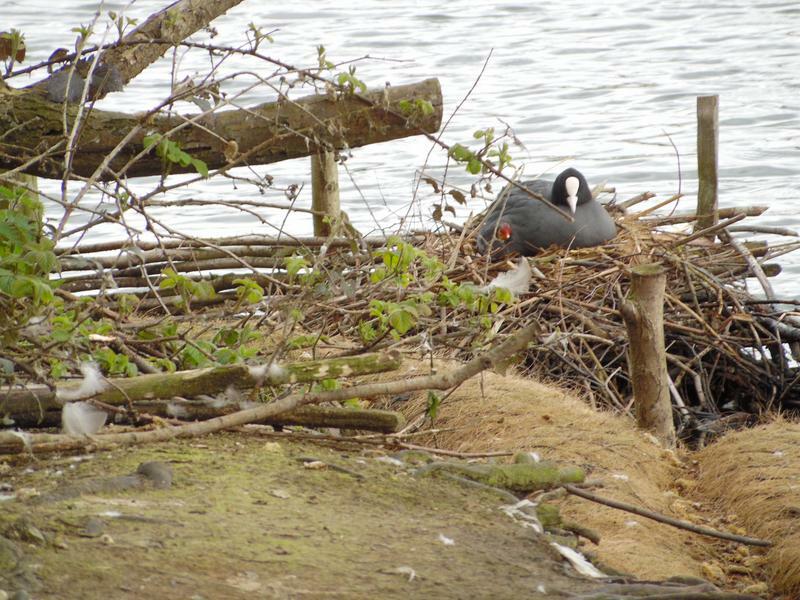 The Coot nest on the small island has visitors. 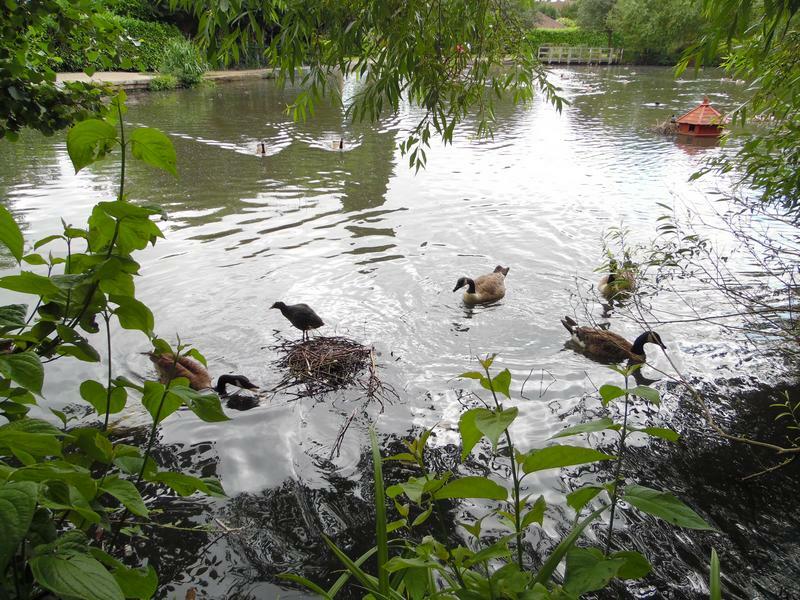 Several ducks and geese behind the large island. 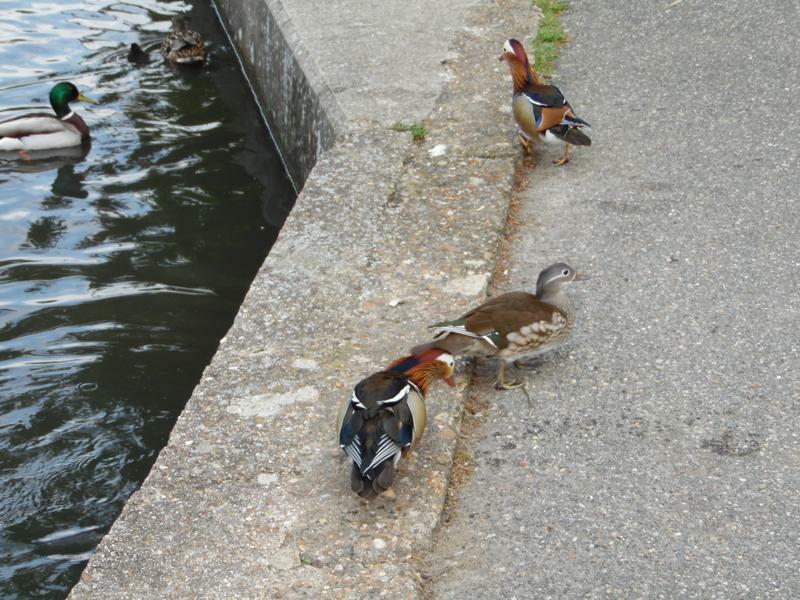 A Mandarin duck with two new ducklings, a few days old, I saw about six scattered around the pond. 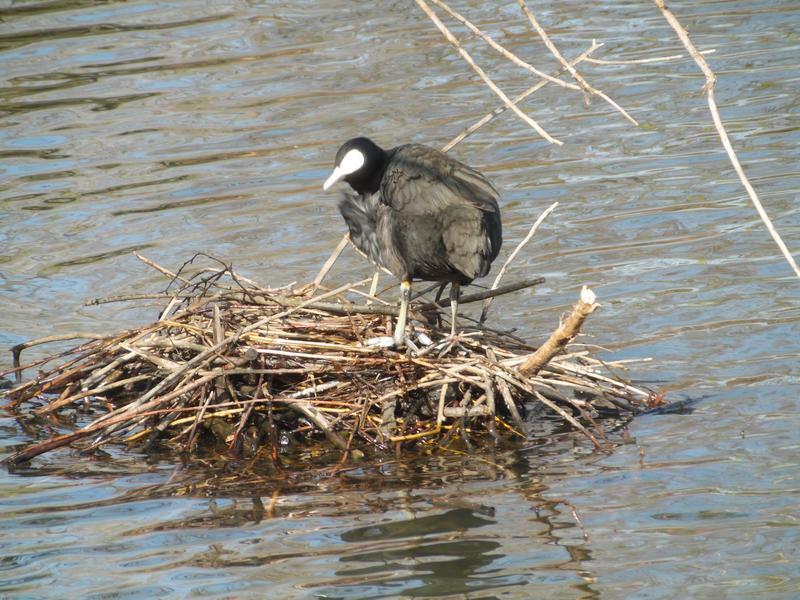 The Coot sitting on her nest. 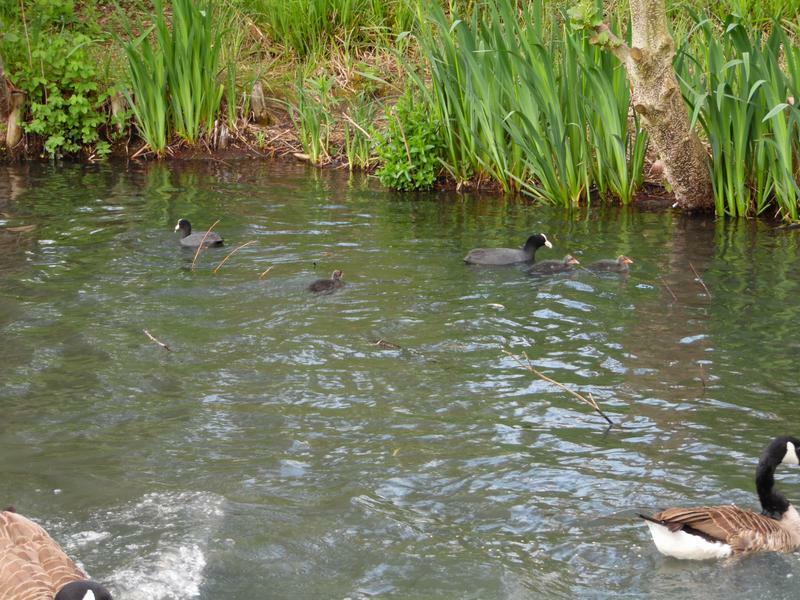 The Mandarin mother behind the large island, with two ducklings. 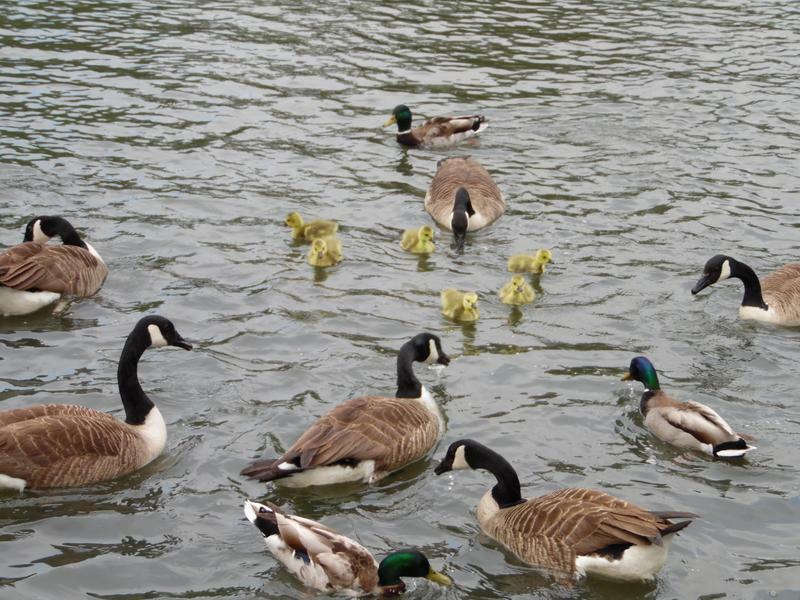 No sign of dad, but they often leave once the eggs are layed. 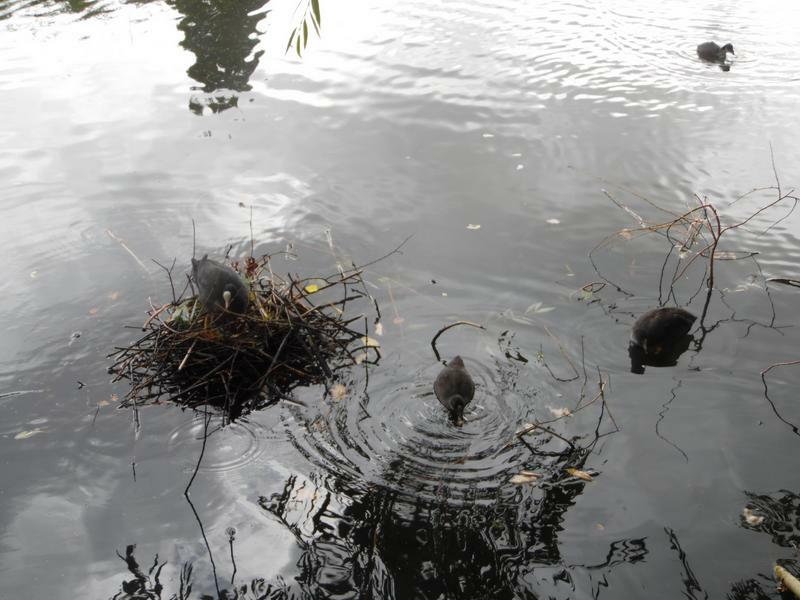 An almost fully grown Coot family. 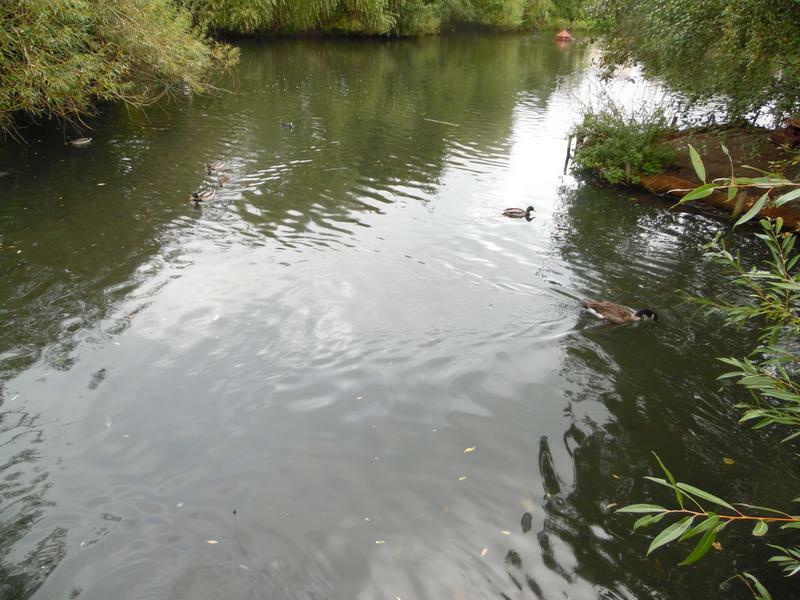 17th July 2016, the pond appears deserted. 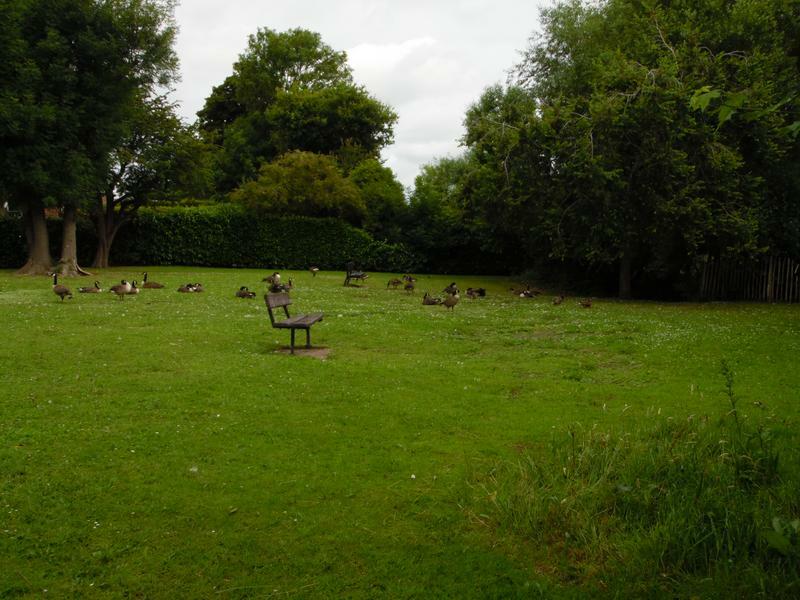 But many of the geese are out on the grass on the far side, and rapidly head our way when they realise food is available. 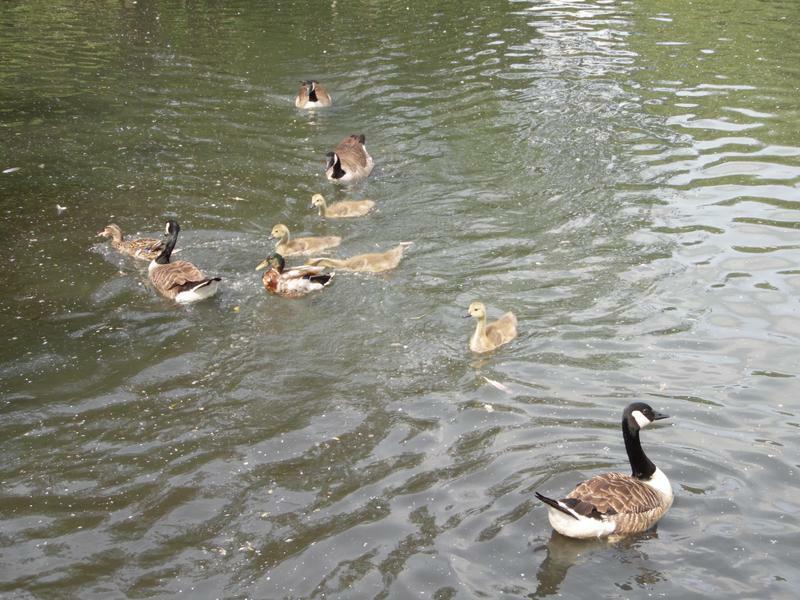 The goose family now fully grown, but you can hear their twittering. 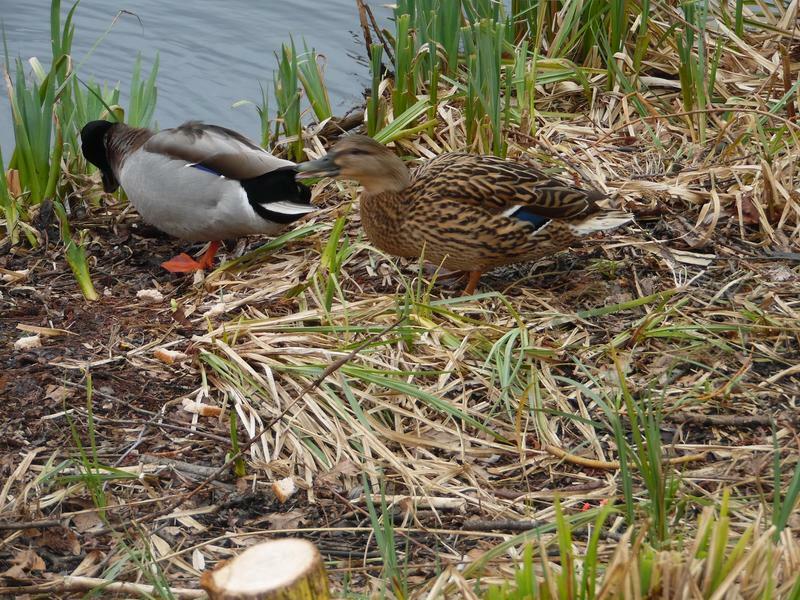 A couple of Mallards arrive. 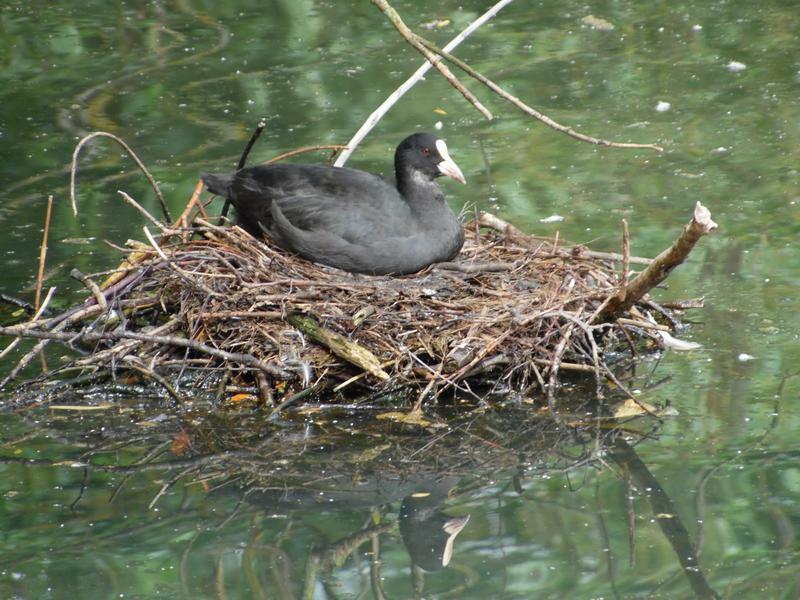 Coot sitting on her nest, no dea how they move the large branches to build their nest. 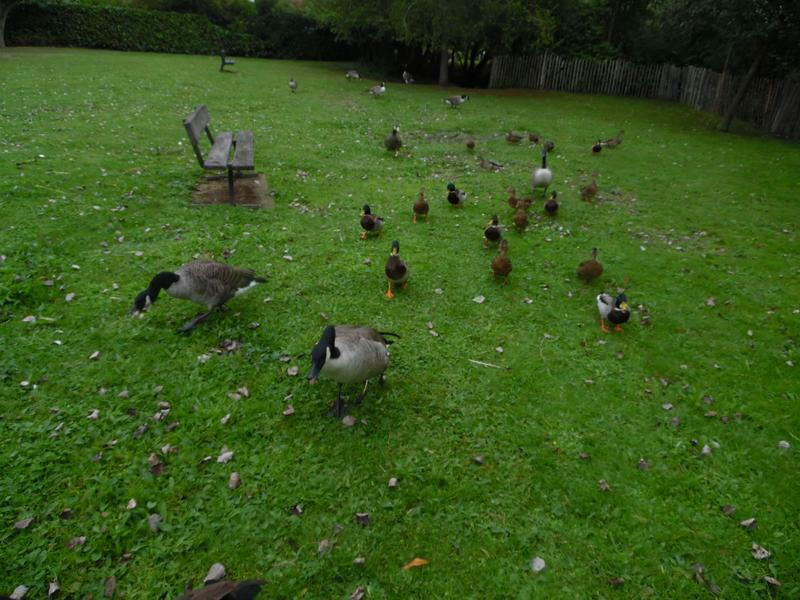 The rest of the Canada Geese are on the grass. 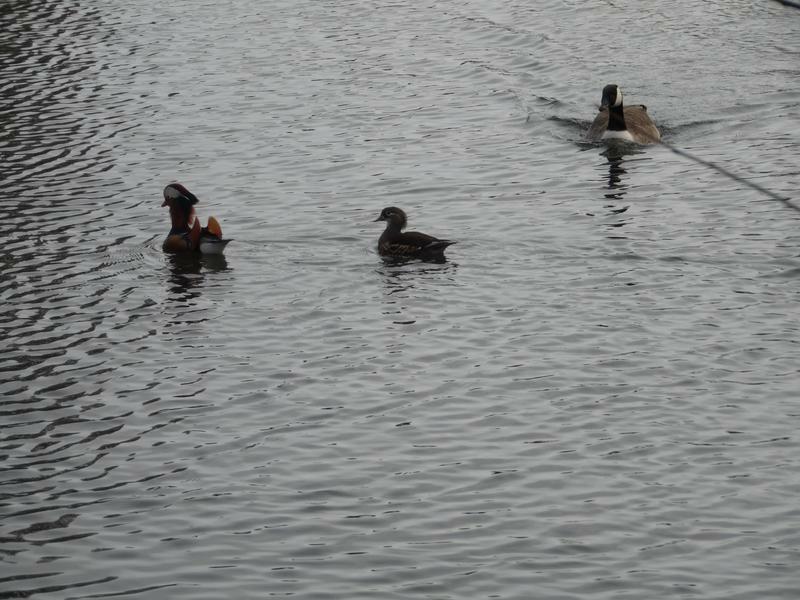 Several Mallards on the beach. 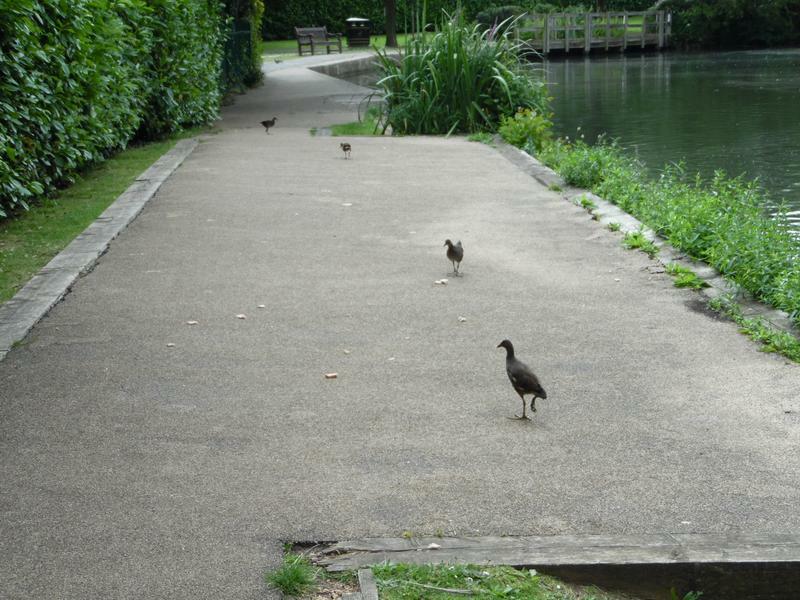 The park is quiet, allowing a Moorhen family to take over the path. 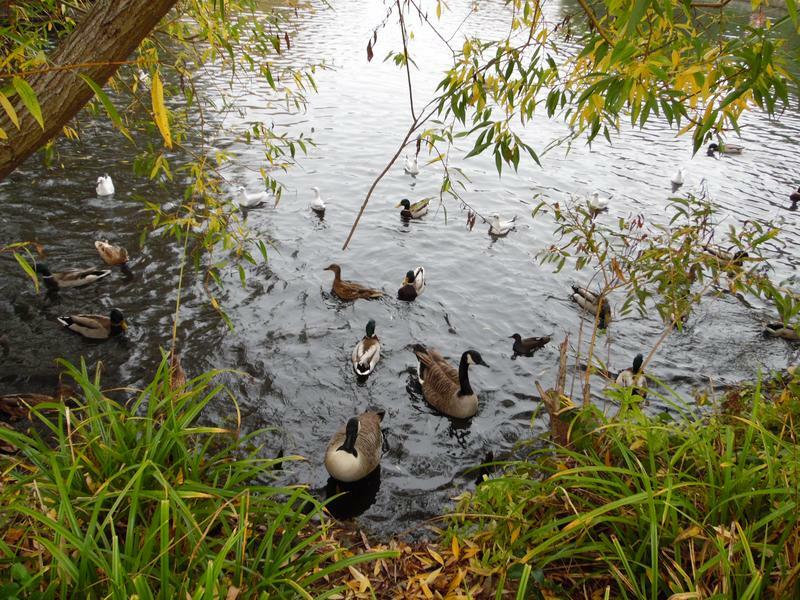 Mallards and geese on the small island. 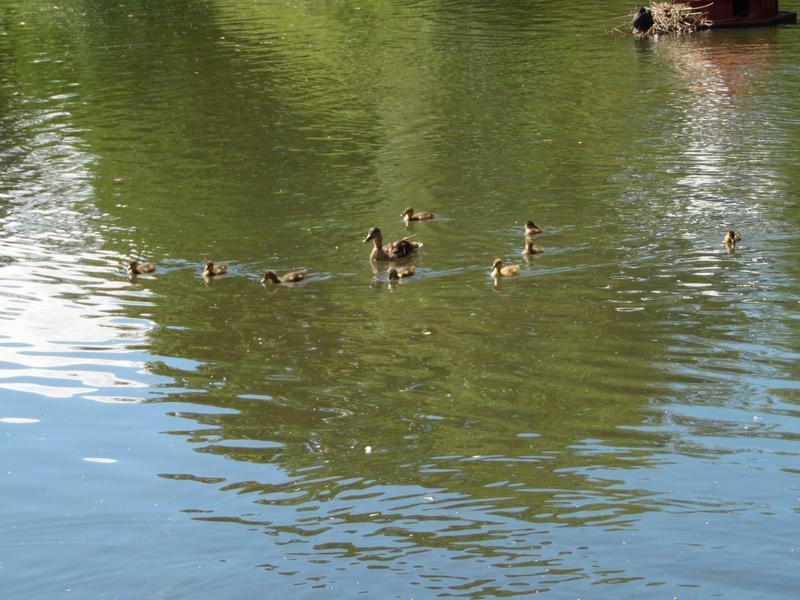 July and there has been a lot of Mallard nesting and new ducklings. 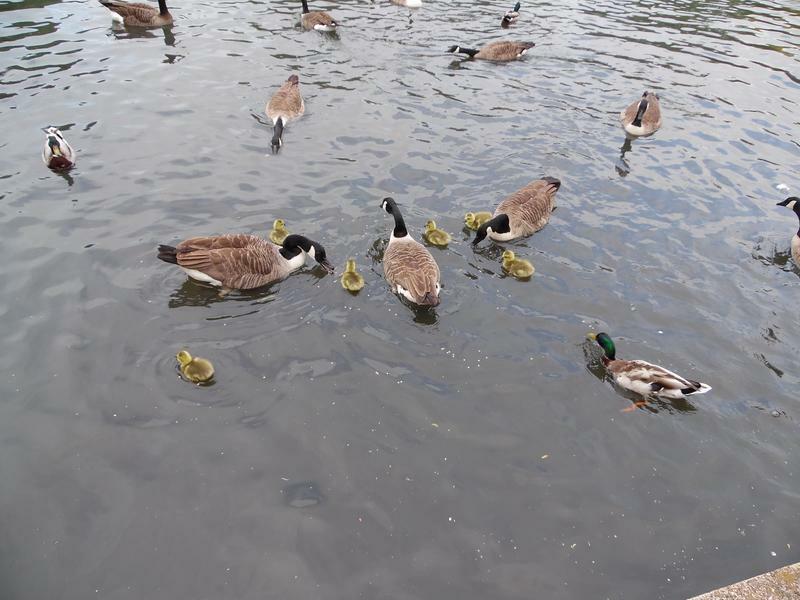 Several ducklings here. 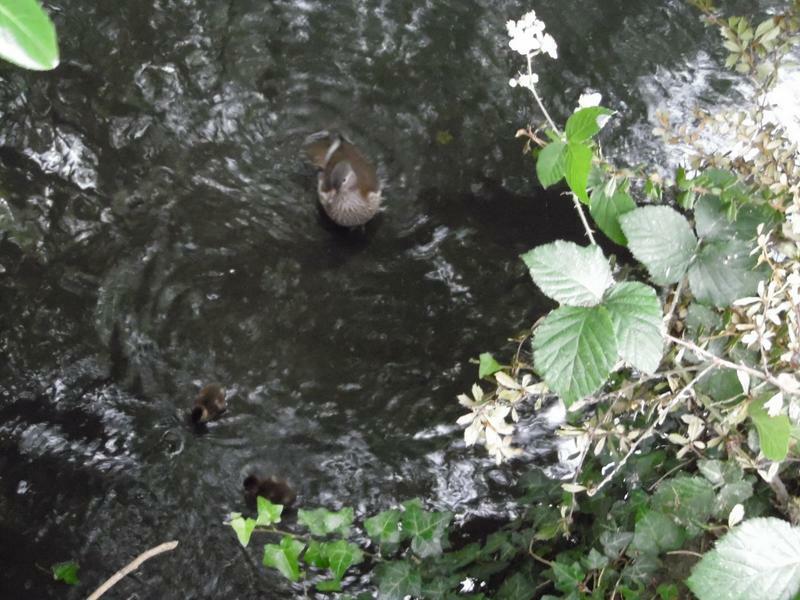 Eight ducklings with mother, probably two weeks old. 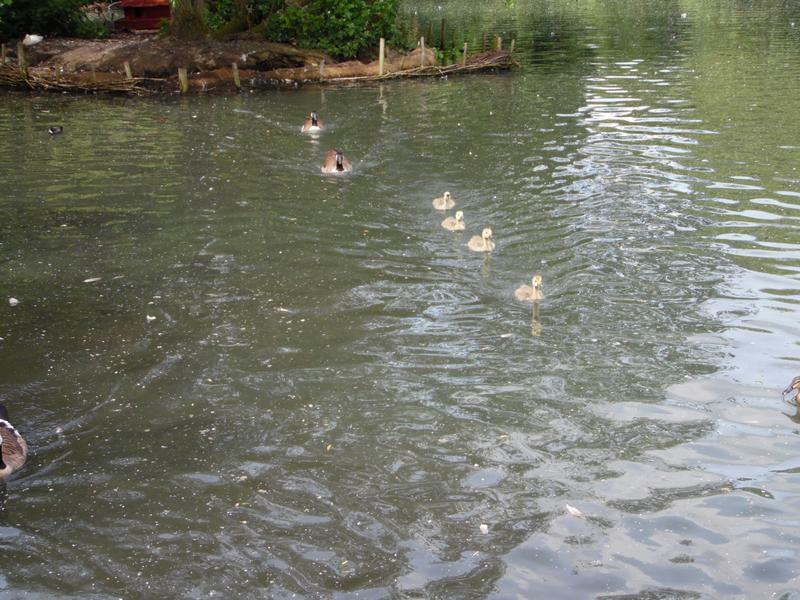 The ducklings swimming away with mother. 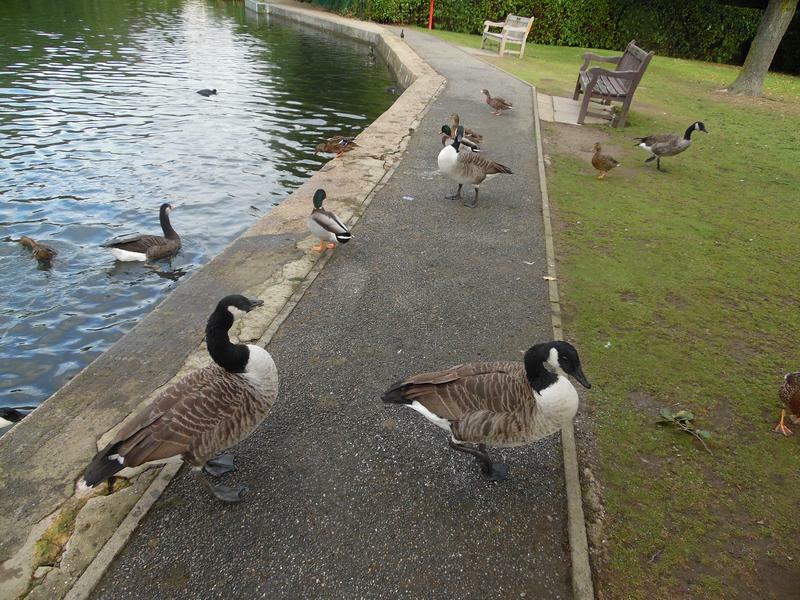 But nlow spread out again. 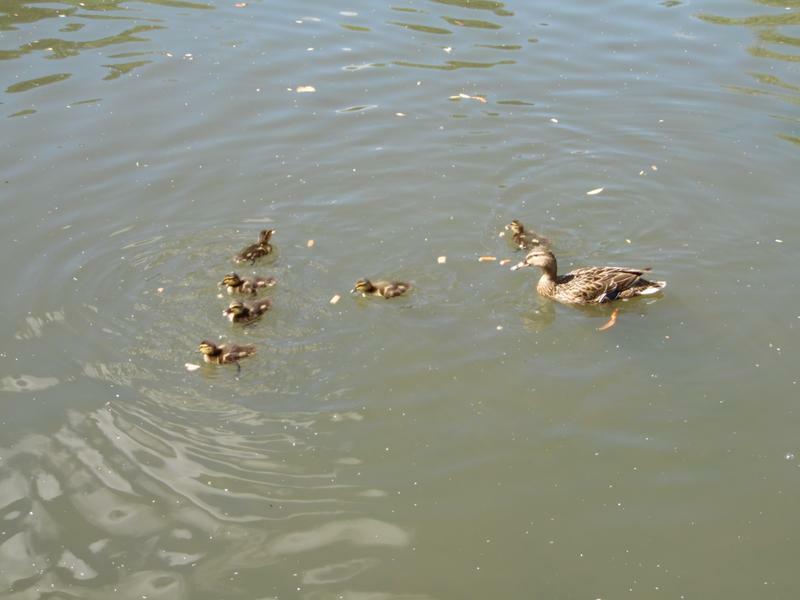 A second Mallard family, maybe one week old. 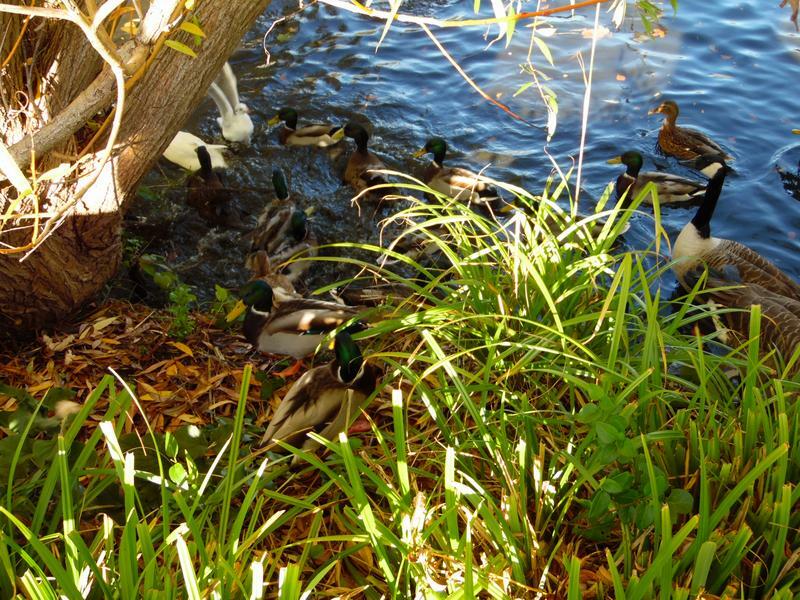 Where under the tree there is a third Mallard family, all keeping very close to mother, and not looking for food. 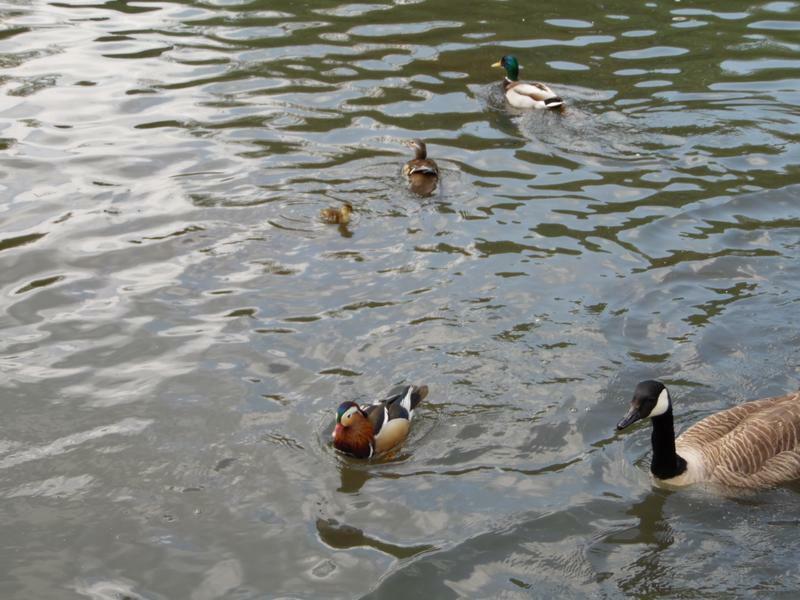 The third Mallard family again. 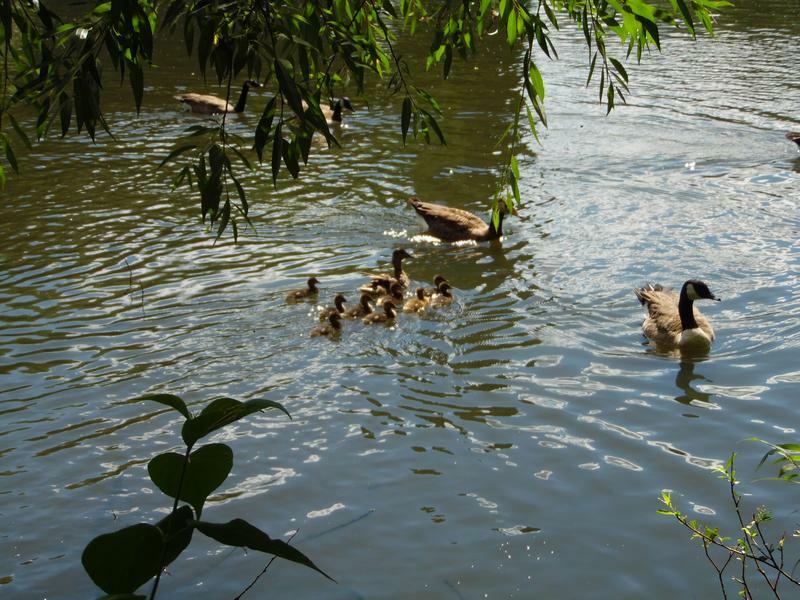 Nine ducklings, one to two weeks old. 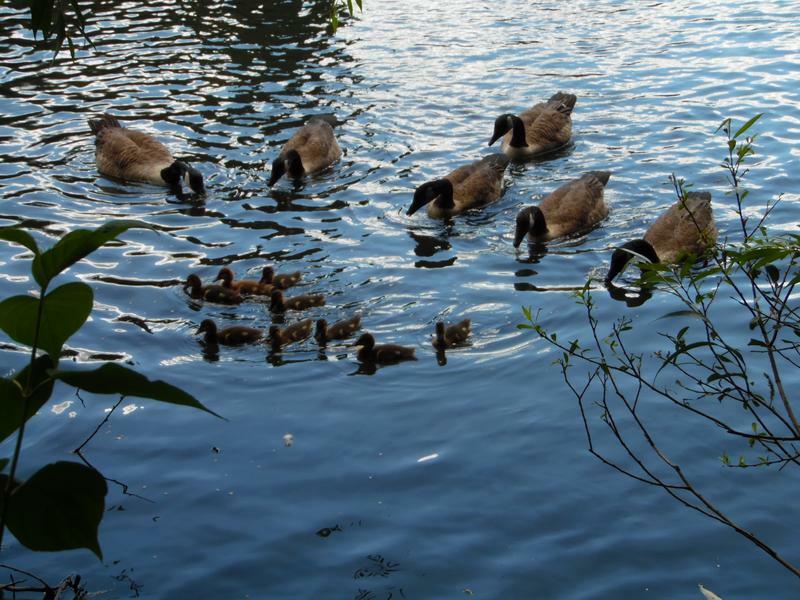 The family is now out on the main pond, but still not eating. 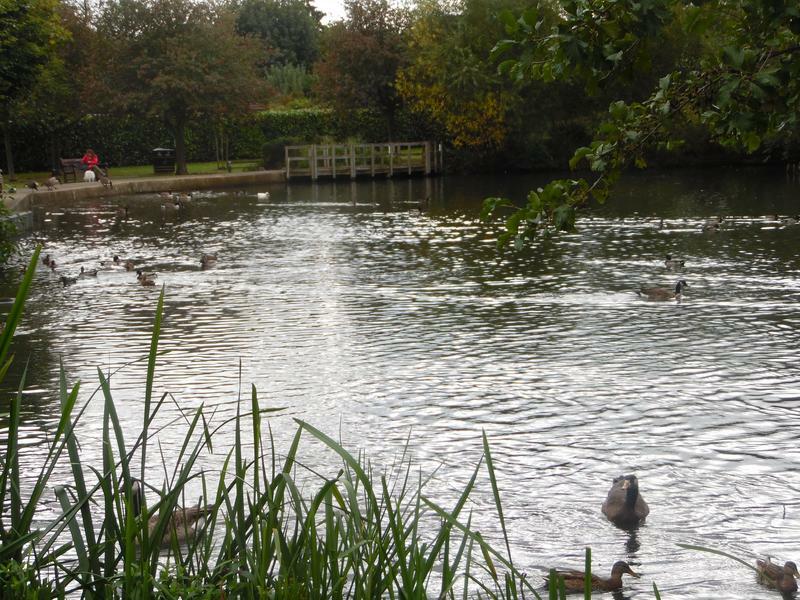 You can just just see Moorhens on the small island. 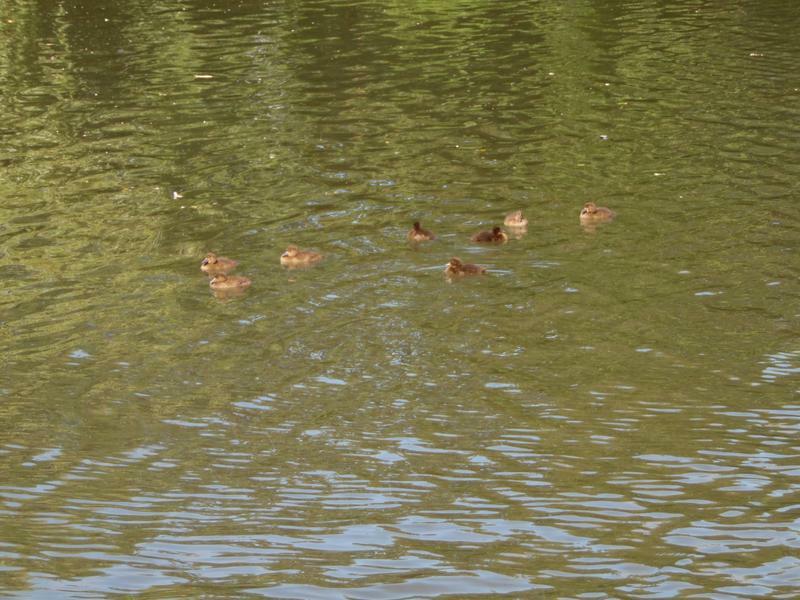 A foutth Mallard family, only a single duckling this time. 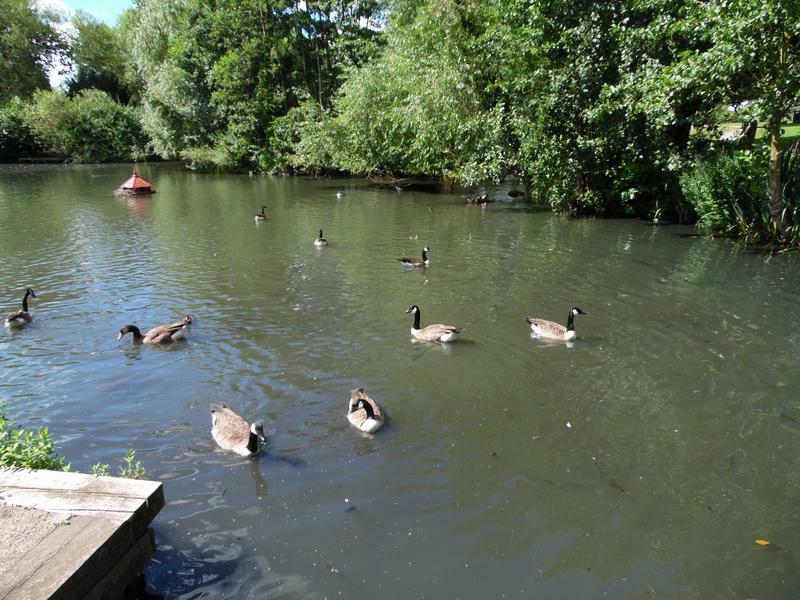 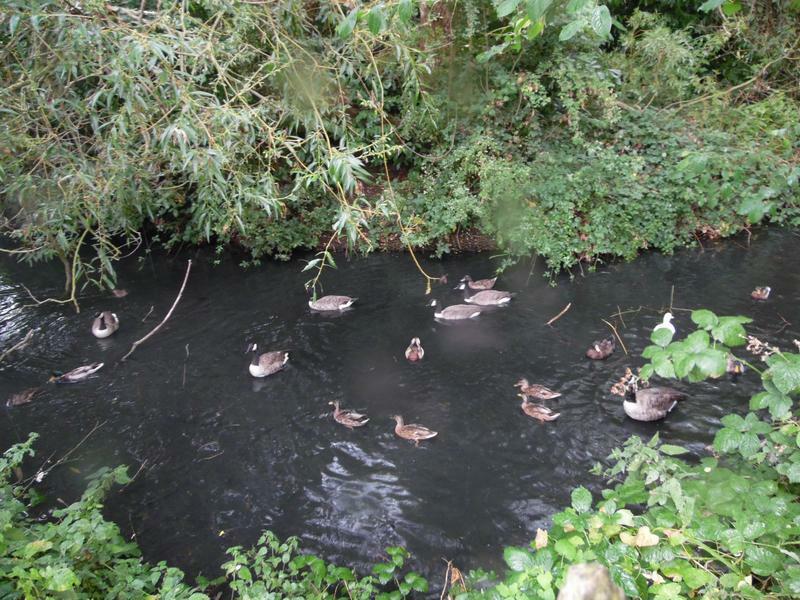 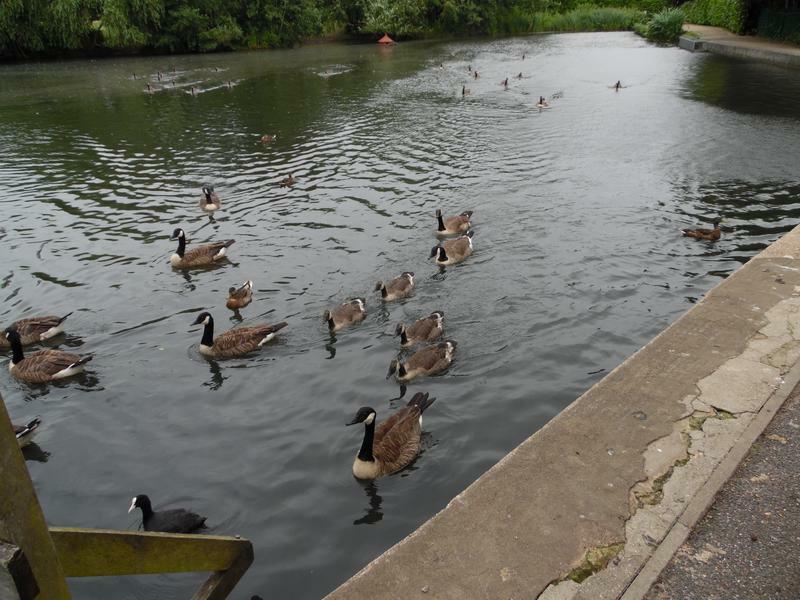 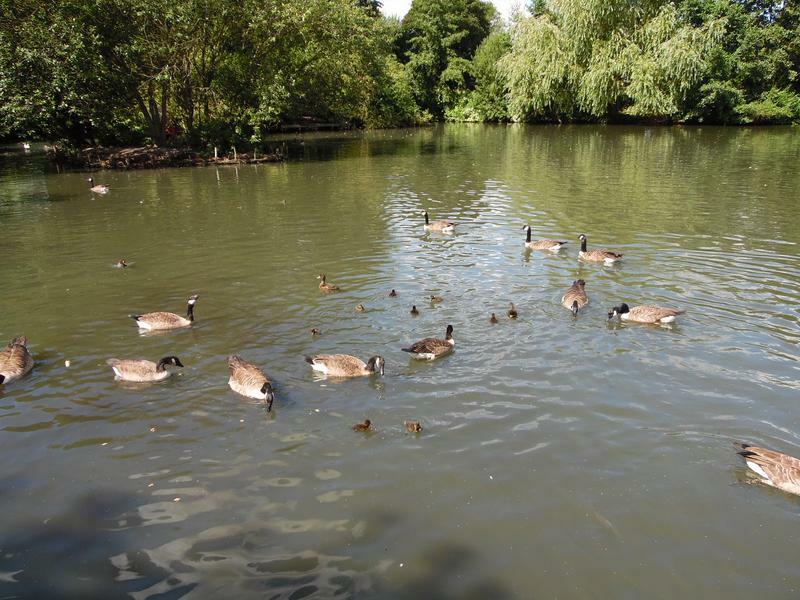 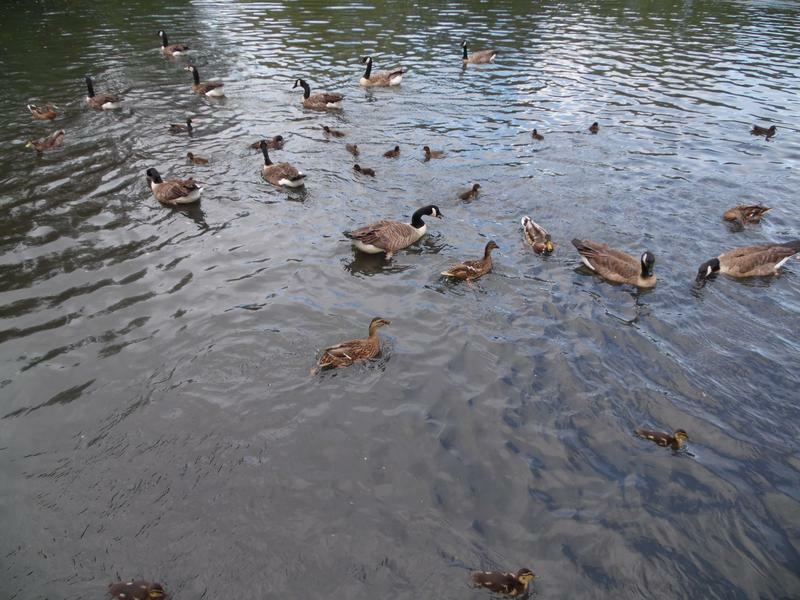 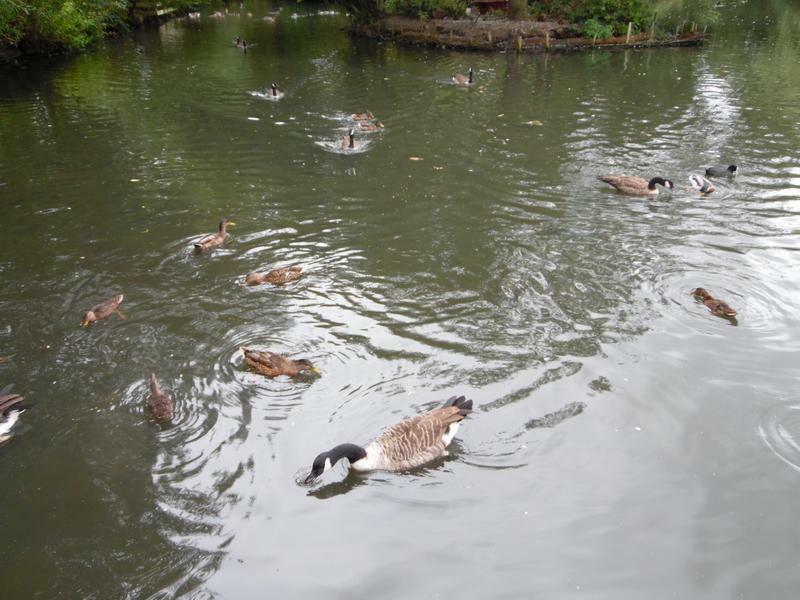 7th August 2016, a lof of geese and ducks waiting for food, and more heading our way. 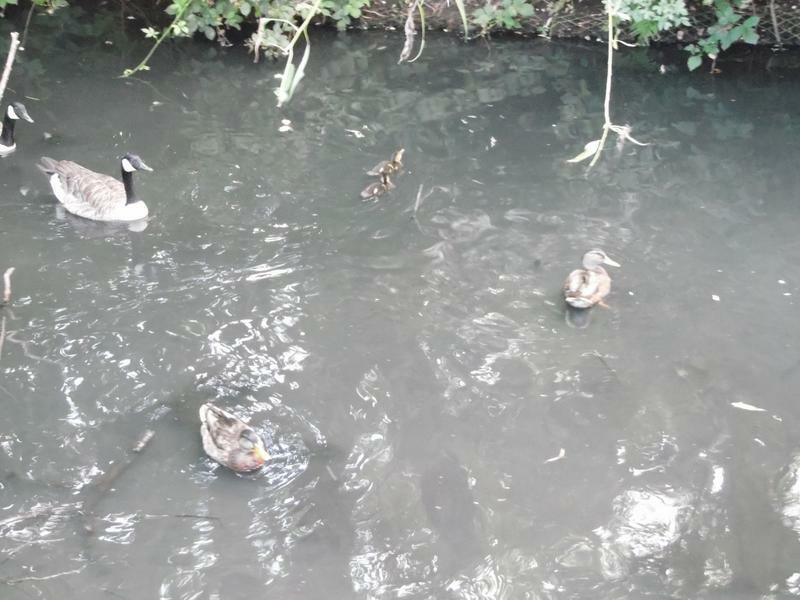 Several ducklings as well. 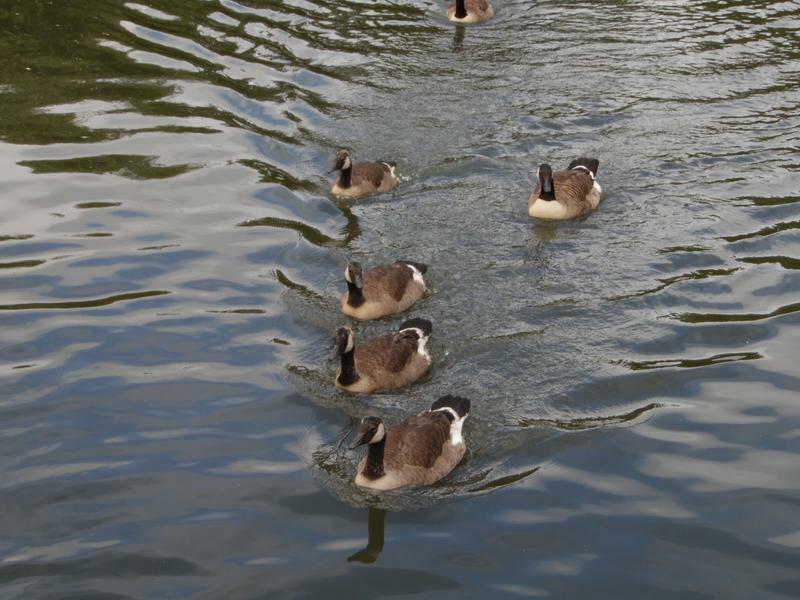 Although fully grown, the goose family still travels around in a line. 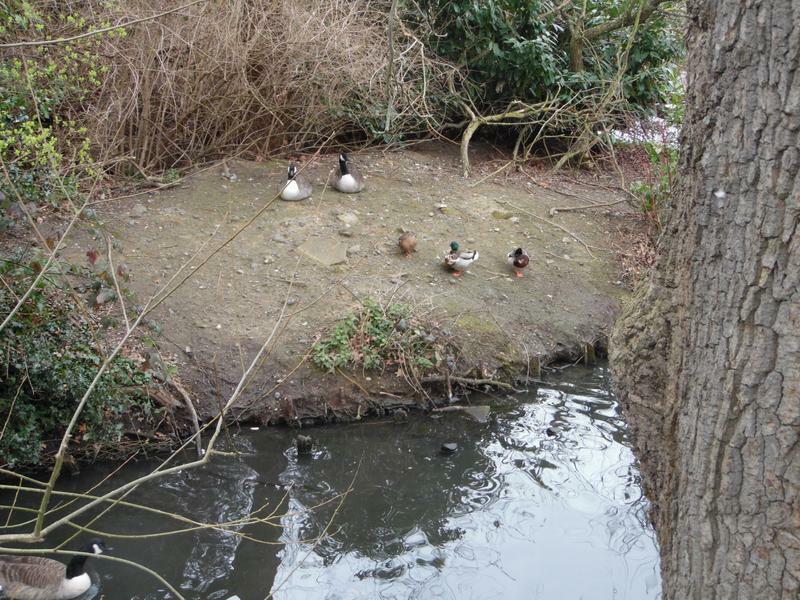 Two ducklings behind the large island. 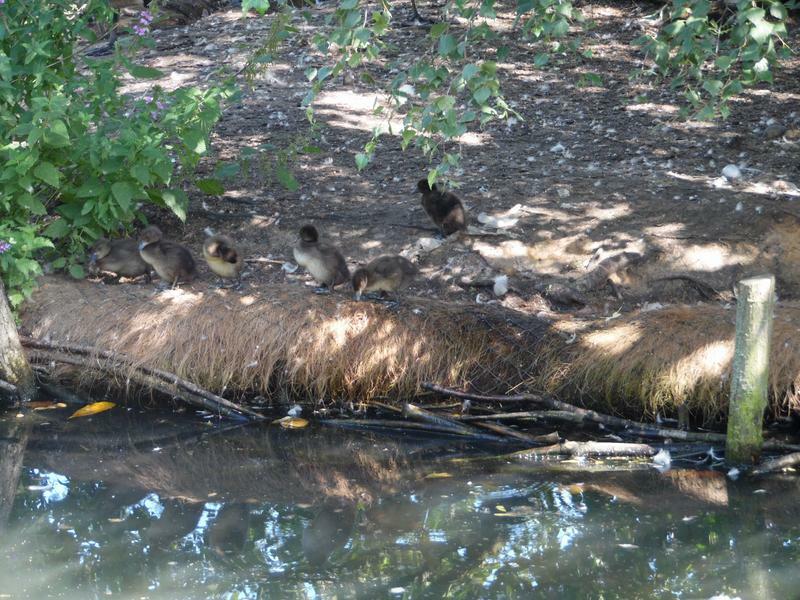 More ducklings near the Coot nest. 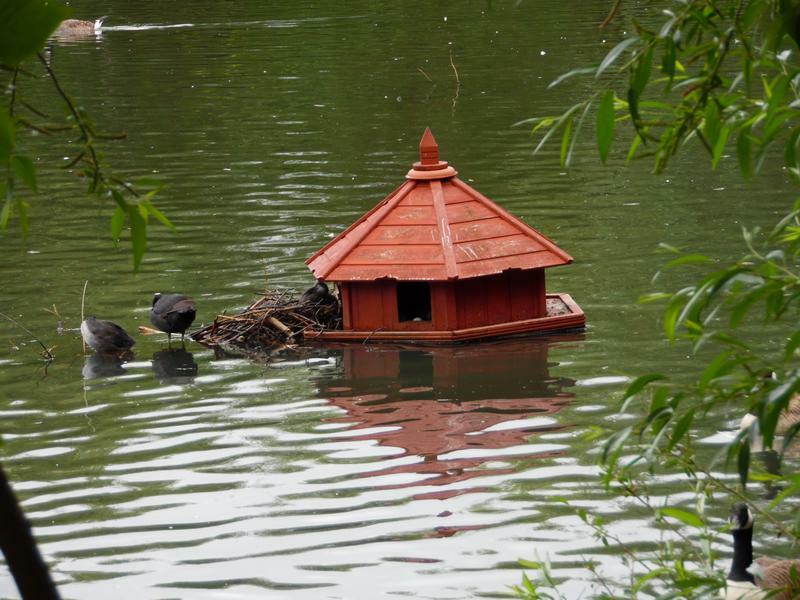 The Coot family on the small island, almost fully grown. 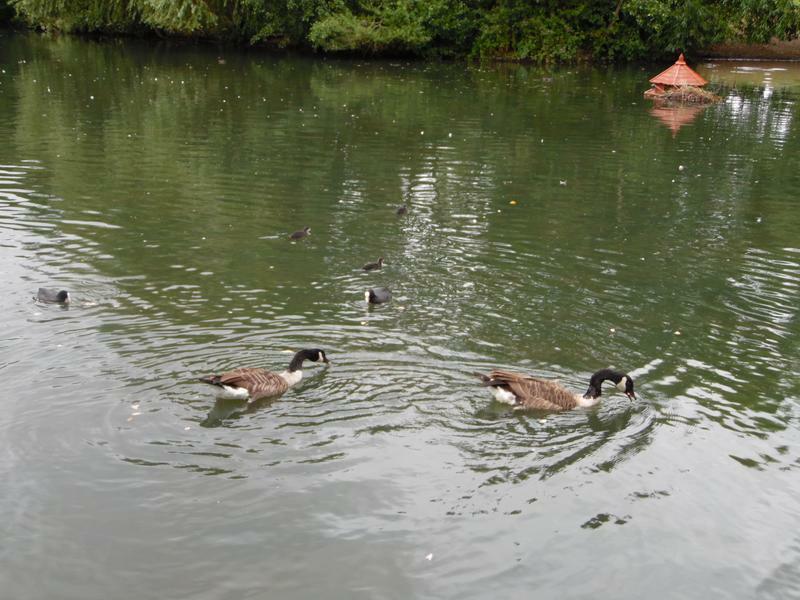 14th August 2016, the goose family, reliable as ever. 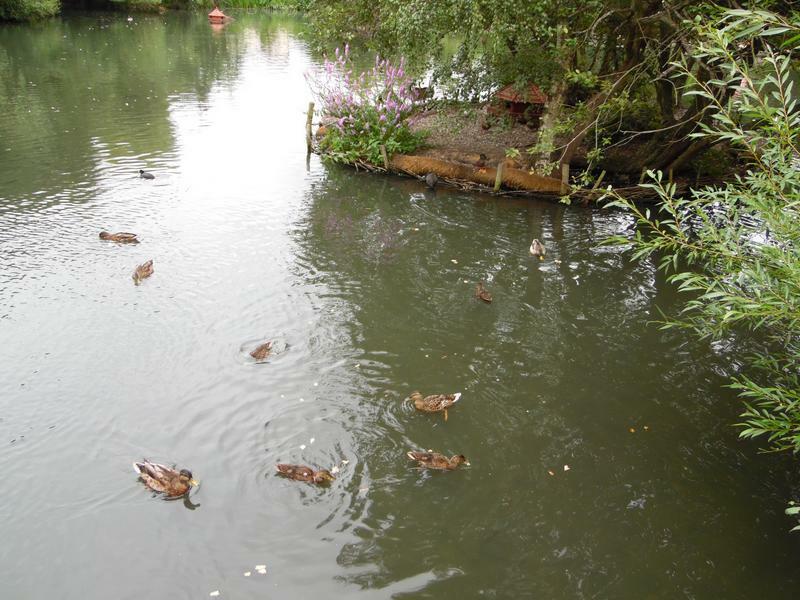 The mallard ducklings are now three or four weeks old. 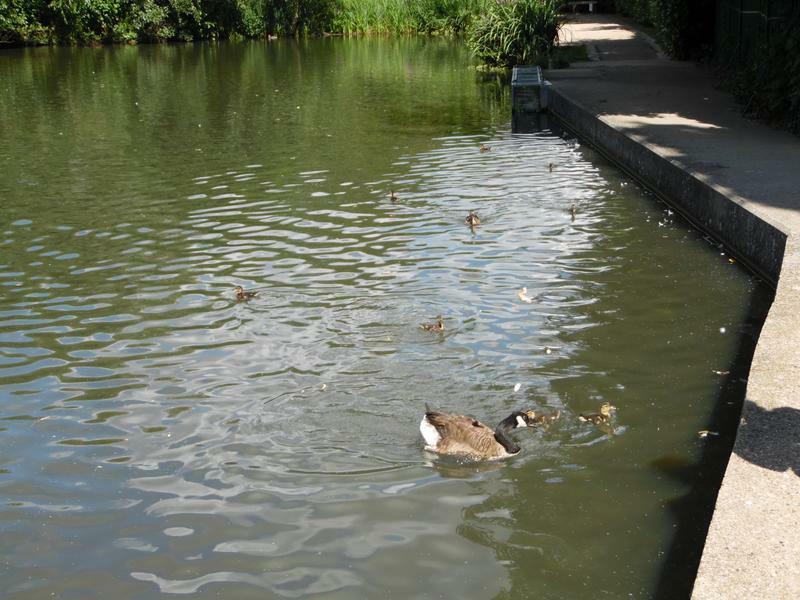 28th August 2016, not easy to see ducklings any longer, they are almost fully grown by now. 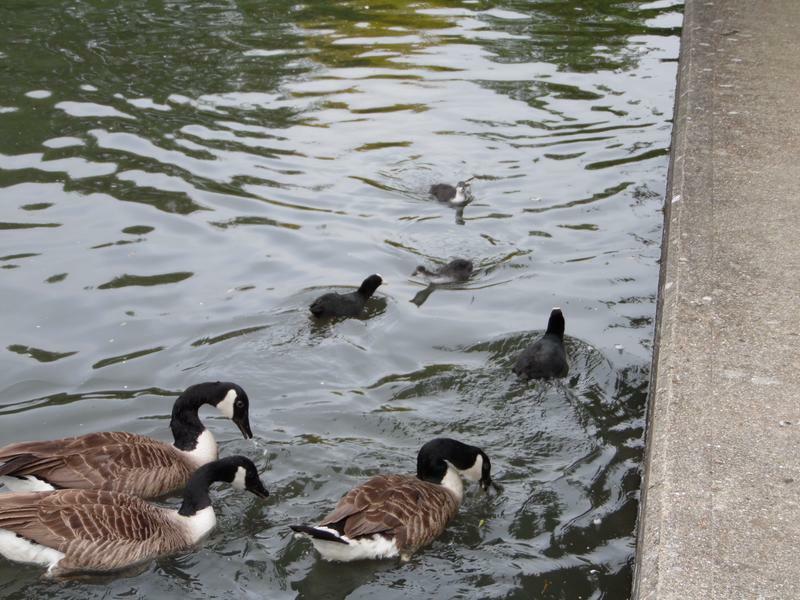 But the Coot family is easy identified. 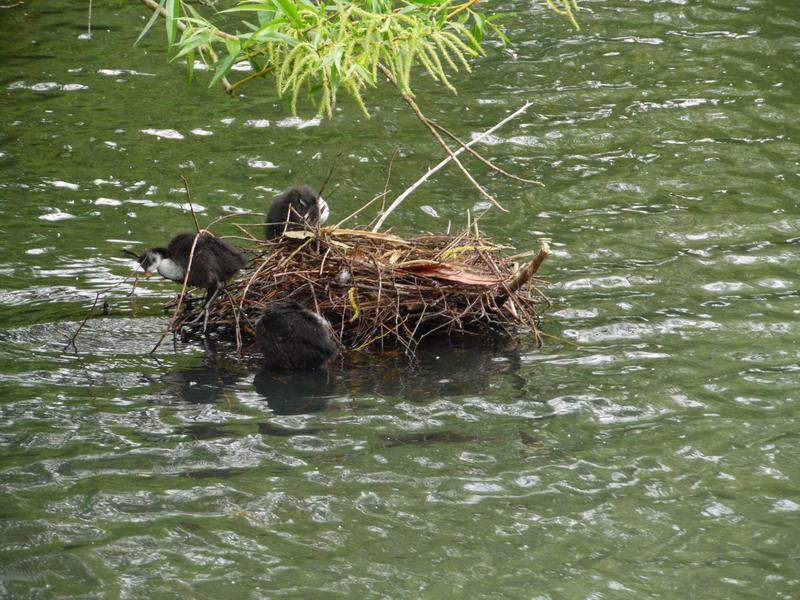 Coot family heading back to their nest. 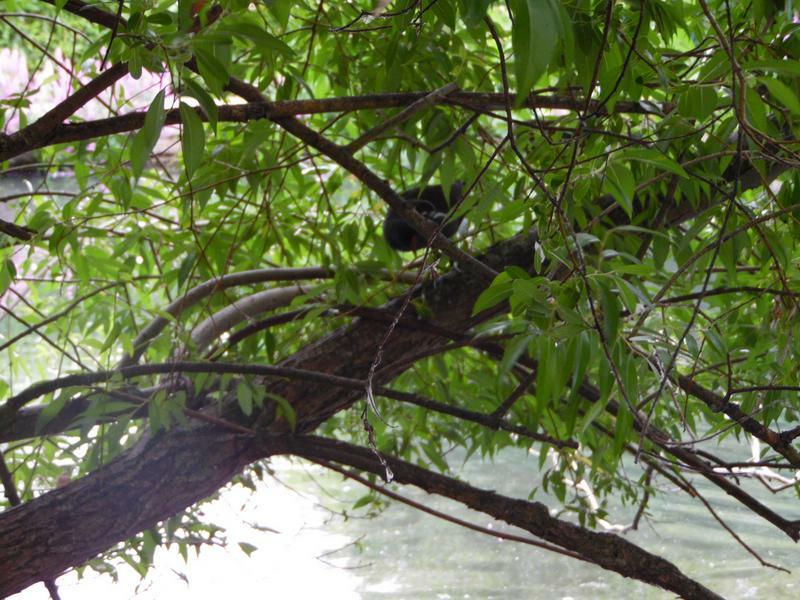 A Coot climbing a tree branch, no idea why, they don't nest in trees. 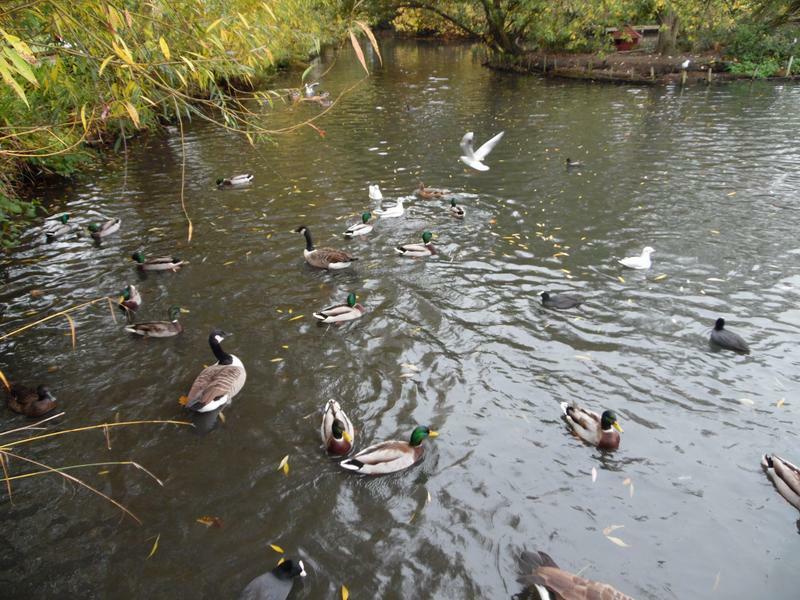 Fewer birds near the small island. 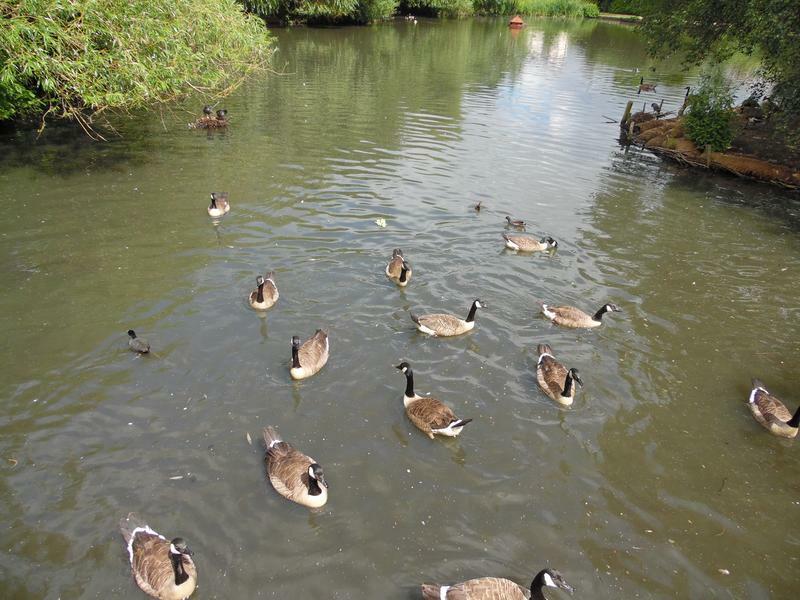 4th September 2016, various geese and ducks swmming our way for food. 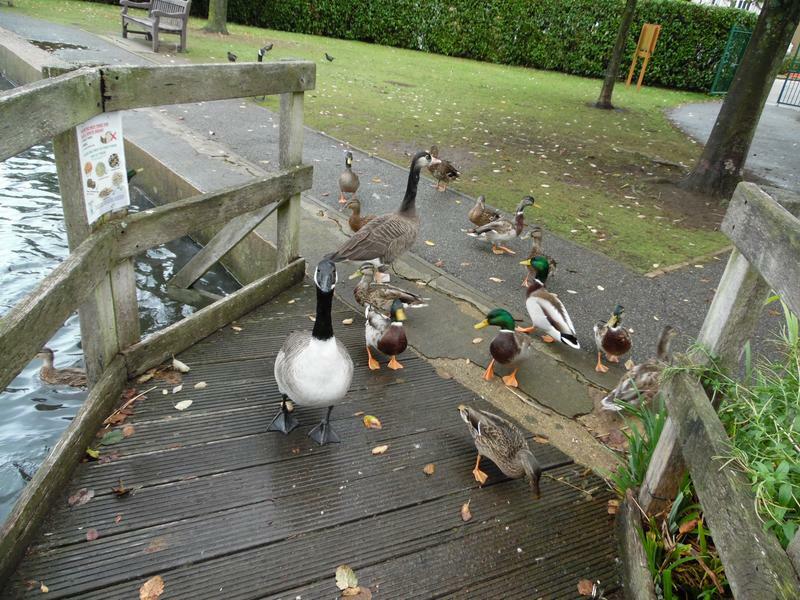 It's raining, so few people feeding the ducks, but we don't hang around either. 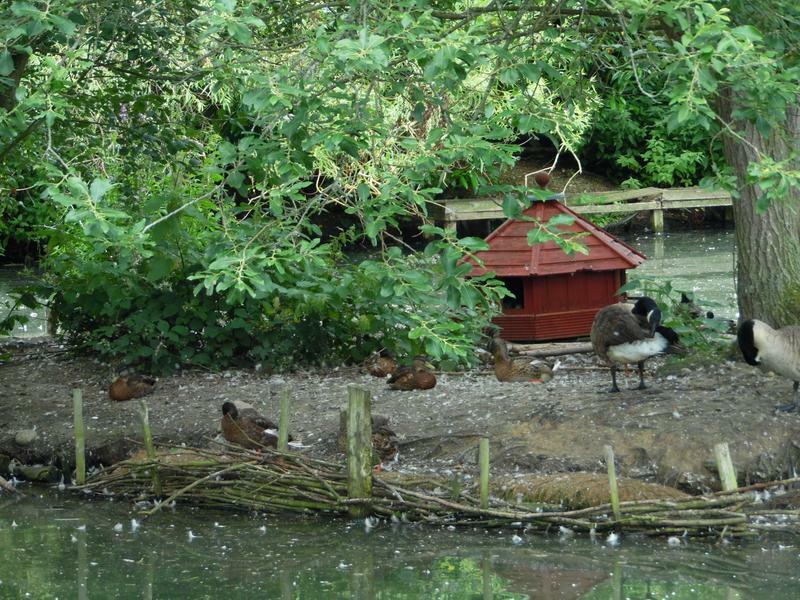 Lots of ducks and gese hiding behind the large island. 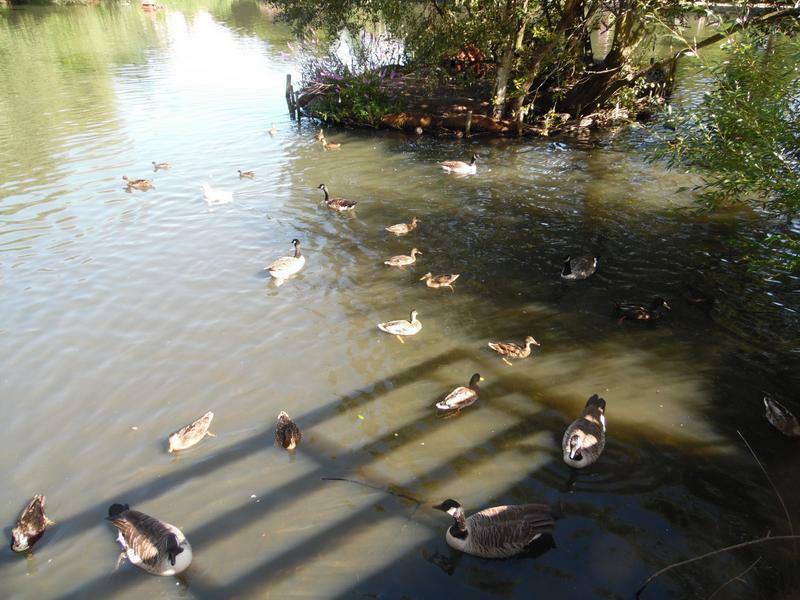 11th September 2016, hot weather is back, the ducks and geese are sun bathing out of the water. 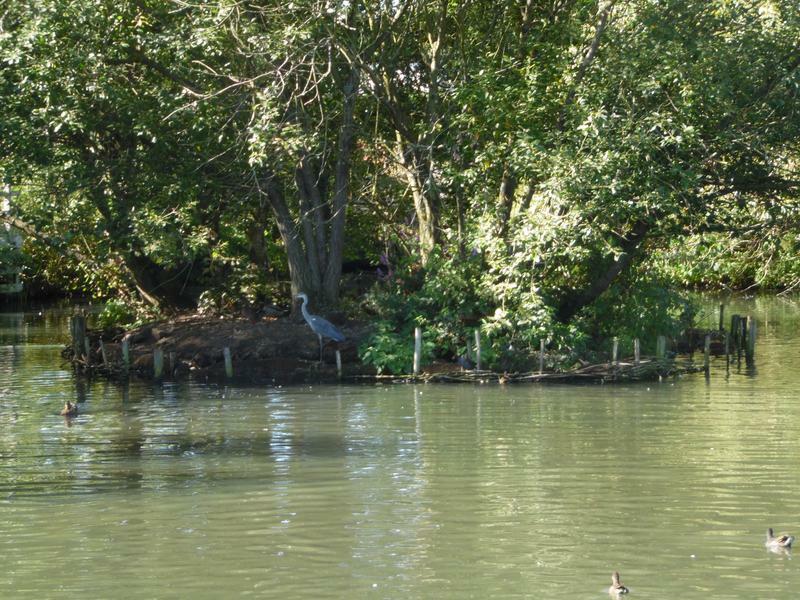 A heron on the small island. 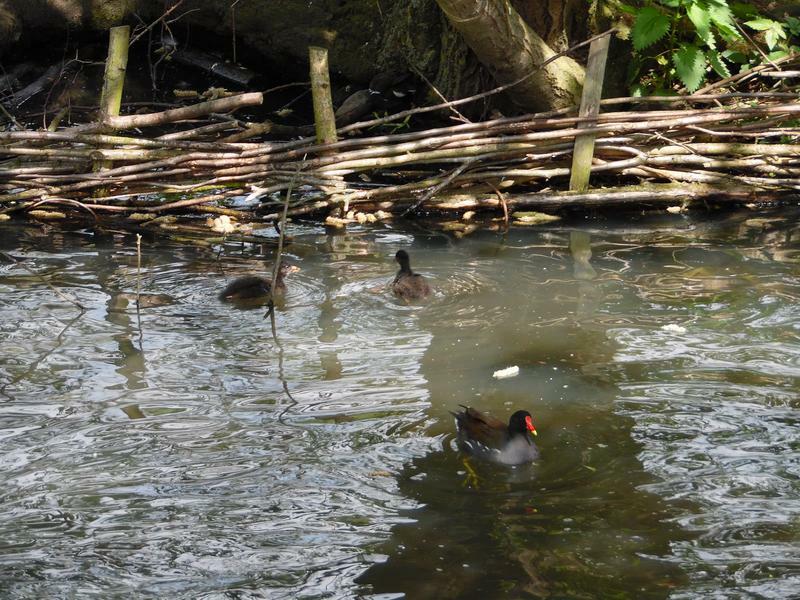 A new Coot family in the water, Moorhen on the path. 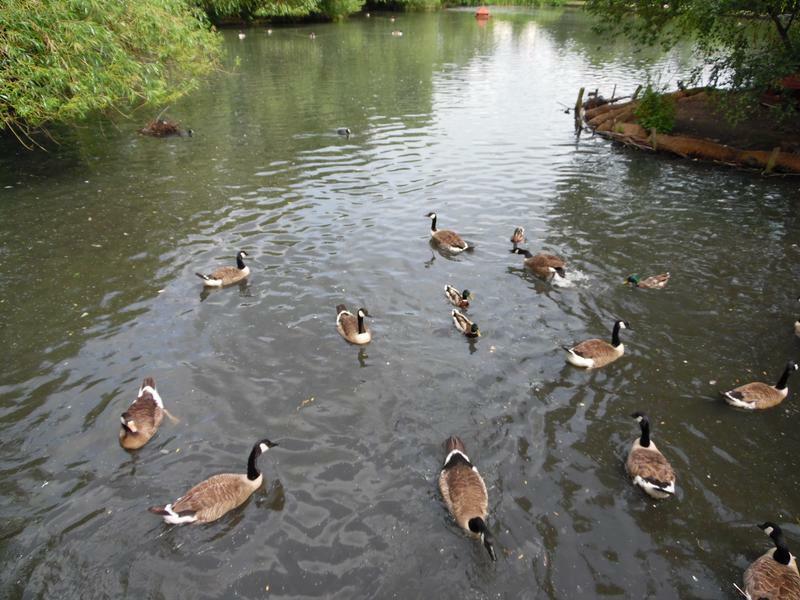 Full range of ducks and geese. 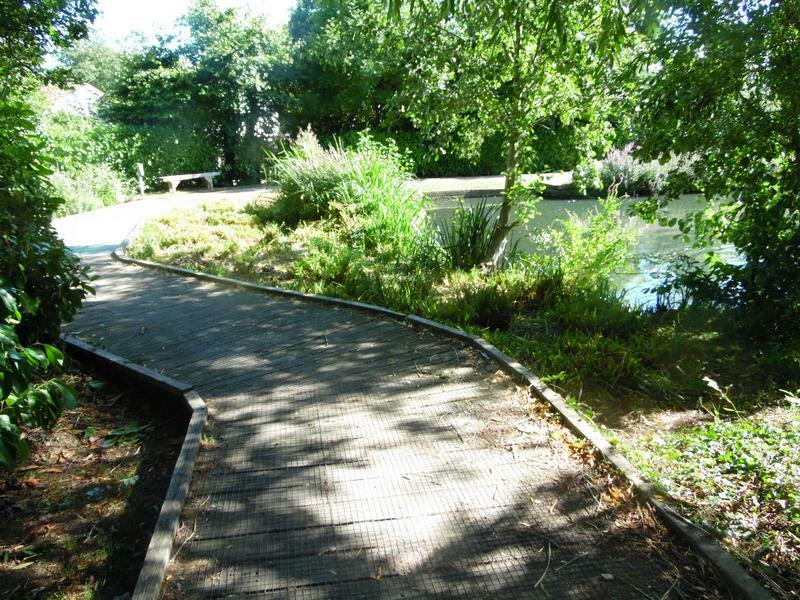 The restored path at the end of the pond with vegetation cut back. 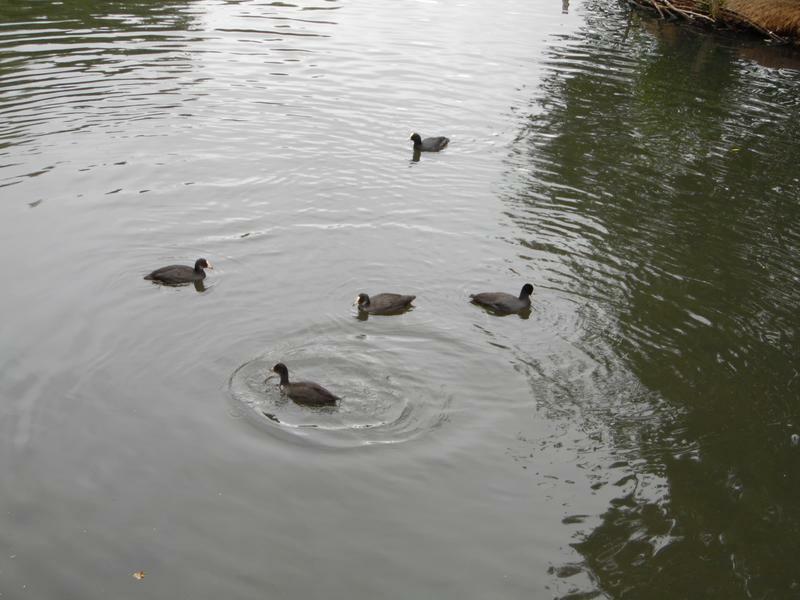 18th September 2016, the Coot family again. 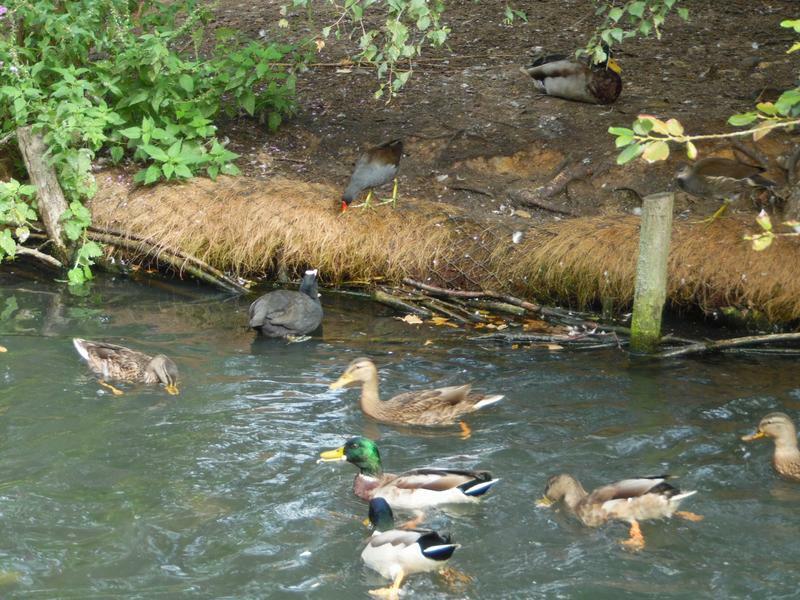 Moorhens taking their bread in to the water. 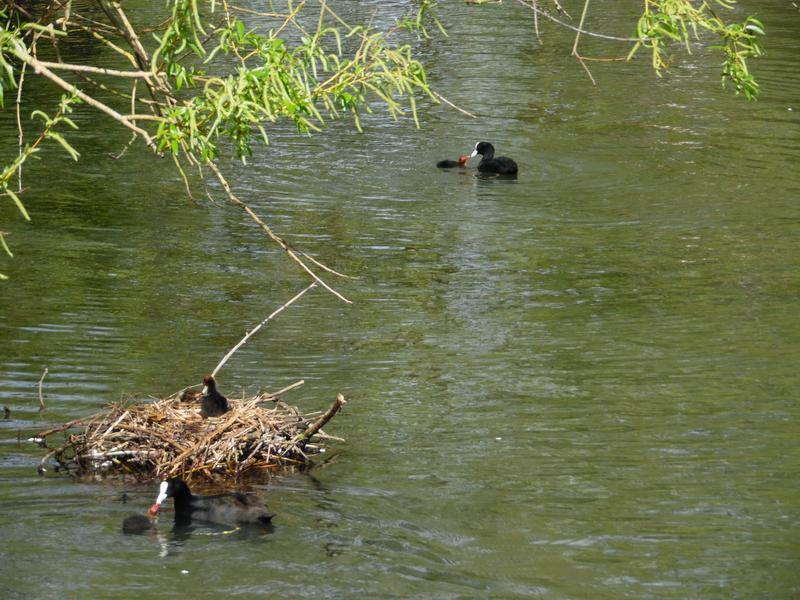 The Coot family back at their nest. 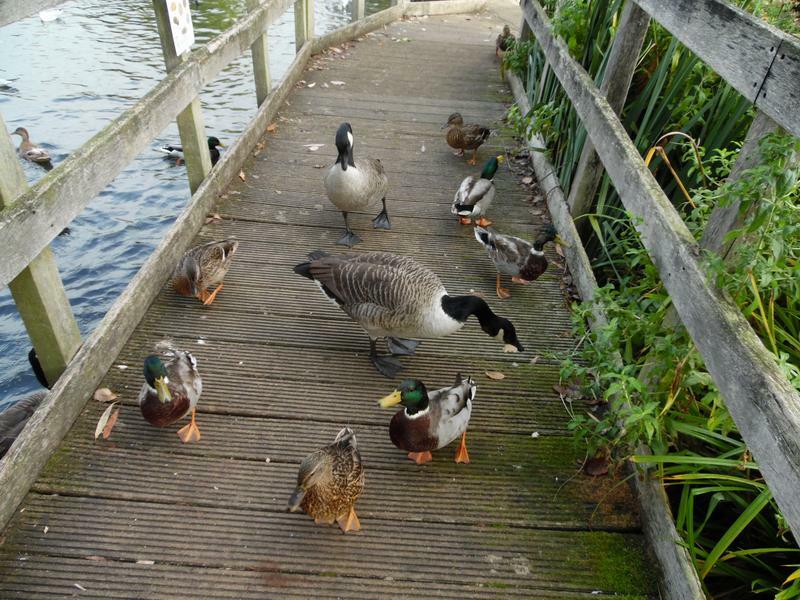 25th September 2016, the usual suspects waiting for food. 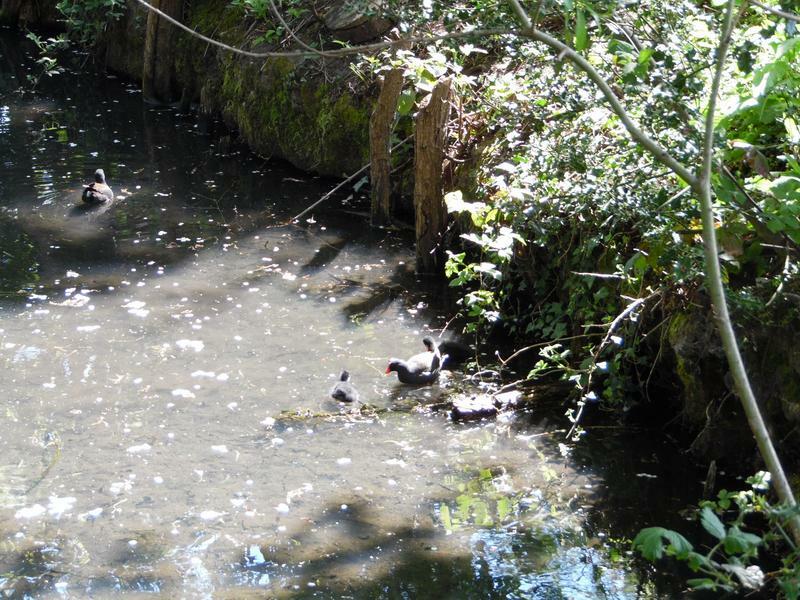 Coots and Moorhen near the small island. 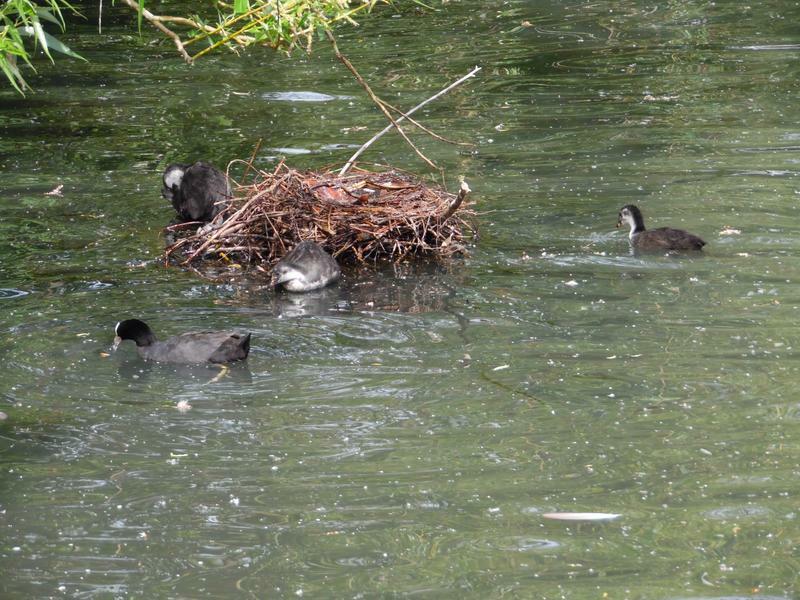 The Coot family at the end of the pond, seem to be practising nest building, too late for more breeding. 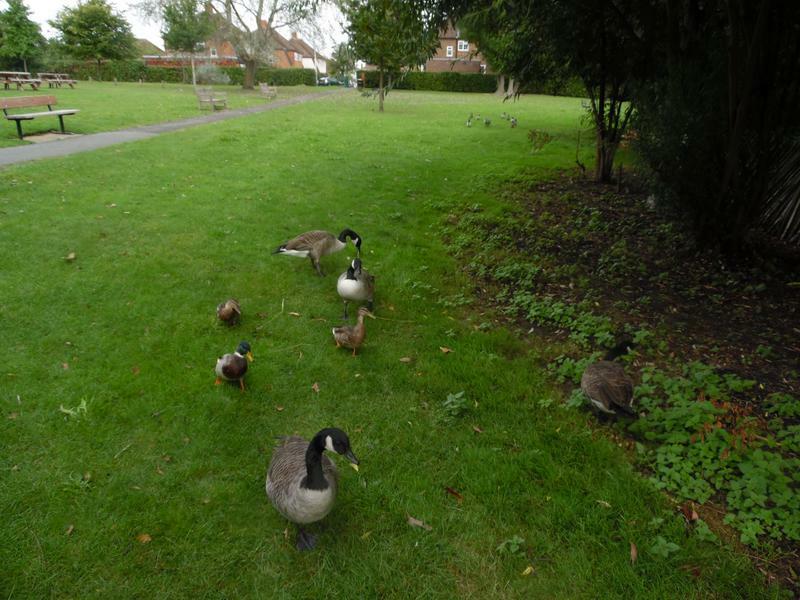 2nd October 2016, another one of those days when everyone is up on the grass. 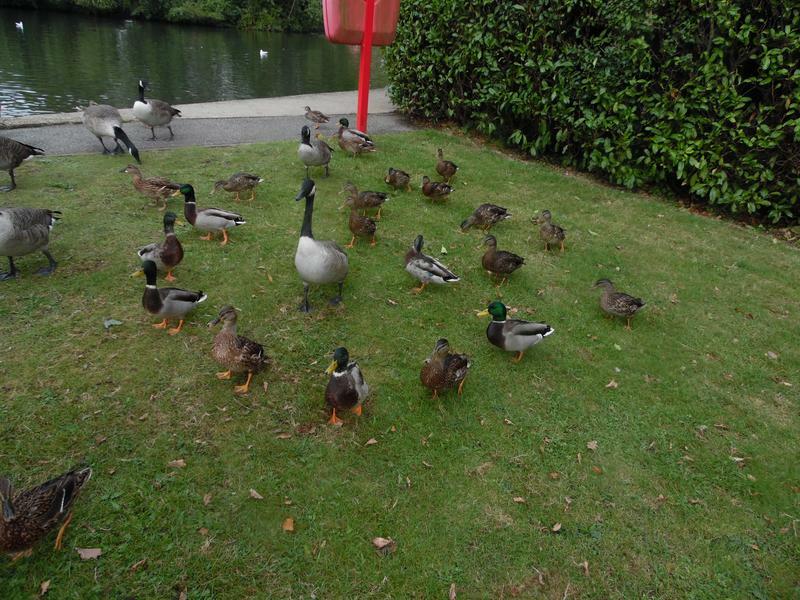 All waiting for more food. 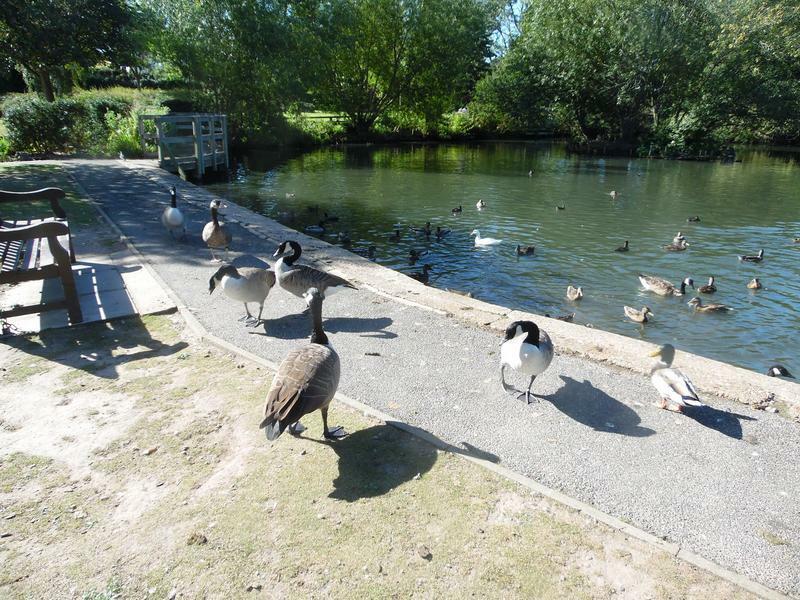 As I walk around the pond, a large group of geese and ducks exit from the beach and start following me, looking for more food. 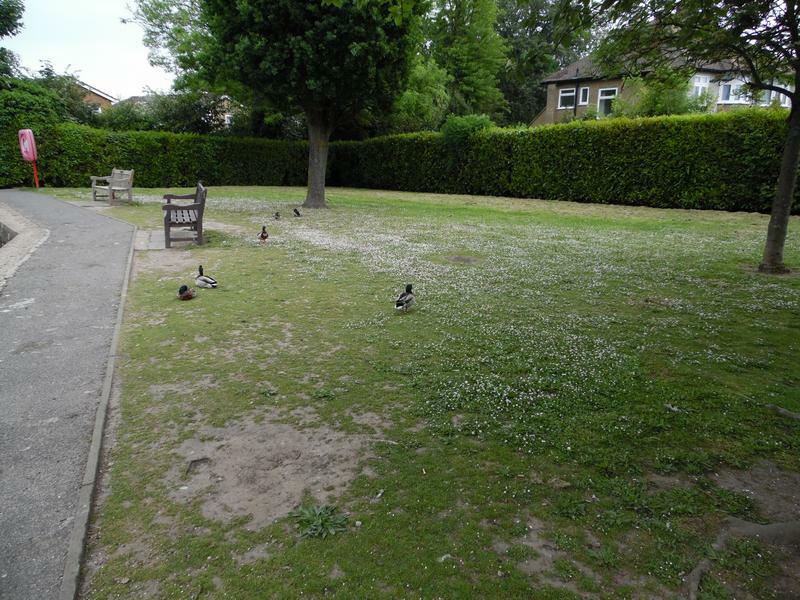 Further around, the numbers are dropping. 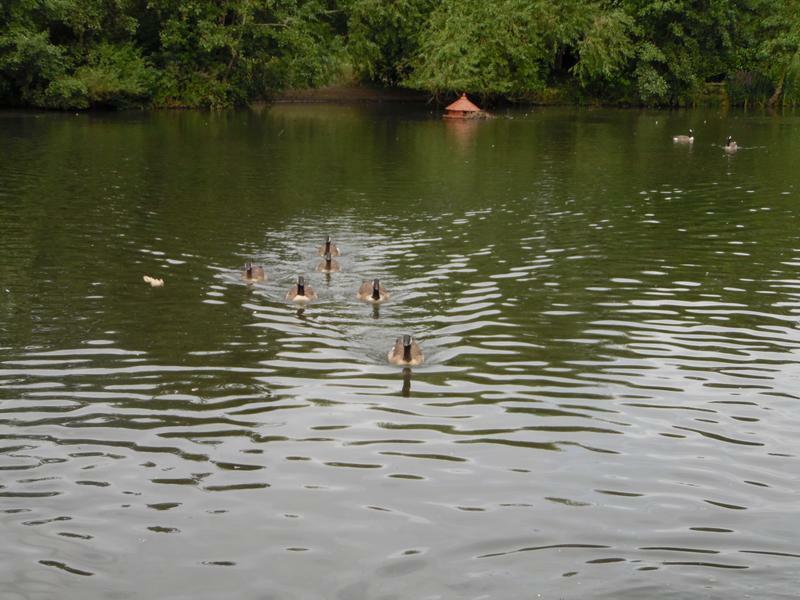 Some have turned back, some head into the water here. 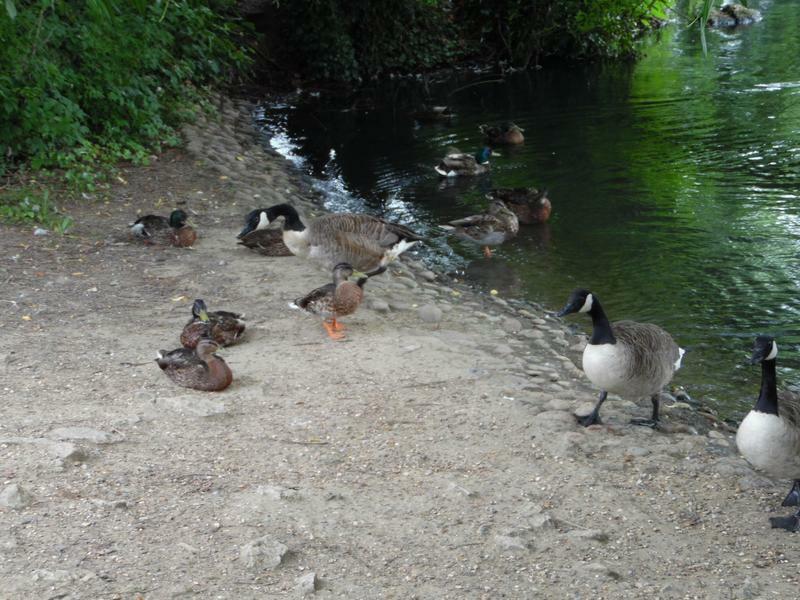 But two ducks and several geese are still following the food. 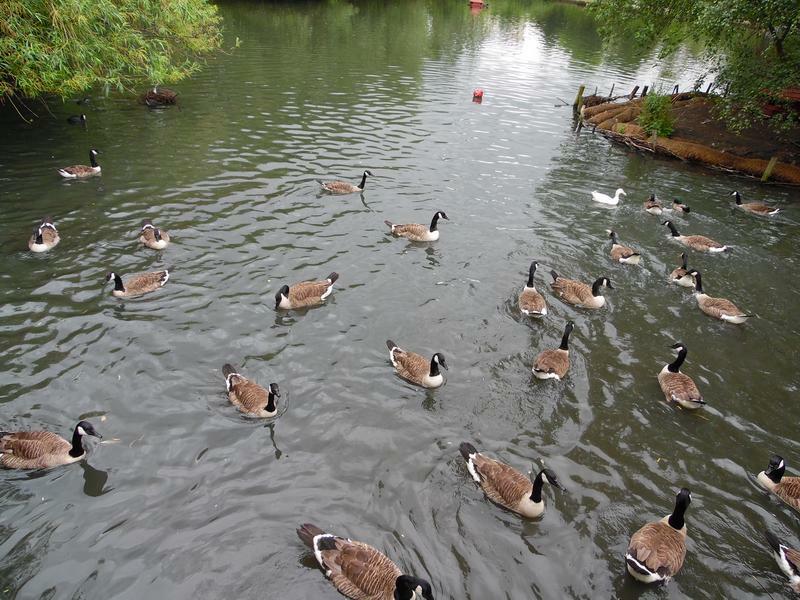 Just the geese left now. 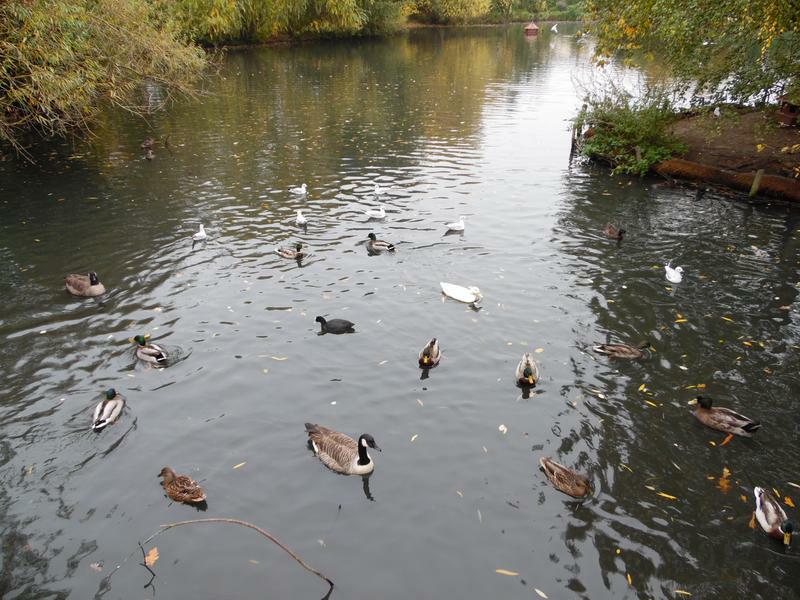 Few birds in the water, most are on the land. 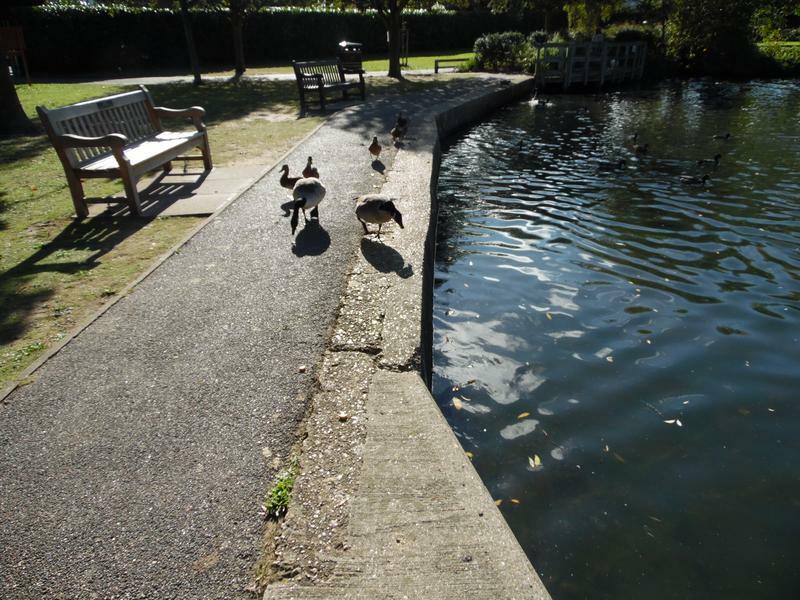 9th October 2016, pond seems quiet today. 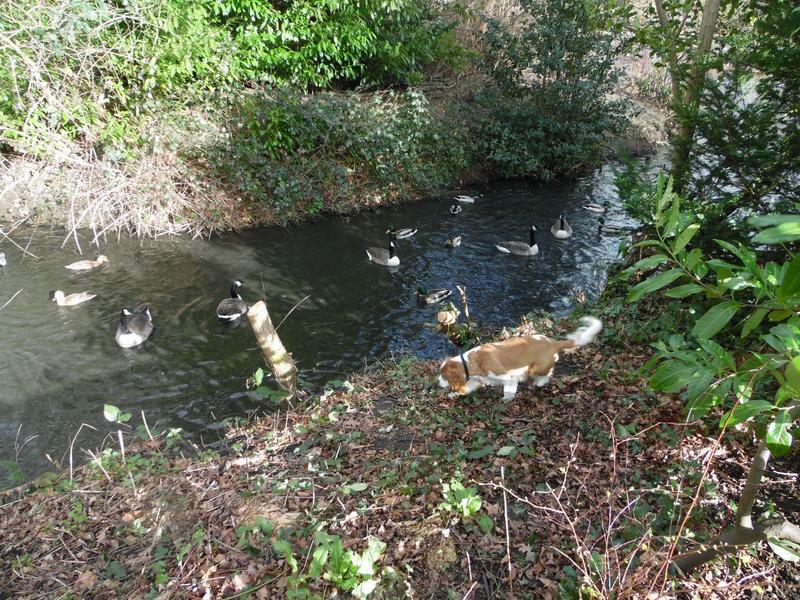 But a few ducks and geese are following me again. 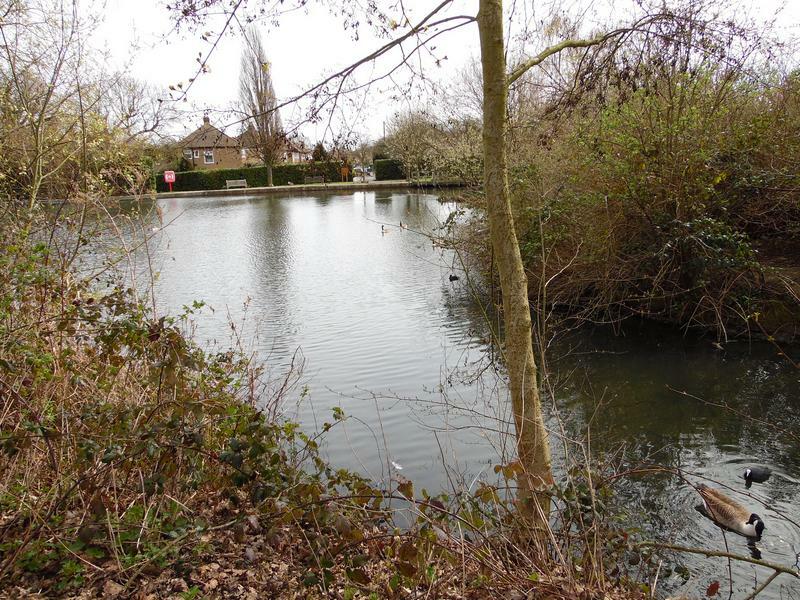 Right down to the end of the pond. 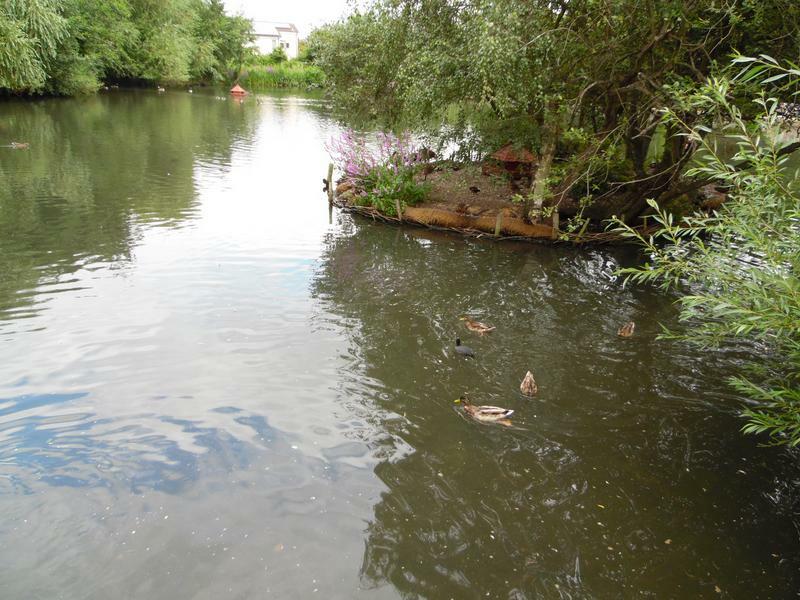 The water behind the large island. 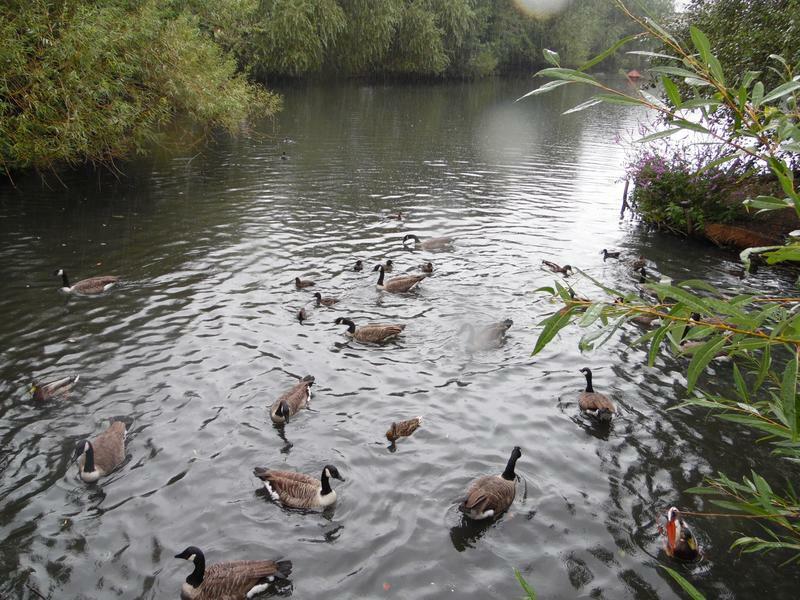 16th October 2016, hungry ducks and geese. 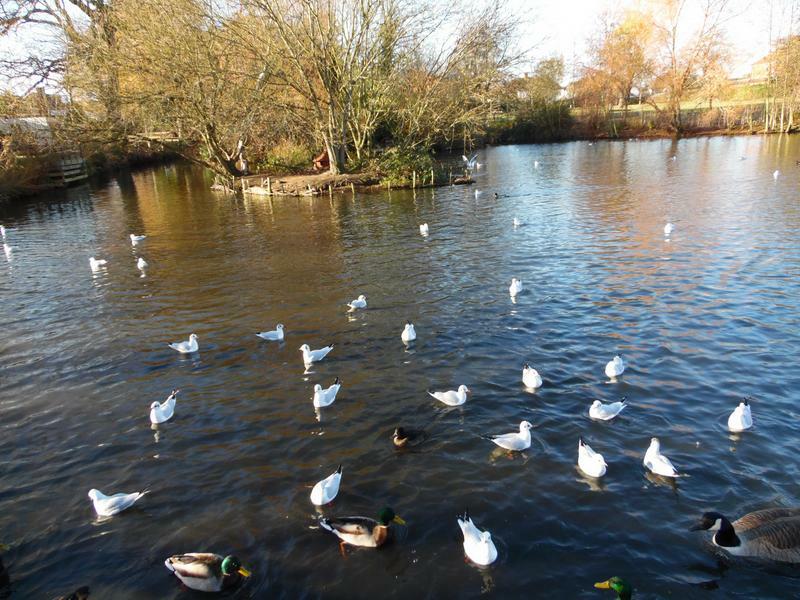 The sea gulls are back for the winter, so the pond is very noisy. 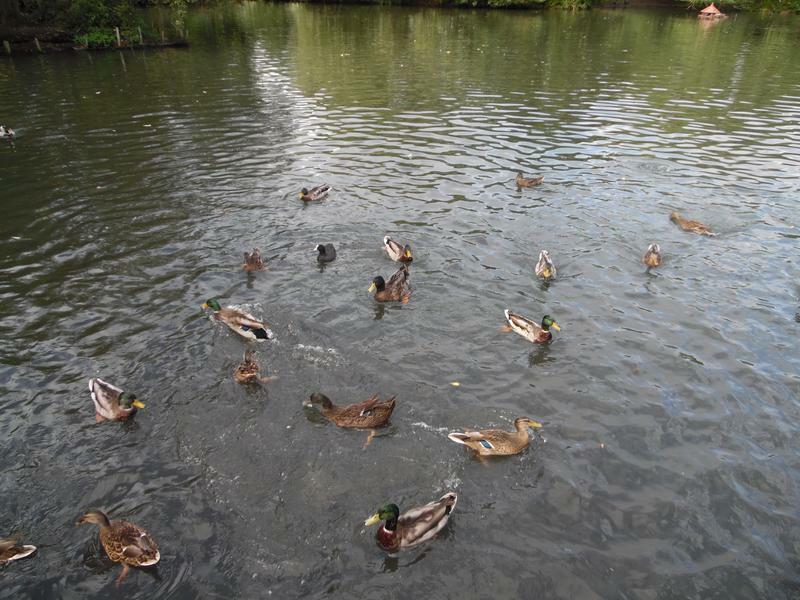 It's no longer possible to throw food any distance since the sea gulls swoop and catch it in the air. 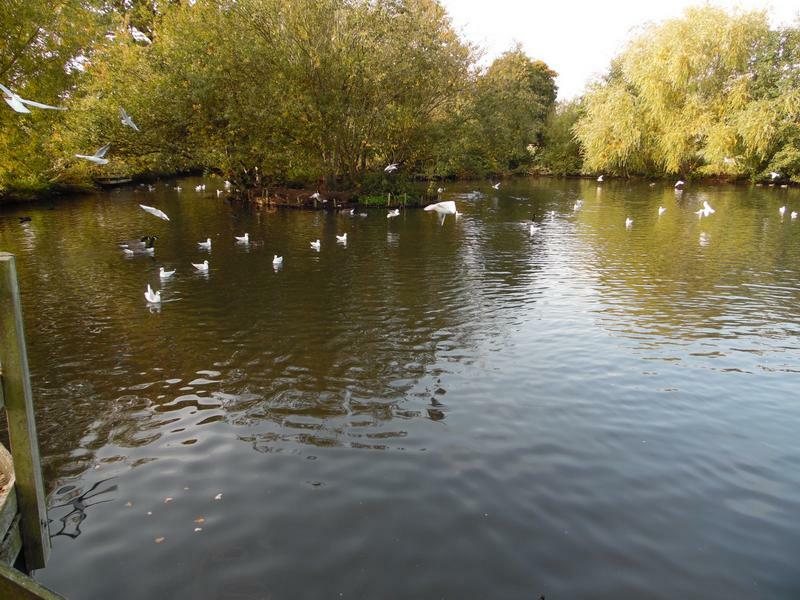 Slightly quieter behind the large island, the sea gulls prefer open water. 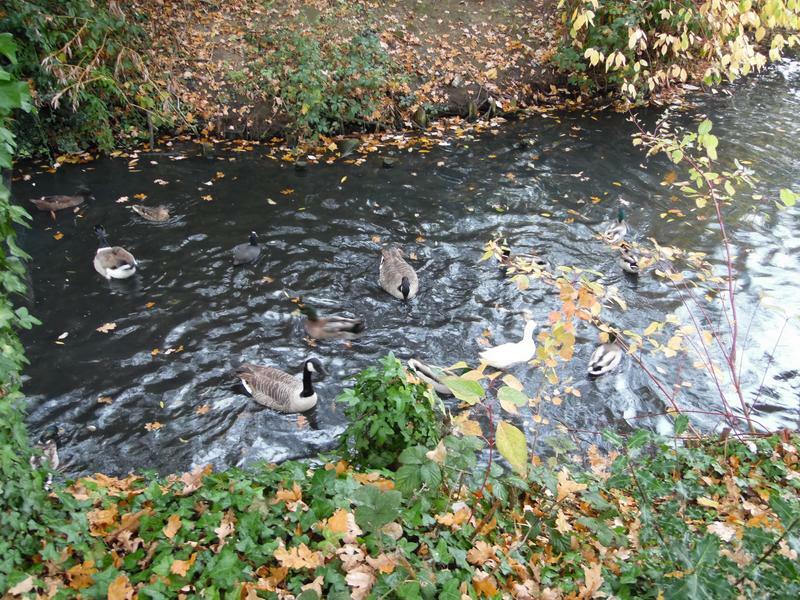 23rd October 2016, ducks and geese are on the grass again. 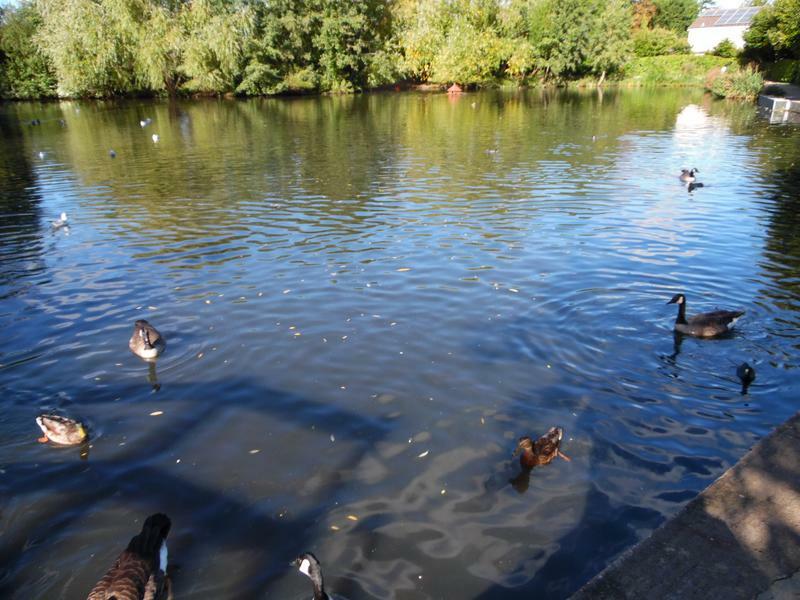 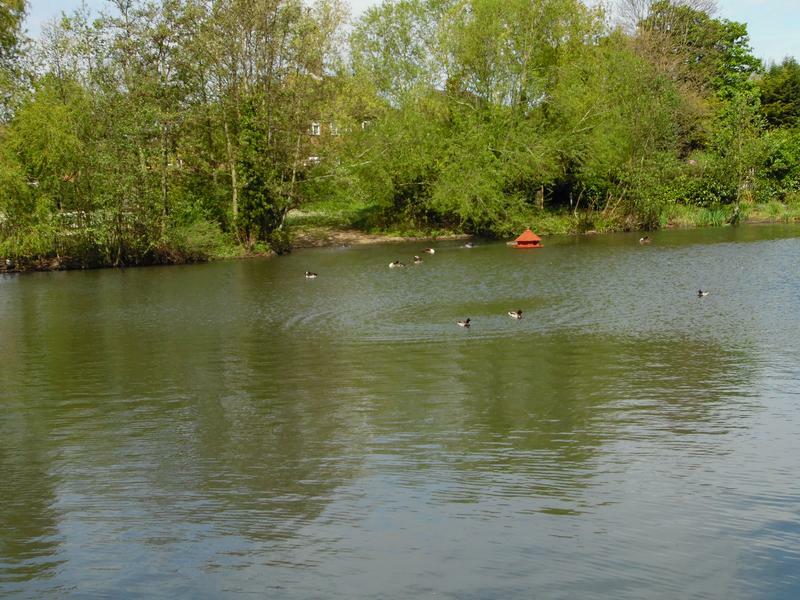 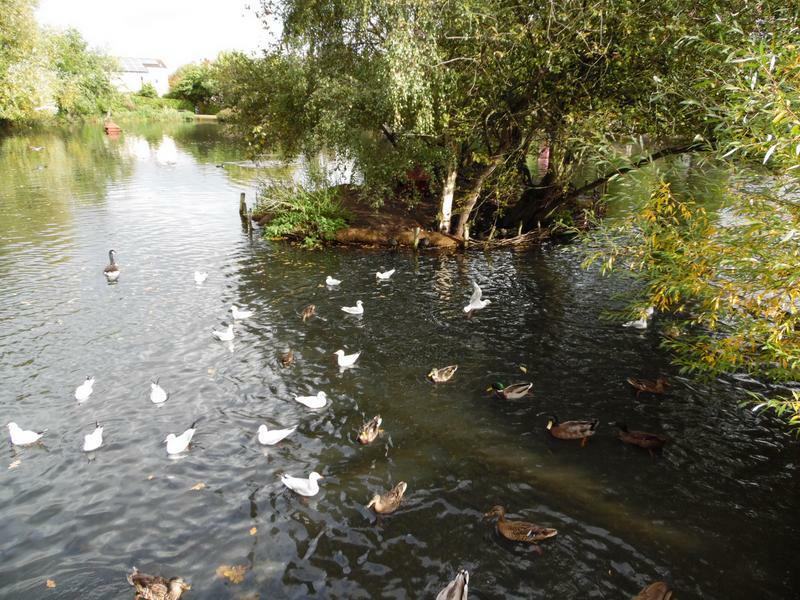 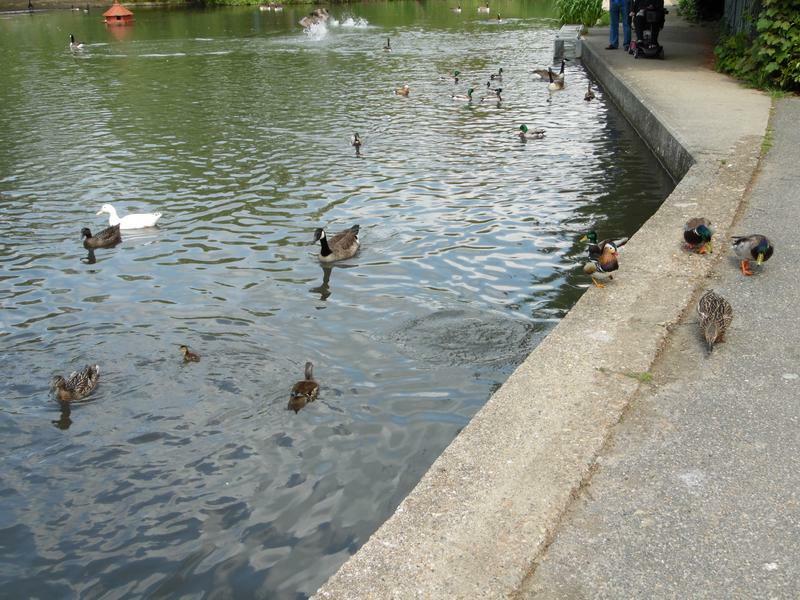 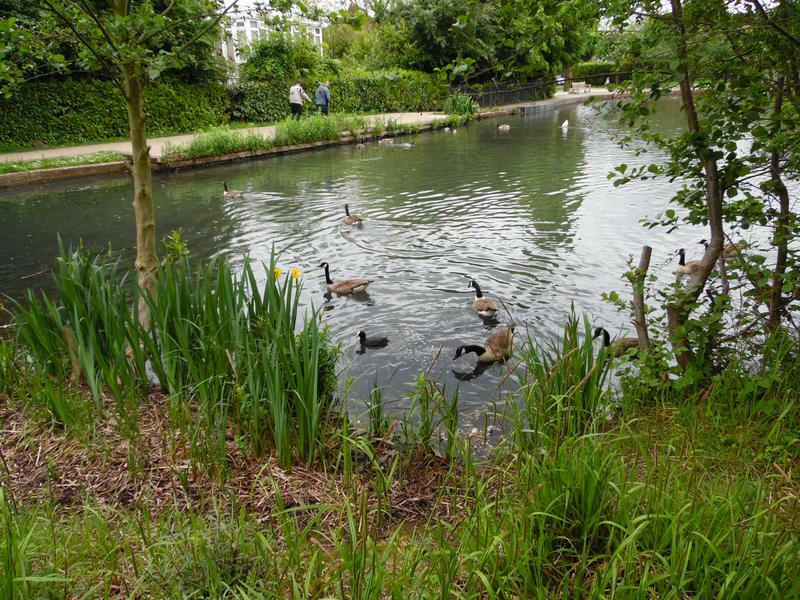 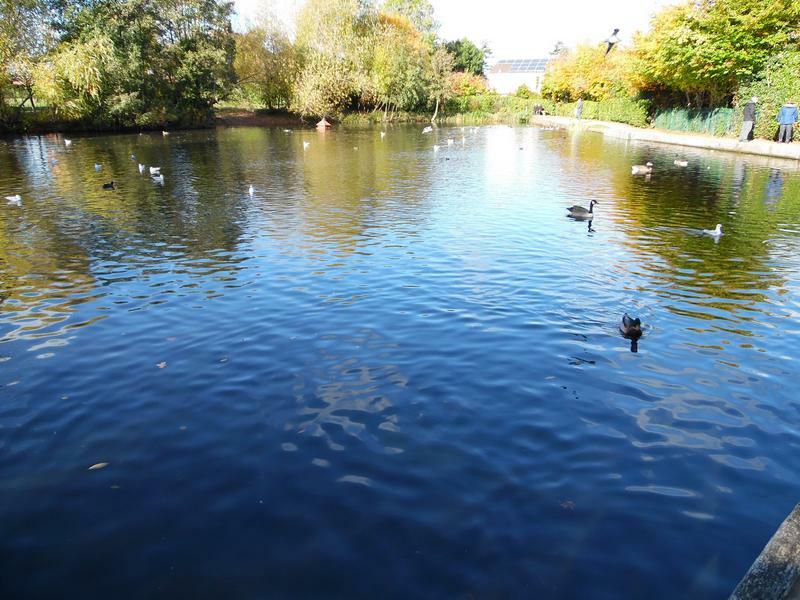 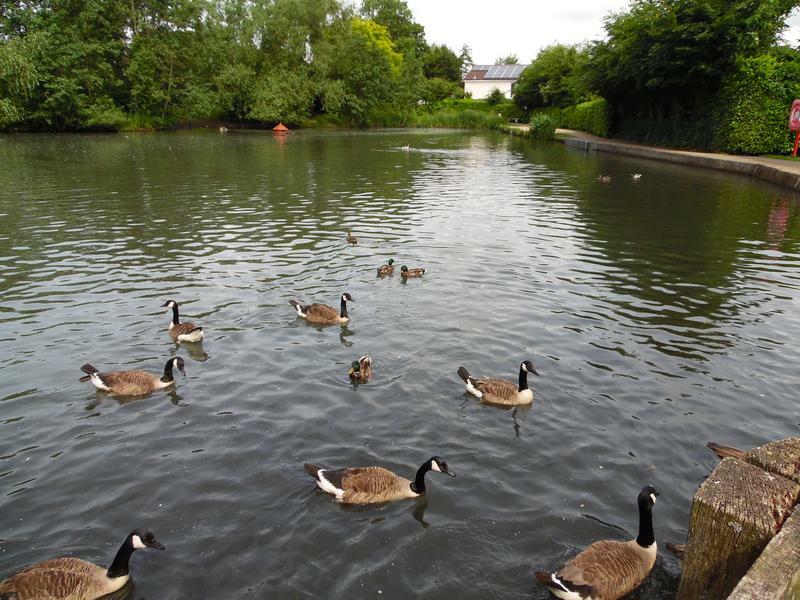 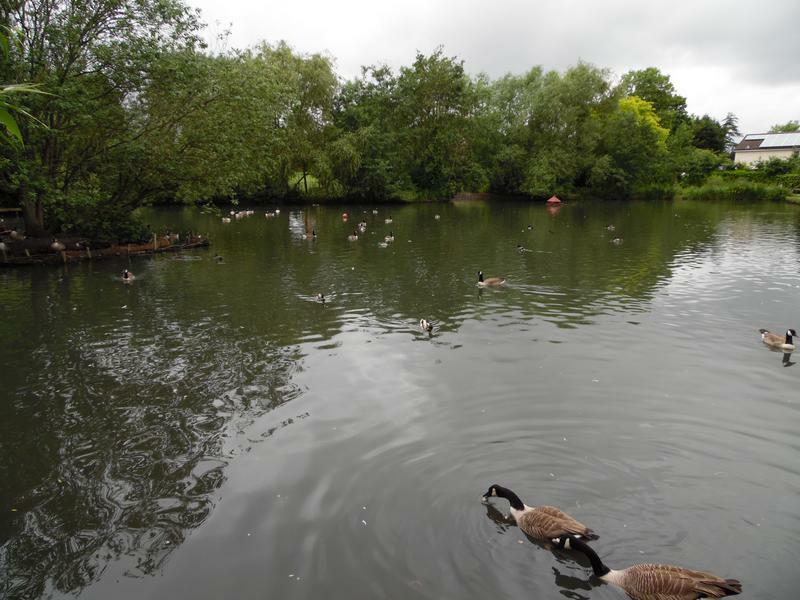 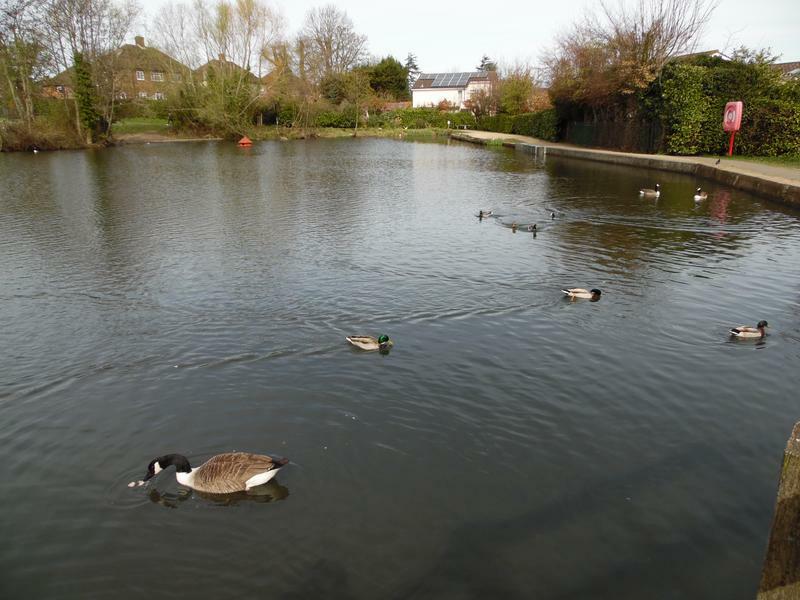 Try to feed ducks and geese near the pond edge to stop the sea gulls catching the food. 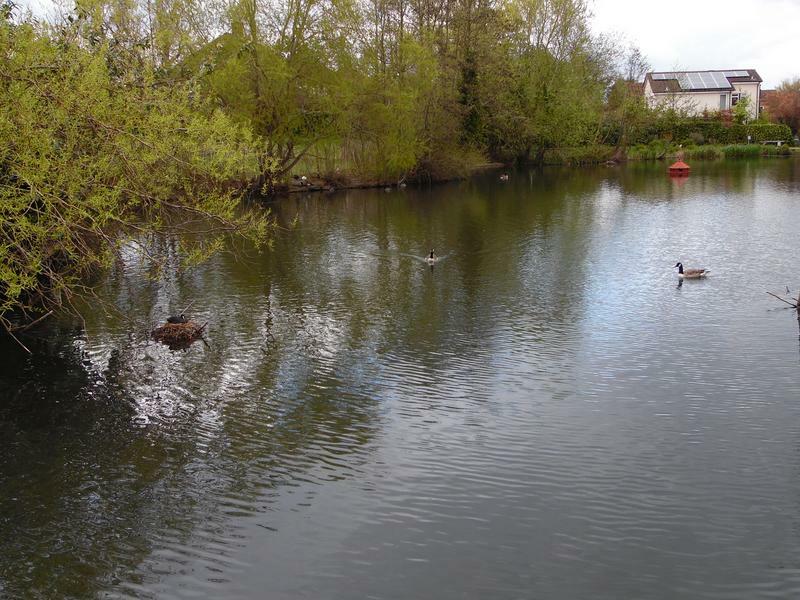 Quiet on the pond today, apart from sea gulls. 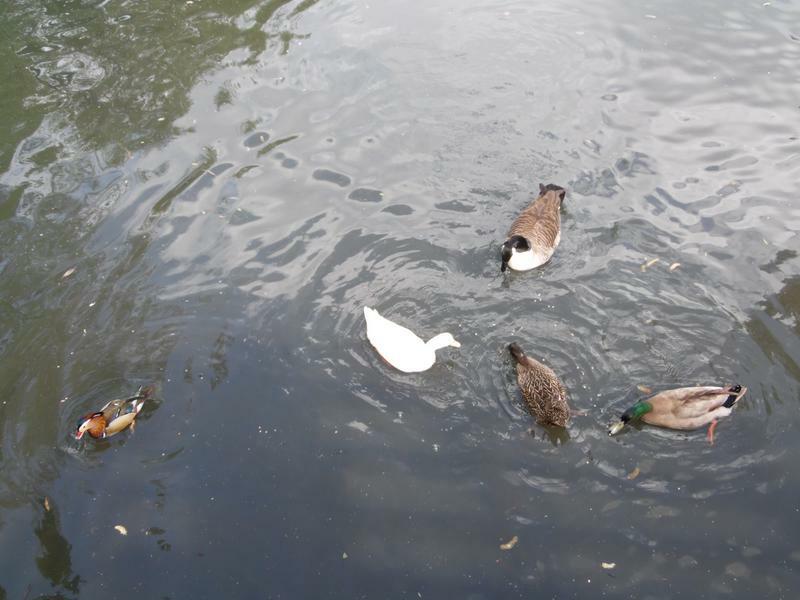 30th October 2016, the sea gulls are getting more agressive and closer. 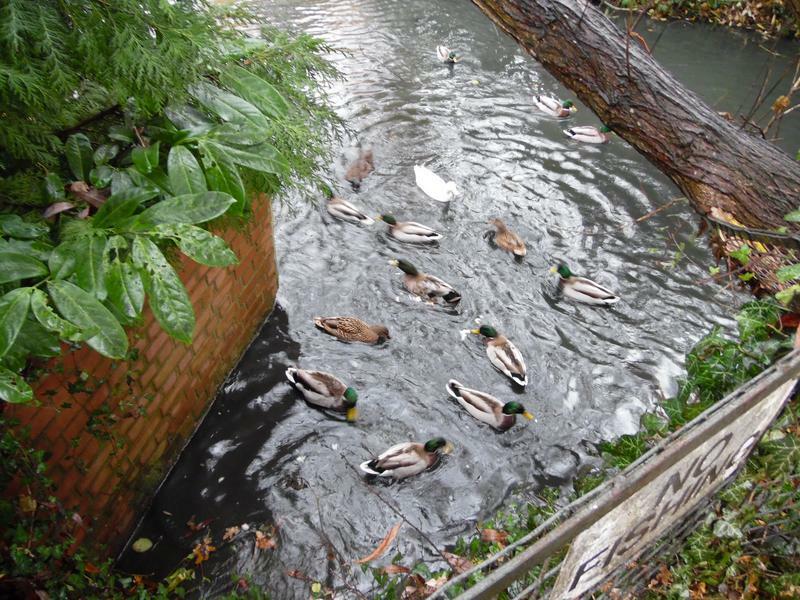 This is one of the exits from the water, the ducks climb up here. 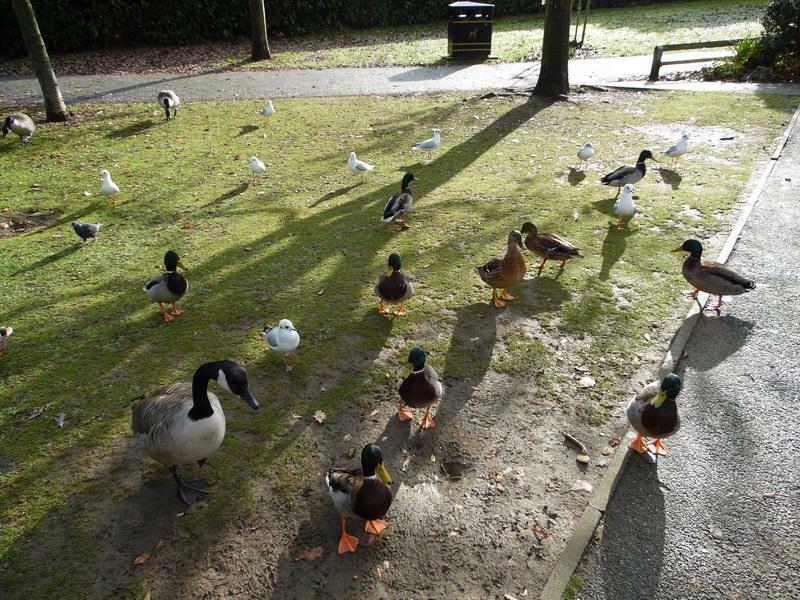 After three loaves of bread, they seem content. 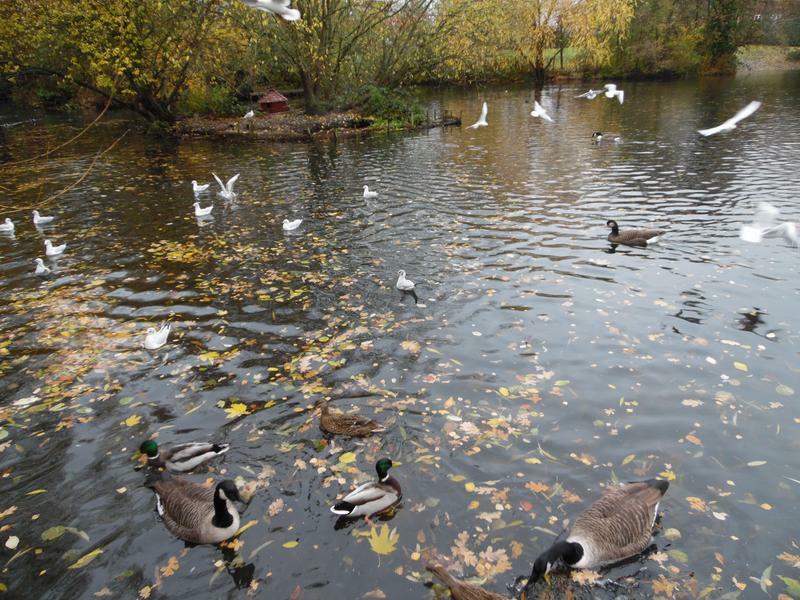 6th November 2016, it's easier to feed the ducks and geese close to the pond edge, where it's harder for sea gulls to steal food. 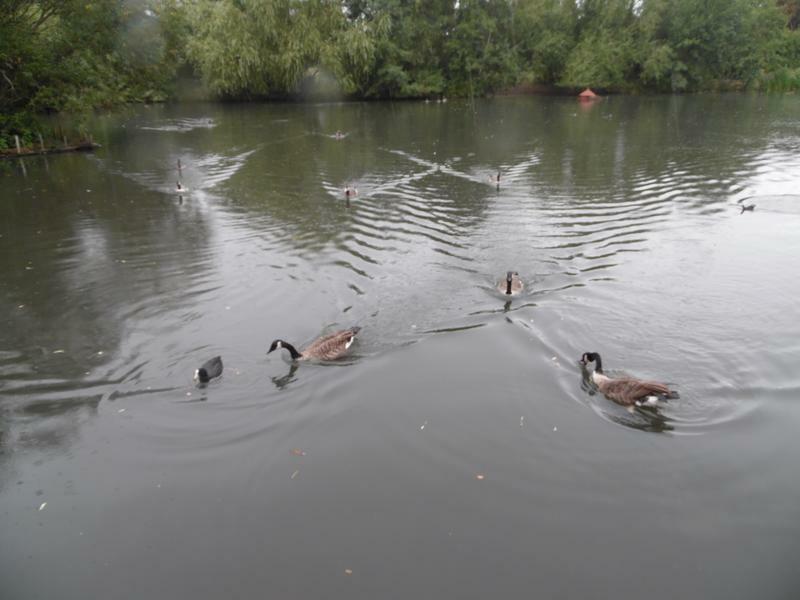 Birds spread out across the pond. 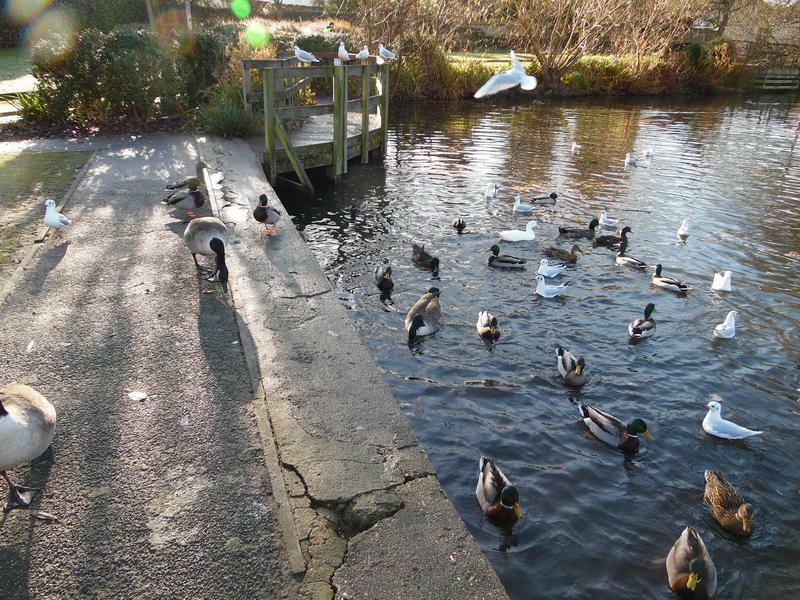 13th November 2016, lots of hungry birds jump out of the water for food. 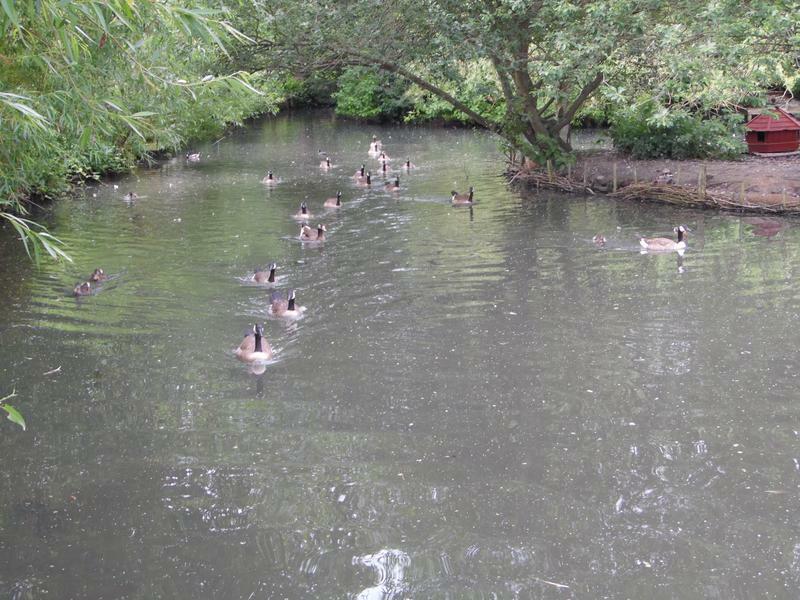 Many more ducks and geese near the small island. 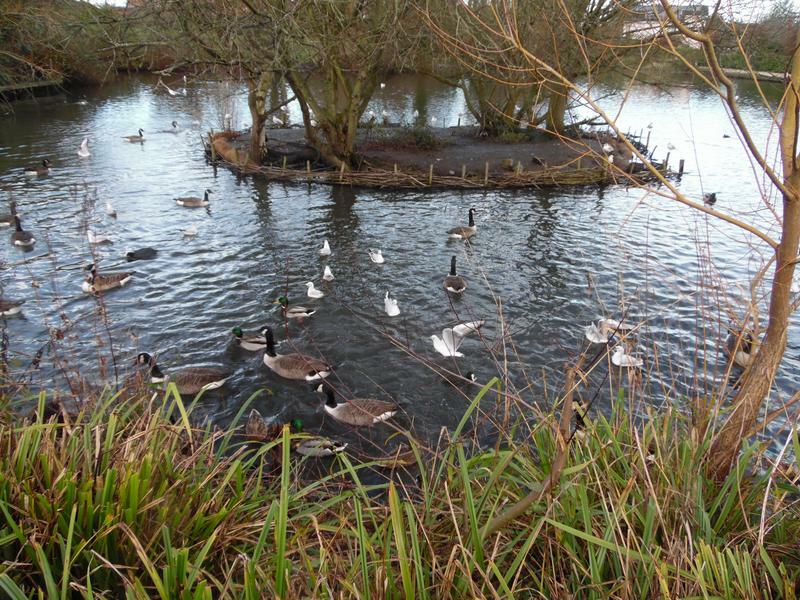 More peaceful around the large island where the sea gulls are less happy flying. 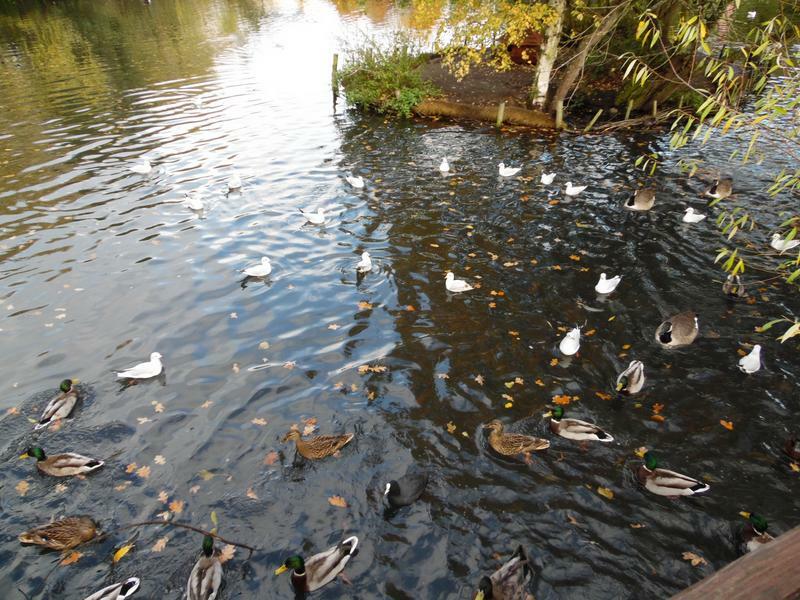 13th November 2016, auttumn is still depositing lots of leaves in the water, and lots of sea gulls. 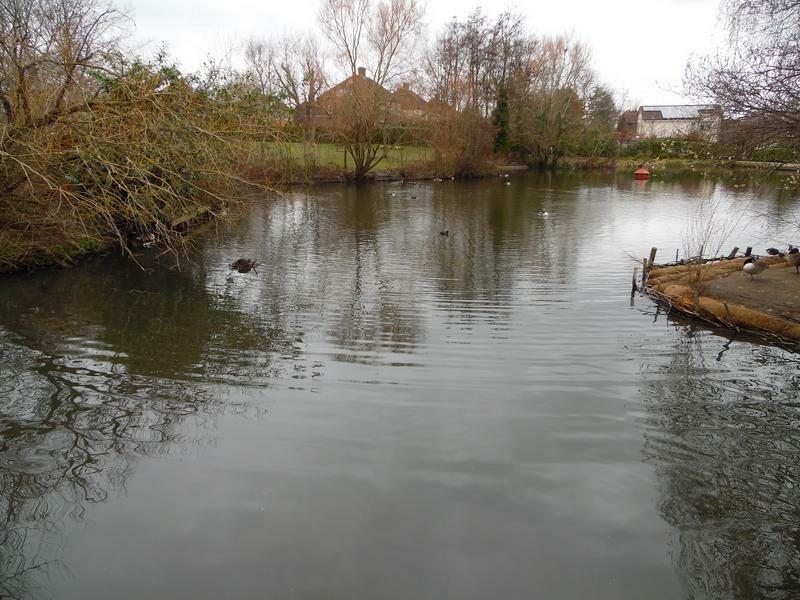 20th November 2016, again quieter around the large island. 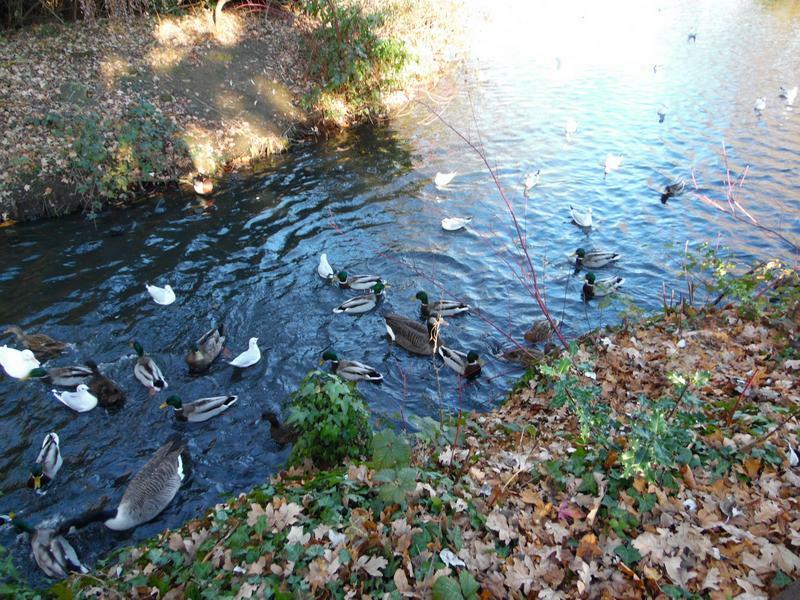 And lots of Mallards around the stream inlet to the pond. 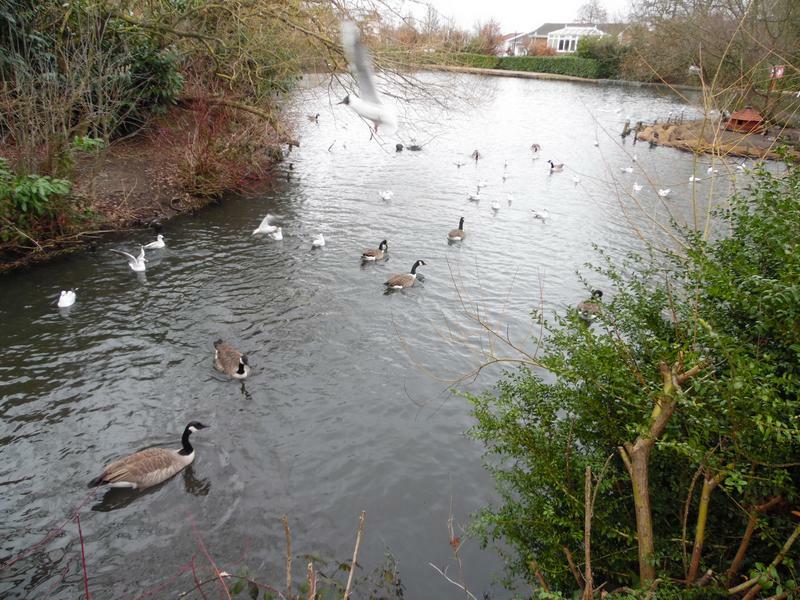 27th November 2016, hungry geese and sea gulls. 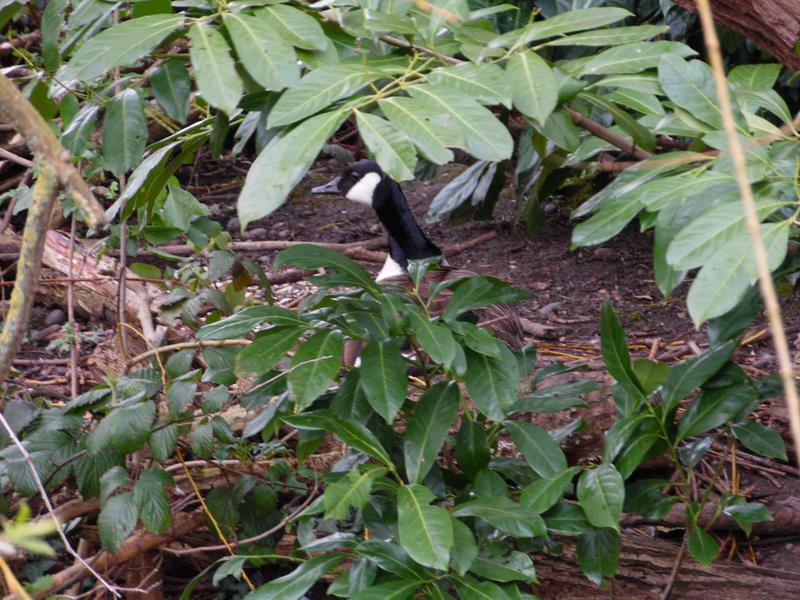 Very busy behind the large island. 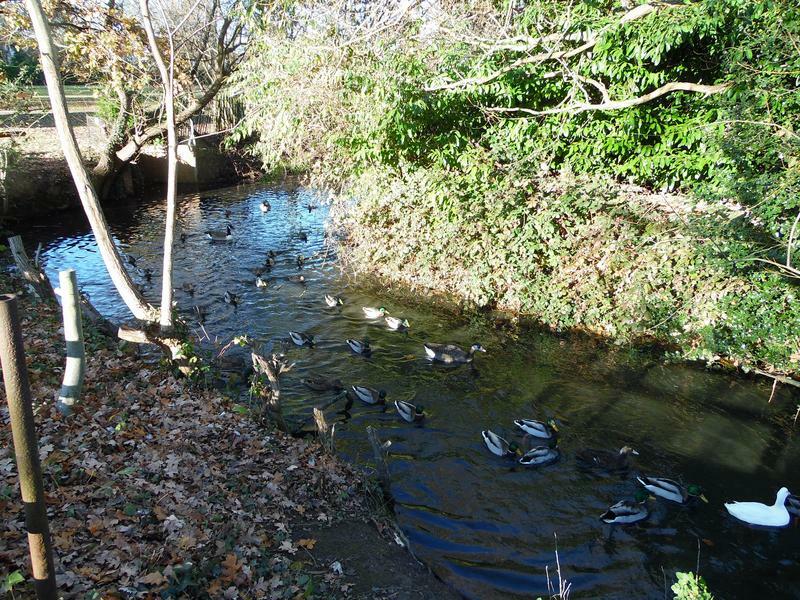 4th December 2016, still goot autumn weather. 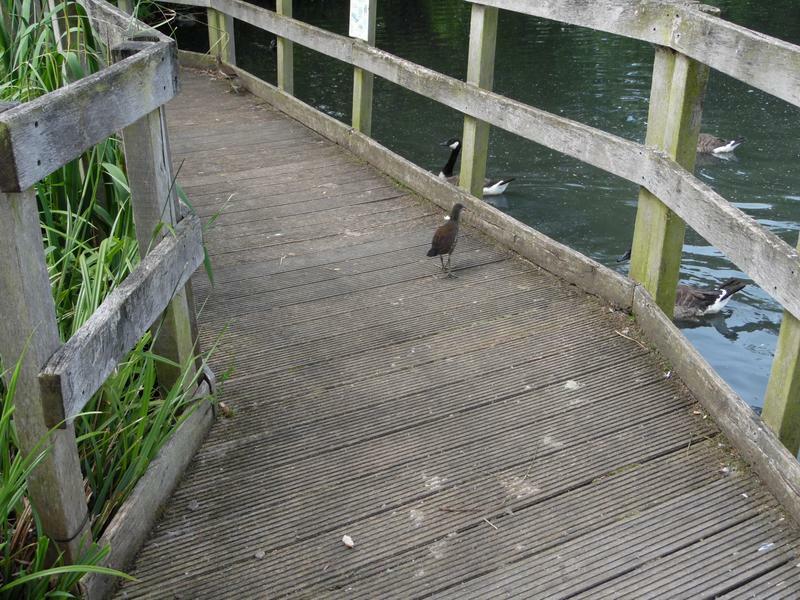 Don't often see Moorhens on this feeding jetty. 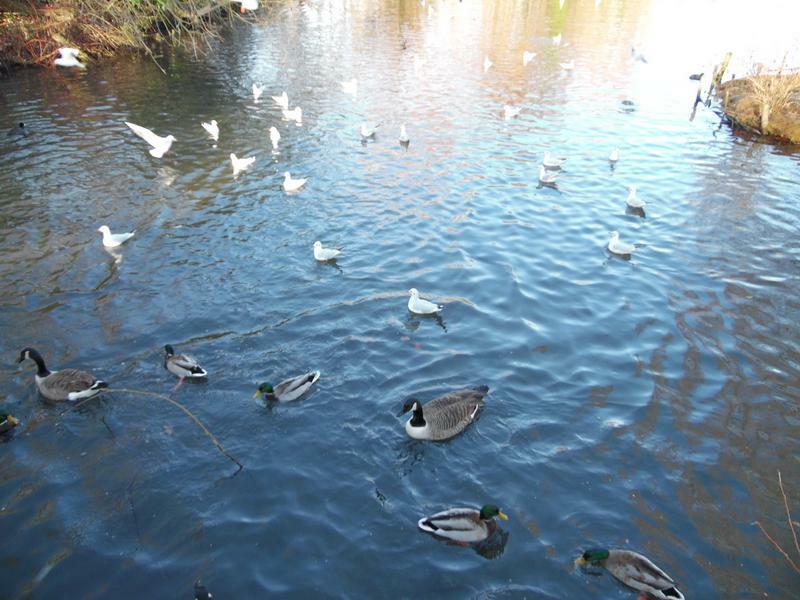 The sea gulls are starting to infiltrate the quieter areas. 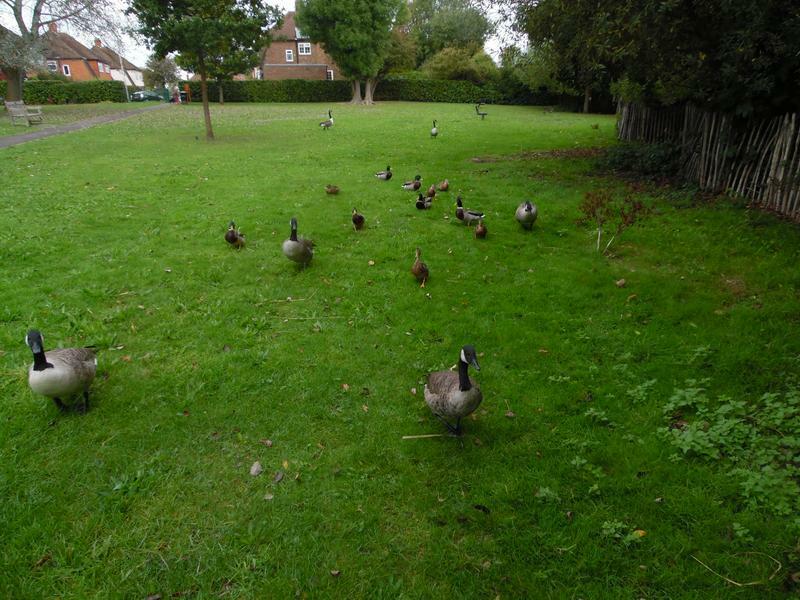 Lots of ducks and geese heading our way for food. 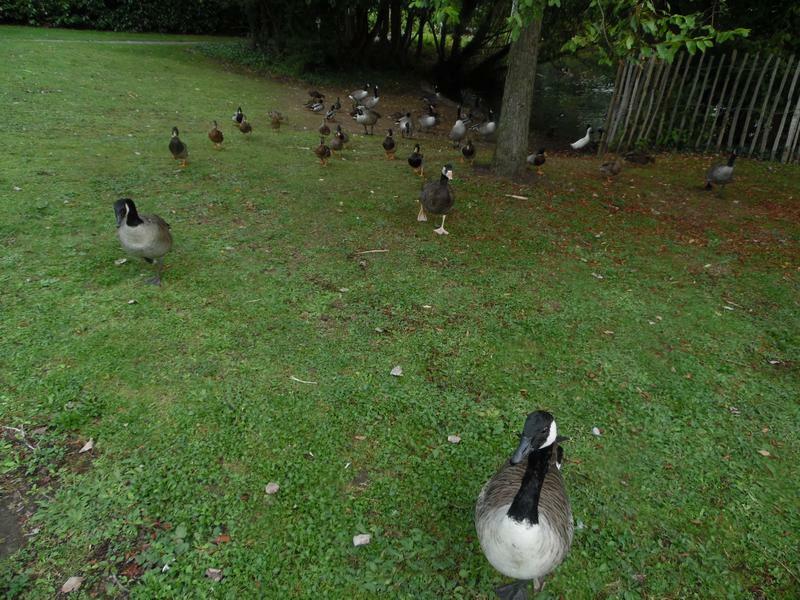 11th December 2016, again the geese are following us looking for food. 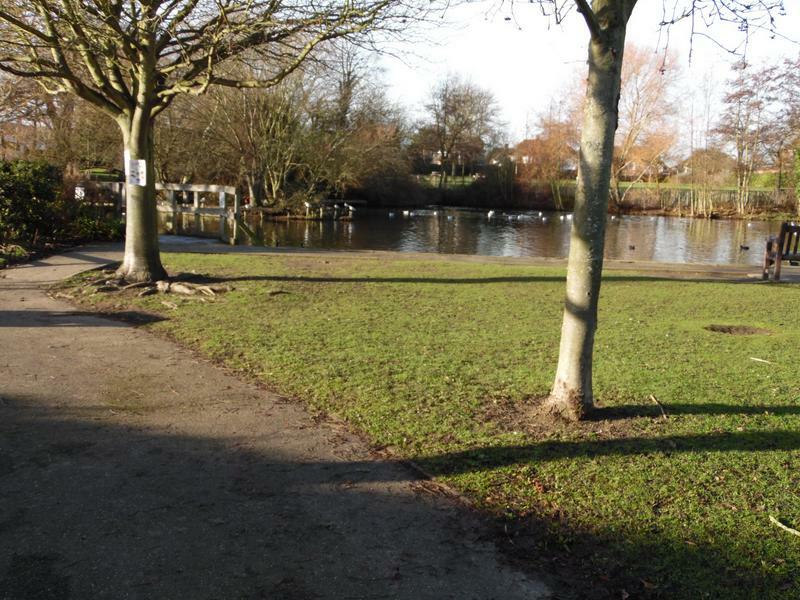 27th December 2016, view from the park gate, no birds on the grass yet, the sunny dry weather continues. 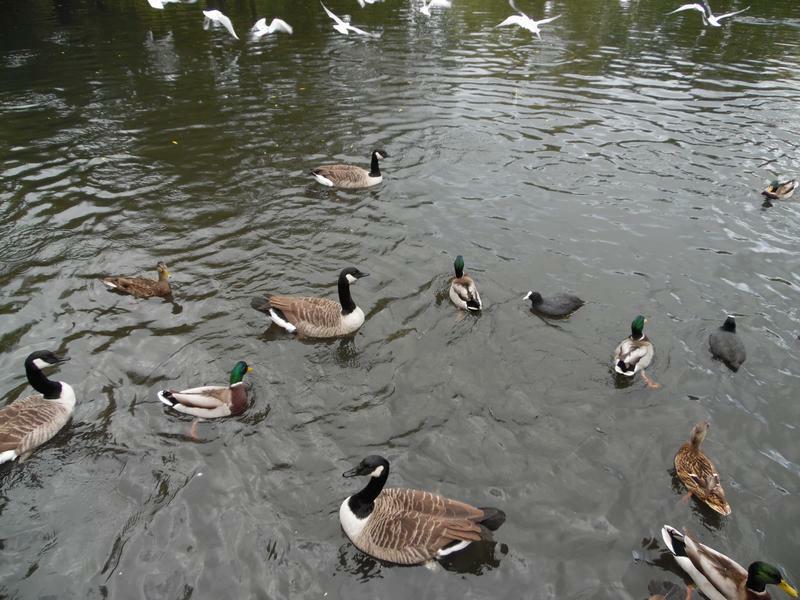 Still hard to feed the ducks and geese when the sea gulls swoop in and catch food in midair.